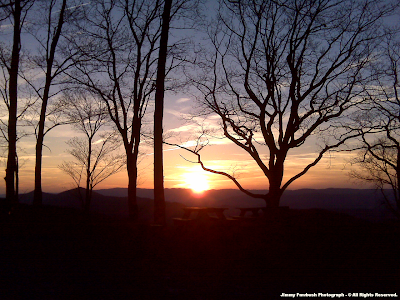 The High Knob Landform: Spring 2010 HEATS UP: Temps & Nature! Spring 2010 HEATS UP: Temps & Nature! Much like the upward rising Jet contrail above, temperatures during April have suddenly risen in the wake of a long winter! Although MUCH colder air poured into the mountains from April 8 into April 9, the pattern through the first week of April featured ( by day ) record early spring heat! 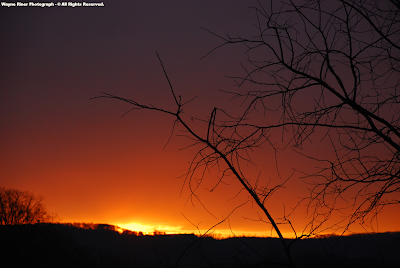 The fiery sunrises & sunsets captured so beautifully by my friend Wayne Riner have indeed been indicative of recent blazing days, which on April 2 featured a 90 degree max in Clintwood for the hottest temp ever observed so early in a year! ( HKL ) and Tennessee Valley Divide, on SSE-SW winds. Wild temperature fluctuations between night and day have been the only aspect which has kept mean April temperatures from being the hottest of all time ( e.g., on April 2 a frosty morning min of 35 degrees gave way to an incredible 55 degree rise to reach 90 in Clintwood by the afternoon! ). 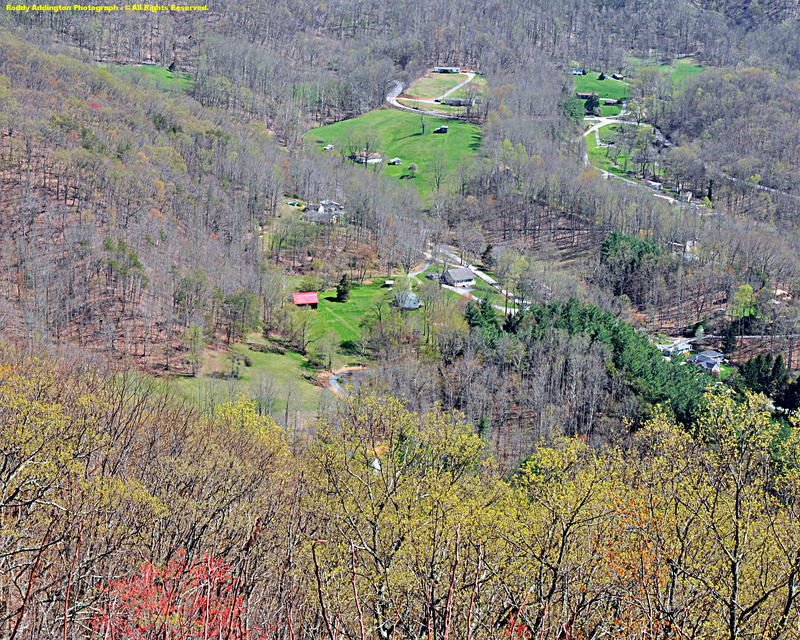 This has been especially true of mountain valleys, where average nightly lows observed during April 1-6 were 35 to 36 degrees in both Clintwood & Norton. 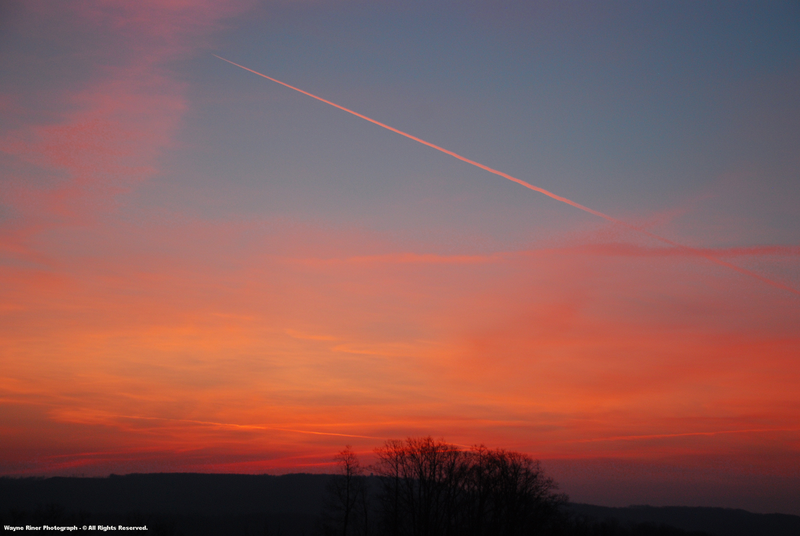 Higher elevation valleys and basins within the High Knob Massif, above 2400 feet, had average nightly mins of 30 to 35 degrees during the period. The recent climatological history of April is one full of radical weather changes, both during the same month and from year to year, as seasons battle for control of the mountain landscape. April 2-6, 1987: 2 to 4 FEET of snow depth ( drifts 10+ feet ). Gary Hampton reported 3 feet of snow depth at the Norton Water Plant, nestled amid the base of High Knob in the city, with 2 to 6 feet of depth reported by electrical engineer Carl Henderson at the Blue Ridge PBS Transmitter Station on Eagle Knob of High Knob. April 2, 1992: A nearly stationary snowstreak of blinding snow squalls buried a NW-SE corridor, from Pine Mountain through Clintwood to Sandy Ridge, with 6-12" of snow depth. More heavy snow fell across parts of the area during April 4. Both Clintwood and High Knob had 12"+ of snowfal during the month, while Wise reported just 3.4" ( in between the heavy snow bands ). 85 in Clintwood for the period ( not every day ). April 17-18, 2001: Snow. A general 3-6" across the Russell Fork Basin from Breaks Interstate Park to Clintwood, with 7-9" in upper elevations of the High Knob Massif. and 88 in Clintwood during the period. April 9-10, 2003: Upper elevation snow. Up to 6" fell at the summit level of the High Knob Massif. 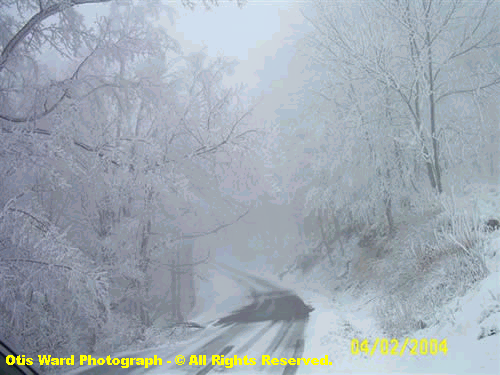 April 2, 2004: Upper elevation snowfall, with 5-10" above 3500 feet in the High Knob high country. 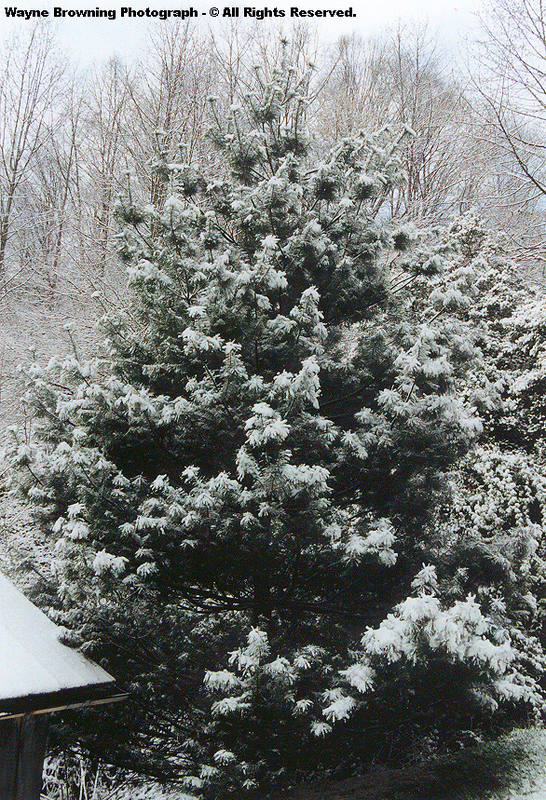 April 2, 2005: Snow. A general 1" to 4" of snow fell within the lower to middle elevations of the Clintwood to Wise corridor, with 6" to 10" above 3000 feet in the High Knob Massif. April 23-24, 2005: More Snow! 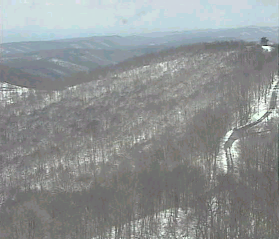 A general 2" to 4" of snow fell below 2500 feet, with 6" to 8" within upper elevations of the High Knob Massif. 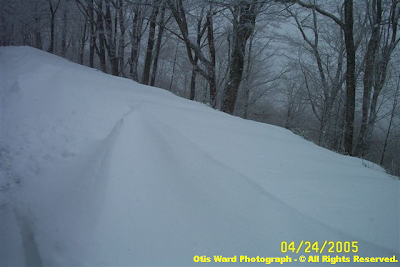 My friend Otis Ward documented snow drifts of 18" on High Knob ( visible in photograph above ). decorated the High Knob highcountry. April 6-8, 2007: Snow. A general 4" to 6" of snow accumulated within the city of Norton, with 6-10"+ across the High Knob Massif ( where drifts were measured in feet amid the highcountry ). April 10-14, 2008: Wild Ride. From a summer-like max of 83 degrees in Clintwood on April 10, the ole thermometer was hard pressed to even reach the 40 degree mark during afternoon hours of April 14. For those living in mid to upper elevations, above 2000 feet, temperatures held in wintry 30s all day long, with even some 20s at the highest elevations within the High Knob Massif. 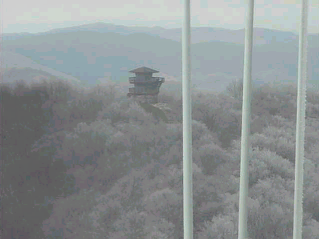 To top it off, Otis Ward submitted some gorgeously cold pictures of 3" to 4" of snow and rime blanketing upper elevations of the High Knob high country. April 6-8, 2009: Heavy snow. A total of 8.5" to 11"+ of snow fell across upper elevations within the High Knob Massif, with 3 to 4+ feet drifts reported from High Knob into portions of the Big Cherry Basin along Little Mountain. 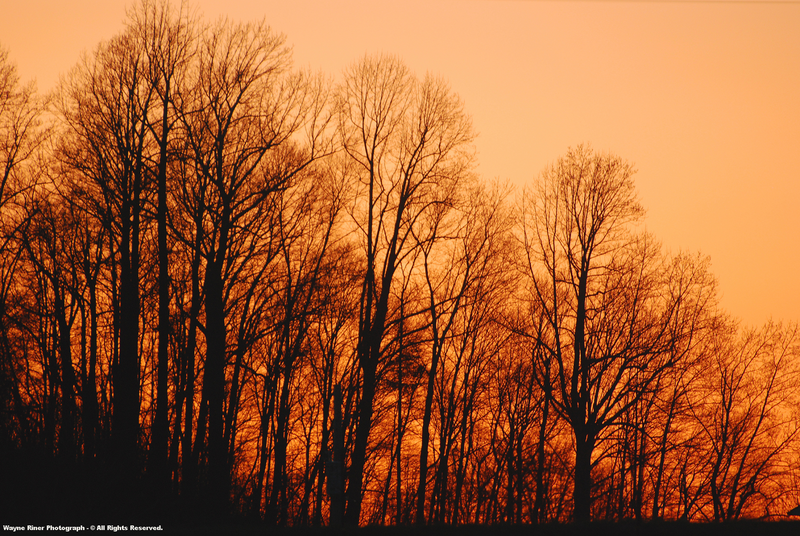 April 24-27, 2009: Longest early season heatwave on record, with 4 consecutive days featuring maxs of 88 to 89 degrees in Clintwood. 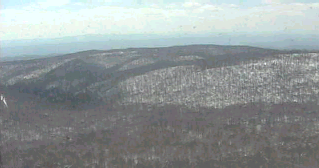 Maximums of 74 to 77 degrees were observed on Eagle Knob of High Knob during the period ( at 4178 feet ). ( such as in the image above ). [ The elevation of the U-shaped High Knob Lake Basin is 3400 to 3600 feet above sea level, amid its main cold air pooling zone ]. The coldest temperatures officially recorded on the nearby Wise Plateau, at an elevation of 2560 feet, gives one a general idea of the colder periods of the past 53 years. However, since the recording site in Wise for the above minimums was located upon a sloping hill on the campus of the University of Virginia's College in Wise ( formerly called Clinch Valley College ), one has to look at elevated sites located in valleys to obtain a feel for what the coldest April conditions have been like amid the cold air drainage basins at 2400 to 3600 feet above sea level. Zoom in closer on the above map to see elevation contours, and click on the City of Norton placemark if others read outside their white box, as it tends to re-align all boxes for reading points of interest information ( some points contain a significant amount ). Big Cherry Basin of the High Knob Massif has valley floors which range from 3120 feet above sea level, at Big Cherry Lake, to between 3200-3300 feet within its upper reaches. The location with the longest data period in southwestern Virginia is Burkes Garden, with records dating back to 1896. It is also located within a wide, upper elevation basin at 3300 feet above sea level. The minimum on the UVA Campus in Wise on April 10, 1985 was a milder 19 degrees, as the coldest conditions developed with drainage into high valleys and basins. Due to cold air drainage, many nights within the Norton to Coeburn valley corridor ( 2000 to 2200 feet ) are also significantly colder than in exposed locales at higher elevations like Lonesome Pine Airport in Wise ( 2680 feet ). Nights featuring dry air aloft which are favorable for drainage can get much colder within the higher basins and coves, lying within the 2400 to 3600 foot zone! So when frosty chill was felt into April 9 it came as no surprise, as past climatology clearly reveals it occurs every April with varying intensities ( generally the coldest conditions in high valleys & on the highest summits ). "With early spring, comes the red colors of maples getting ready to bloom while the valleys are covered in frost and fog." 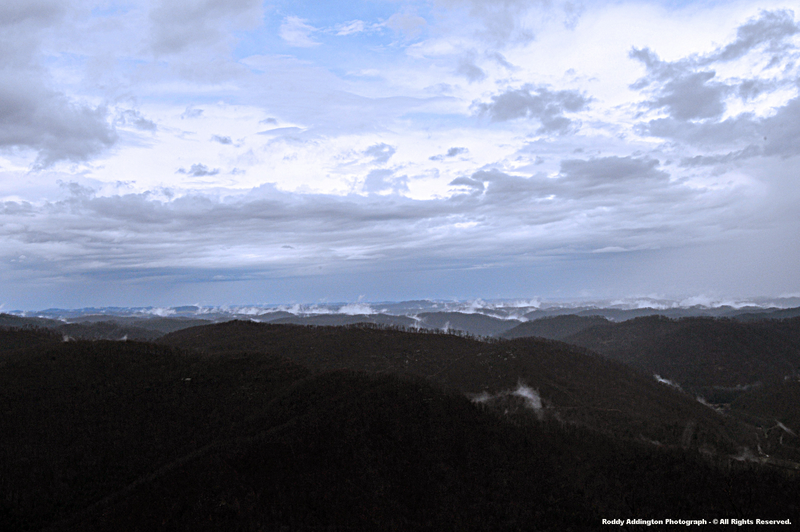 [ The above view is looking from Long Ridge ( along the Tennessee Valley Divde ) toward the majestic northeastern end of Pine Mountain, where it drops off into depths of Breaks Gorge in Breaks Interstate Park ]. While weather conditions are unpredictable from year to year, with wild swings in temperature and moisture levels over relatively short and long periods, the natural calendar of the living world conforms to these changes. It is amazingly consistent and calibrated to local conditions ( as will be later highlighted! ). Despite one missing year, the average of those 10 spring seasons produces a mean return date of April 16-17 for Clintwood ( varying between April 11-24 ). [ So +/- 7 days from April 16-17 should produce the fluty, gorgeous call of a Wood Thrush in Clintwood. The mean date of arrival likely varying somewhat with latitude ( e.g., earlier across southern portions of the Appalachians ) ]. Not bad for a bird making a return flight from Mexico to Panama, where it spends the winter season ( a 1959 mile trip from Panama City to Clintwood ). Update - Wood Thrush Returns! ( April 15 ). 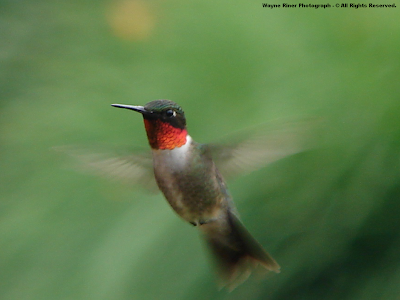 Most amazingly, this corresponded to both the first visible green jump to above the cliffs in the Head of Powell Valley ( read below ) and to the first observed Ruby-throated Hummingbird on Long Ridge by Wayne & Genevie Riner! 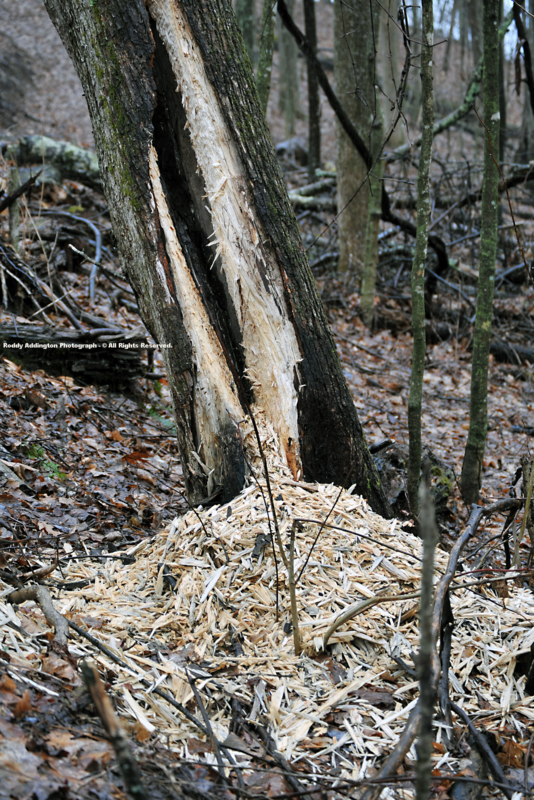 [ Weather conditions do play a factor, as the earliest return date in 2008 was associated with an early season wave of heat; although, the Wood Thrush arrived just in time for a cold blast. Bad timing, but they are tough as well as beautiful! During 2005, the latest return date during the period, weather conditions upon arrival featured a last season snowfall ( southerly flow prior to the snow event likely aided migration northward )]. 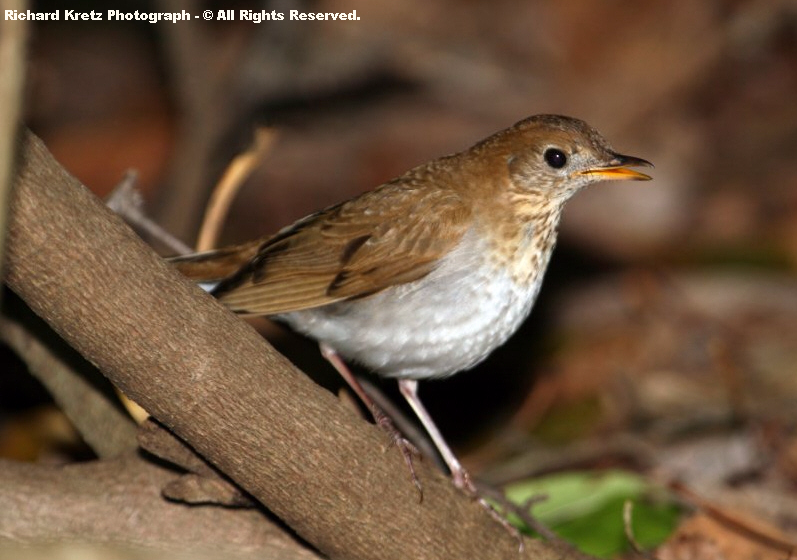 In the High Knob highcountry the dominant thrush is the Veery, with its amazing ethereal song. While I love Wood Thrushes fluty songs, Veeries are simply incredible! [ It is interesting to note that Veeries off-territory during spring migration tend to sing muted, low songs. My nature journal records a Veery Thrush singing in a low voice on May 5 and May 7 of 2009 near Clintwood, with a similar encounter in May 2003. 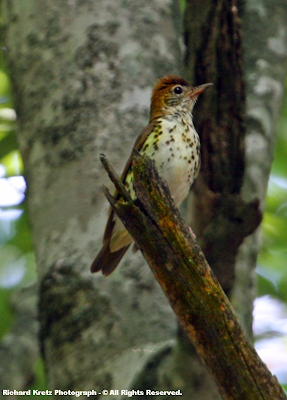 By contrast, Veeries on their home territory echo loudly across the lofty High Knob Lake Basin during May & June, as well as amid cold air drainages where Mixed-Mesophytic Northern Hardwoods finger downward from endemic Southern Appalachian Northern woods above 3300 feet ]. Swainsons Thrush ( Catharus ustulatus ) can also be heard during summer in the High Knob Massif at times, with Hermit Thrushes ( Catharus guttatus ) being common during the cold season. The above view looking at the 2000 vertical feet of plunge off Grindstone Dome, within only 0.8 mile, is one of the greatest short distance elevation changes west of the Blue Ridge in all of the Appalachians. Another interesting local aspect documented by my friends Elizabeth & Addison Stallard, within the head of Powell Valley of Wise County, is the time each year when the first "green" becomes visible at the top of the great band of calcareous cliffs ringing the Valley Head ( they mean the first hint of green leaves! ). Amazingly, these dates are very close many years to the return of the Wood Thrush ( as noted above in Clintwood ), the mean of the first visible green being April 14. With this comes the unofficial arrival of "spring" in Wise County, even though snow more often than not falls beyond this time atop the highcountry! The first visible green jump to above the great cliffs within the Head of Powell Valley of the High Knob Massif was reported by my friends Elizabeth & Addison Stallard this morning ( April 15 ). budding species like maples ). So against all odds, and this crazy April weather pattern of dryness plus wild AM to PM temperature swings, the natural world is pretty much running on its expected, longer-term schedule! It is, of course, a long time before the High Knob highcountry greens up completely, with leaves typically not reaching summer maturity at upper elevations until late May into early June ( even mid-late June during some years like 2005 ). 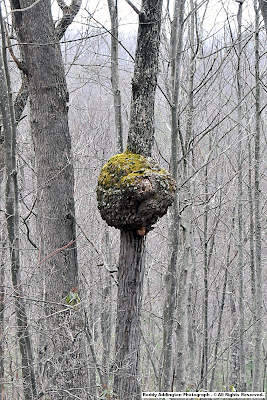 This photograph illustrates the status of foliage amid Benges Basin of the High Knob Massif on May 23, 2006. 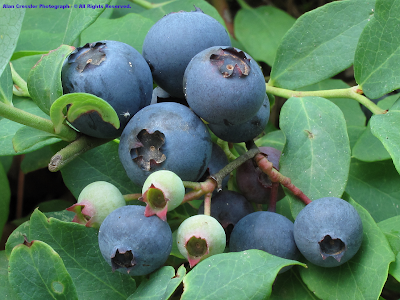 This date being chosen since tree leaves at most all lower elevations in the surrounding region reach the dark green of summer maturity by, or locally well before, May 20 each year. One absolute certainty within the natural calendar is that low elevations will green up and reach summer maturity before high elevations, with only a few notable exceptions. The main exception to this golden rule being the "thermal belt" zone, where nights tend to be much warmer and spring frost and sub-freezing temperatures less common than within cold air drainages of valleys below and the higher terrain above ( if higher terrain is locally present above the thermal belt ). Every region on Earth with topographical variations in elevation tends to have a thermal belt zone. In Wise & Dickenson counties it resides within middle elevations, between 2000 and 3000 feet, along slopes and on exposed ridges & plateaus. It was learned by pioneers, and thus became favored sites for orchards and other frost sensitive crops. So while the synchrony of the Natural World is incredible, there are significant local and regional variations which are forced by the interactions among geology, topography, and climate. An Unlikely But Perfect Union! Without understanding what the High Knob Landform ( HKL ) is, one would not consider that High Knob and Pine Mountain have intimate connections, such that neither would likely be without the other ( incredible, but so true )! 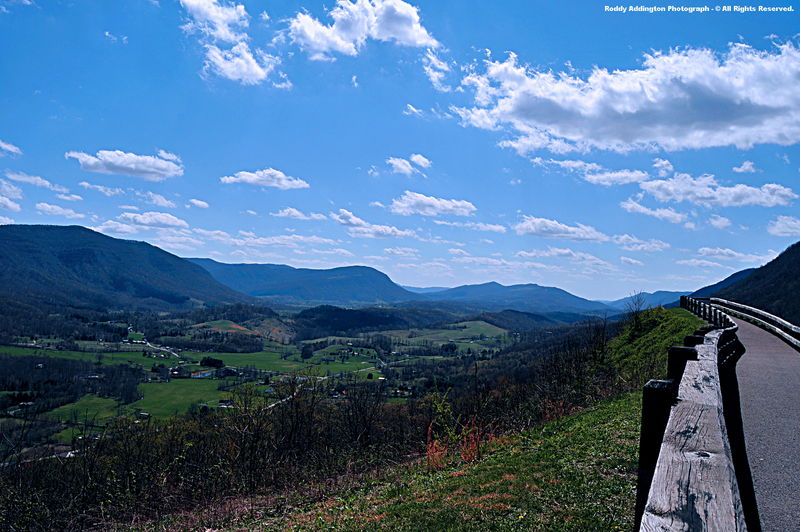 One is a long, linear ridge that rarely rises above 3000 feet, while the other ( High Knob ) is a sprawling mass of elevated highcountry. However, as this website has shown, there is much more here than meets the eye! [ This entire subject being filled with IRONY since many through past decades, and before, believed that the mountain running southwest from Breaks Interstate Park was the same one which held the famous Cumberland Gap. In reality, the two are not the same mountain ridge but do, indeed, possess amazing physical connections that go far beyond them merely having parallel gateways to the great American West! 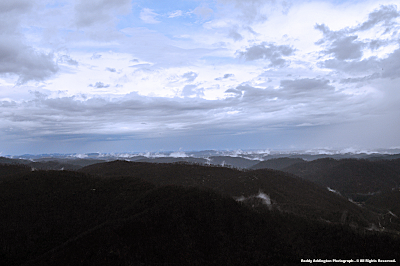 To top it off literally, the crest of the southwestern horizon seen from Clinchfield Overlook and the balcony of Rhododendron Lodge in Breaks Park is the High Knob Massif ( more than 30 air miles away ). 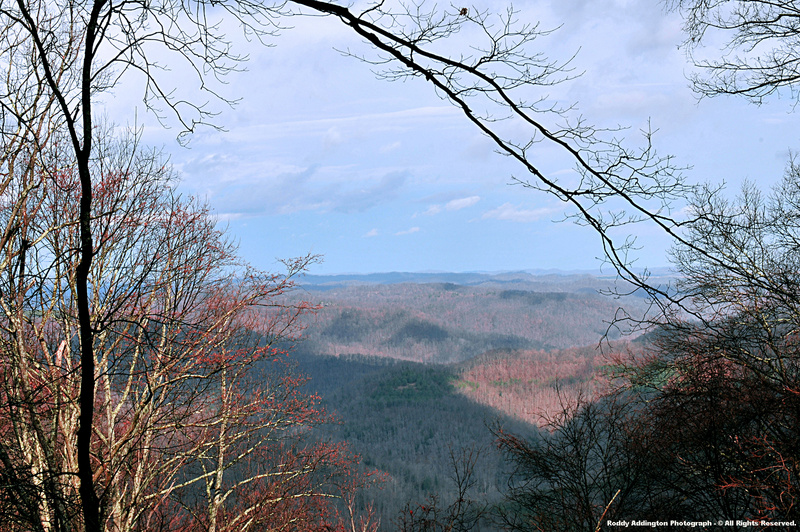 It also caps the horizon upon looking across the great Skegg Wall atop Pine Mountain ( an amazing location ) ]. 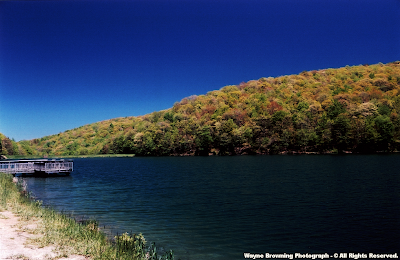 Resting 42 air miles southwest of Breaks Gorge, on Pine Mountain, is Kingdom Come State Park. Kingdom Come State Park ]. Majestic Kingdom Come is the highest state park in Kentucky with elevations that generally vary between 1650 & 2800 feet above sea level. 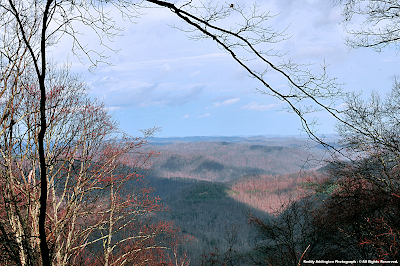 [ Mayking Peak of Pine Mountain, the highest designated peak along its 125 mile length, reaches 3273 feet above sea level to the southeast of Whitesburg, Kentucky. Most interesting, that is 35 feet lower in elevation than the water level of the Upper Norton Reservoir shown previously ]. 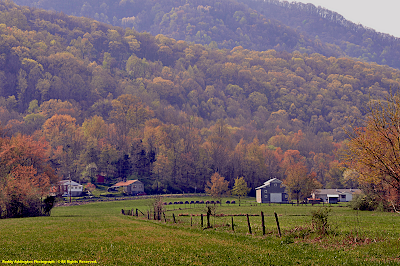 Although there was not much green up of trees during March, anyone traveling frequently between Kentucky and Virginia can not help but notice the often significant differences during autumn and spring ( with color peaks during fall being later, and green up during spring earlier, than on the Virginia side of the stateline...especially verses the High Knob highcountry ). ( mostly along Pine Mountain & Black Mountain ) sitting above 2000 feet. Implications of these elevation differences are huge, with temps recorded during the month of March 2010 being illustrative ( * ). [ The Jackson, Ky., NWSFO weather station sits near the top of Sugar Camp Mountain, more than 600 vertical feet above the valley floor. It is within the Kentucky foothills, amid their local thermal belt where nights are often milder than adjacent valleys ]. In the High Knob highcountry, March 2010 temps varied from low-mid 40s by day to low-mid 20s by night within topographic settings ( ridge-valley ) analogous to the above chosen points. Average night-time temperatures during March within the High Knob Massif were similar to those observed during the months of January and February at both Jackson & London, Ky., thus its easier to understand how spring rebirth can come a month or two earlier to the Kentucky foothills! [ I have always found the above fascinating and it was one of the major aspects which pushed me into climate & biodiversity research. 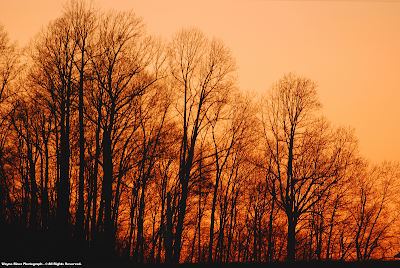 Temperature differences during some evenings and nights are absolutely incredible between higher elevation valleys, like noted earlier within the High Knob highcountry, Norton, and Clintwood, verses locations within the Kentucky foothills. These often amazing temperature variations occur throughout the year, during all seasons, and impact all life forms ( they adjust the Natural Calendar to local times )! ]. ( 18 cooler at Clintwood 1 W ) verses the Kentucky foothills. Merely a typical evening, with the most ideal settings featuring larger temperature extremes! [ Update at 2:00 AM April 13...Current temps vary from upper 30s to lower 40s within lofty valleys of the High Knob Massif ( as well as Norton-Coeburn Valley & Clintwood ) to low-mid 60s along the exposed foothills of eastern Kentucky ( max differences of 25 to 30 degrees Fahrenheit )]. 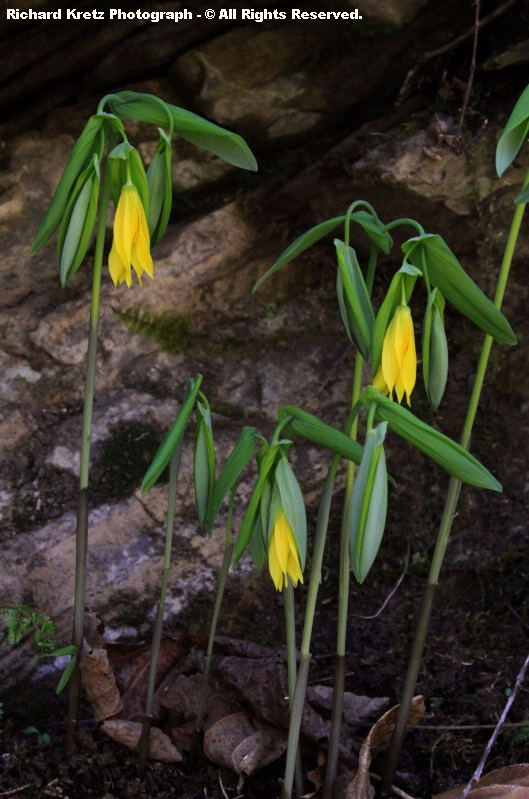 That the area is blessed with a large vertical range in elevation means that, just like in autumn, multiple peaks in spring flowering can be caught if one wishes to work their way upward in elevation over time ( * ). Starting amid the lowlands of the Kentucky foothills, and lower reaches of the Clinch & Powell River watersheds, one may work upward through middle into upper elevations to catch multiple peaks in spring renewal. [ While this journey will be associated with different species and natural communities along the way, it is still all part of the same, grand process of spring renewal ]. Truly a most wondrous aspect of our mountain region, that is played out once more during the autumn season, only in reverse, as colors peak in upper elevations and work downward over time into middle and lower terrain locations! 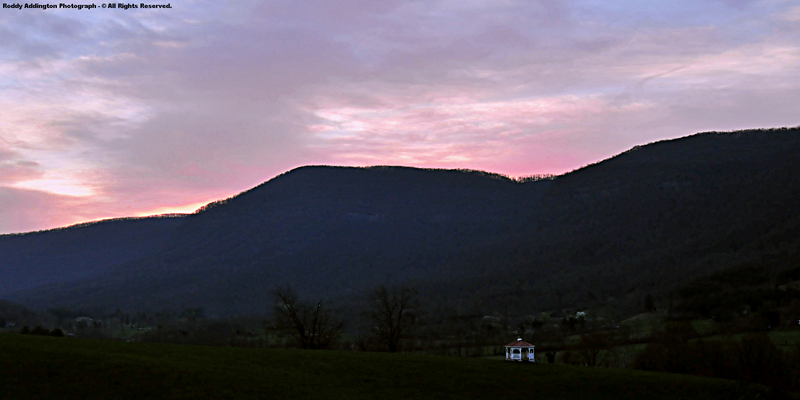 *Elevations vary by more than 3600 vertical feet between the summit level of the High Knob Massif and lower valleys within the Kentucky foothills. ( Leucobryum sp. ) and a unidentified species of lichen ]. 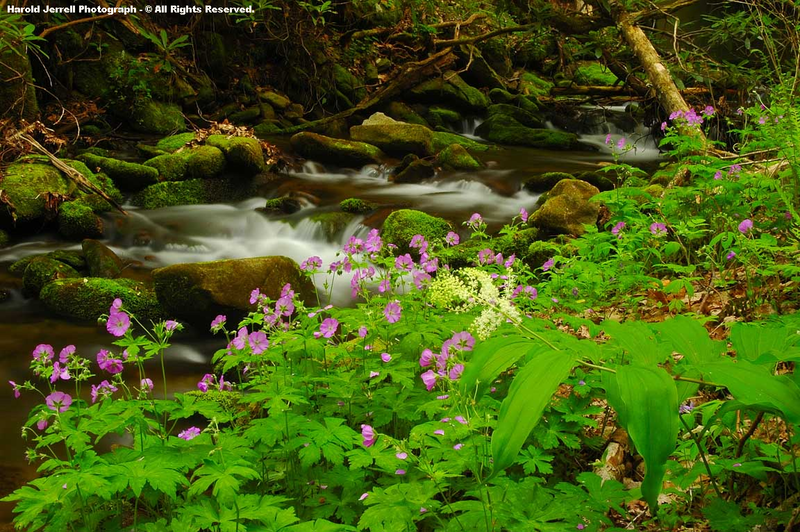 ( to Jellico Mountain along I-75 and the Clear Fork Valley ), and it is the greatest contiguous assemblege of biodiversity remaining in the state of Kentucky. 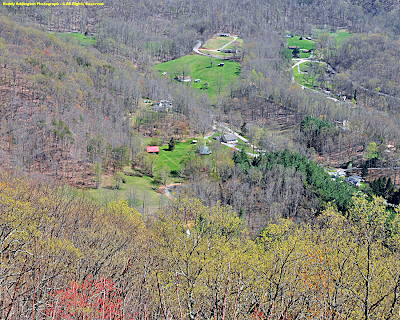 Pine Mountain is highlighted on this website since it possesses an intimate connection to the High Knob Landform, being the second major anticline of the Cumberland Mountain Overthrust Block to the Powell Valley Anticline ( of the HKL ). Geologically, Pine Mountain is a mirror image of the northwest flank of the High Knob Landform, from Cumberland to Little Stone Mountain, and like it is a high conservation priority ( that needs to be recognized along with the remnant massif of High Knob ). Elk bulls scrape to both mark their territory and to get the fresh velvet off their racks. In this case, it appears the bull is sending out a strong signal to any rival males to, "stay away from my ladies!" [ North American Elk have returned to stay, regardless of whether one believes it to be good or bad, with numerous animals spreading outward from eastern Kentucky into southwestern Virginia during recent years ( to include a likely pregnant female on the Browning Farm ) ]. ( collectively, these are among the most rugged mountain arms found in the Appalachians. ). 1 ). It is the northwestern most mountain ridge of the Cumberland Mountain Overthrust Block & southern Appalachians ( and largest mountain in Kentucky by volume ). 2 ). It is the first mountain of its kind encountered by air flowing into the area from the west & northwest. 3 ). 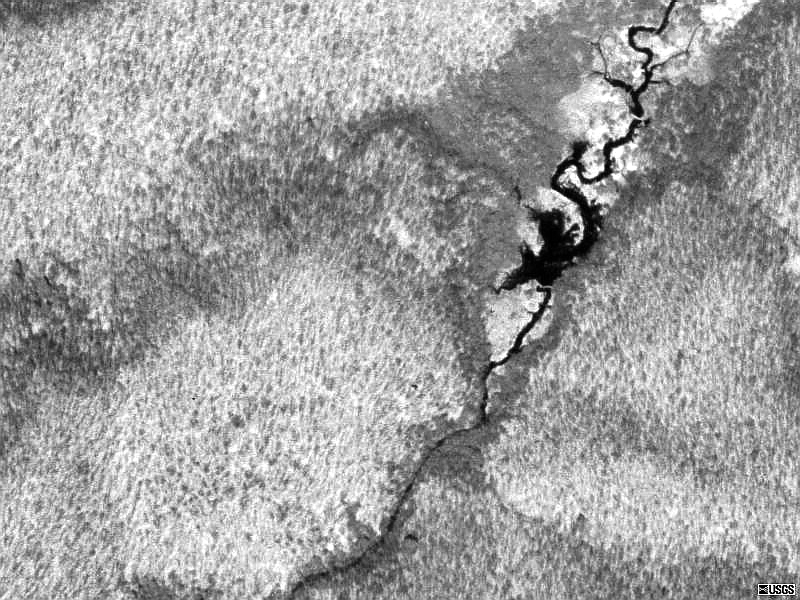 It is a geological fault scarp, the trace of which is amazingly linear along its entire 125 air mile length. 4 ). 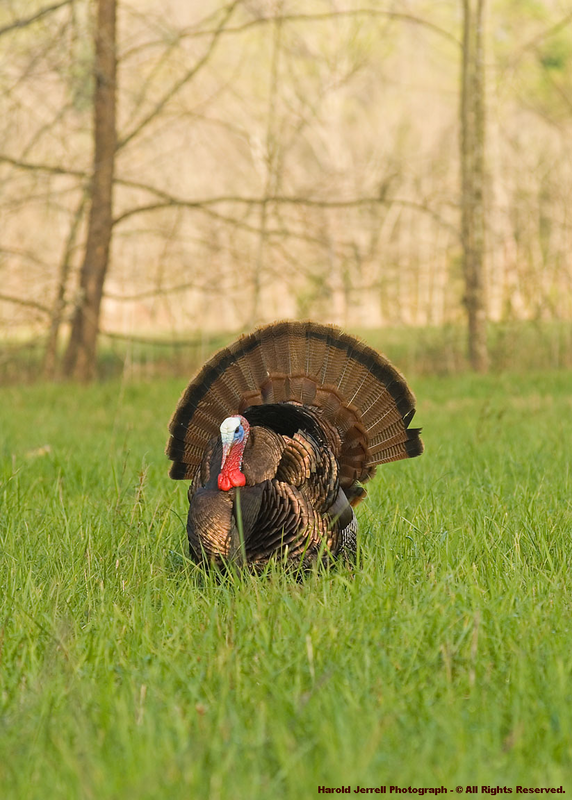 Despite its relatively low elevation, it contains numerous northern species of flora & fauna which are rare in Kentucky, and represents the greatest contiguous assemblage of biodiversity in the Bluegrass State. 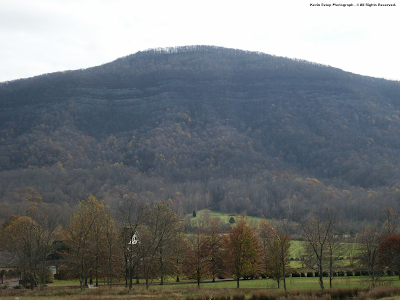 The High Knob Landform and Pine Mountain are physically connected by the same rock stratas below ground, and are joined above ground by transfers of energy that ripple through the fluid atmosphere between the two ( visible as orographic gravity waves on many occasions ). Theirs is a truly unique union in space & time! [ Rock stratas capping the High Knob highcountry dip steeply beneath the ground along its northwestern flank to then reappear once more, miles to the northwest, across the northwest slopes and crestline of Pine Mountain ]. Wildflowers throughout the following section have been grouped alphabetically by common name for families, with individual species listed alphabetically by scientific name within families after any pictured specimens ( which are shown for illustration of a particular family & representative member(s) ). A section highlighting complex families forms a large portion of this presentation. 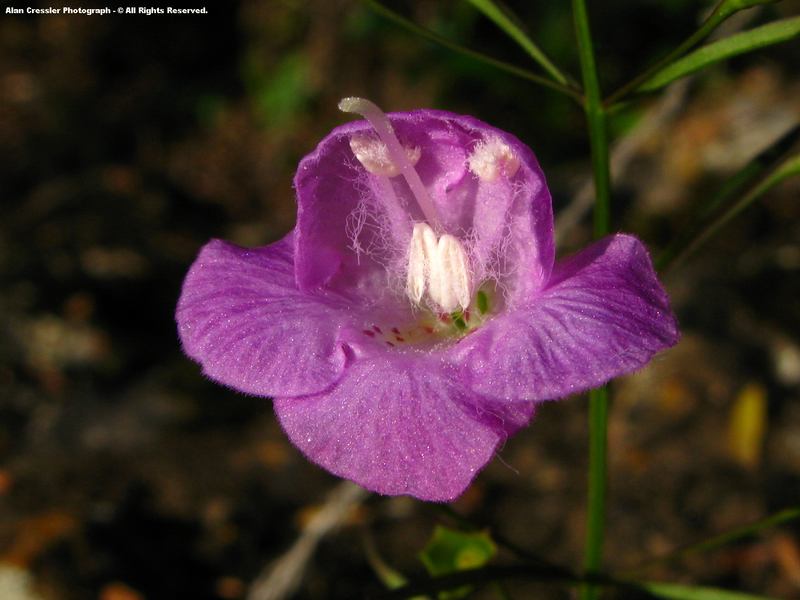 [ Wildflower families would typically be alphabetized by scientific names, but for this general usage have been listed in order of more familiar, common names ]. 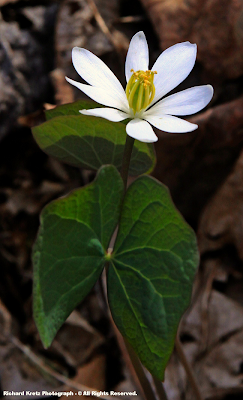 [ Instead of just Bloodroot appearing alone, as it often does at the very beginning of spring rebirth, it is now being joined by many other species such as the Common Chickweed seen above ]. Unseasonably warm days through the first week of April have accelerated the growth of new species, especially across lower elevations of the mountain region. 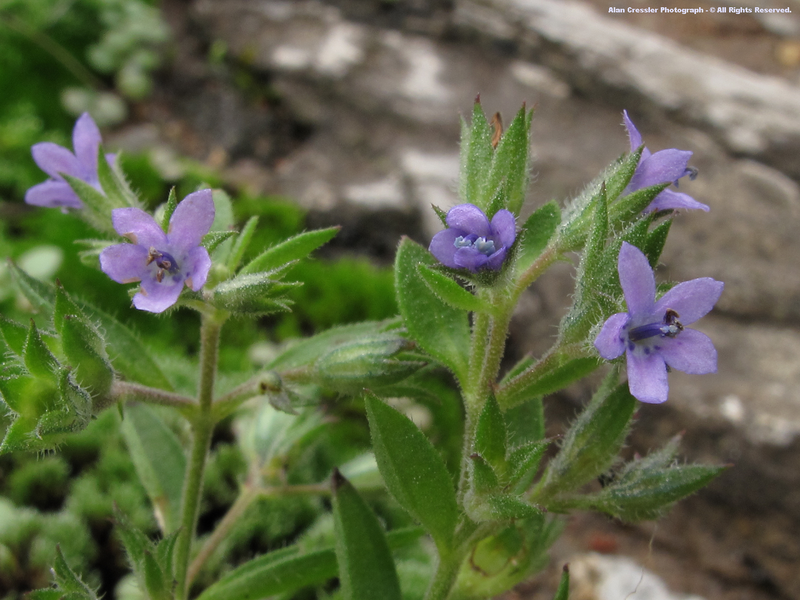 While many of the species presented in this section can be seen during the April-May period, some listed come into bloom later in the year ( but have been included with their famiy group, if they are a resident species of this truly magnificent mountain landscape ). NOTE: The following is only a partial listing of species. [ Look for additions to this section in future months ]. 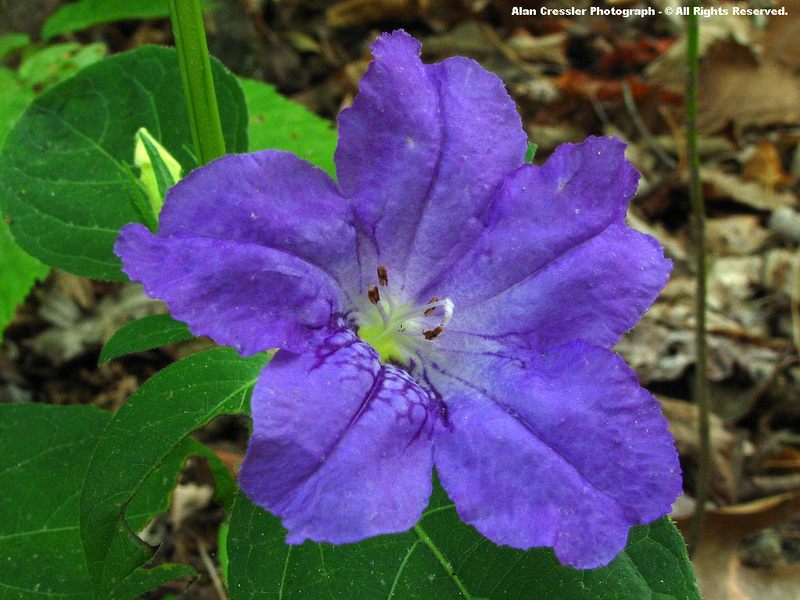 Carolina Wild Petunia is a beautiful perennial wildflower which often begins its blooming during May. While listed as endangered in New Jersey, and likely extirpated from Pennsylvania, it is not nearly as rare as some which grow within the counties of the High Knob Landform. Fringeleaf Wild Petunia has only been officially listed within ten Virginia counties. 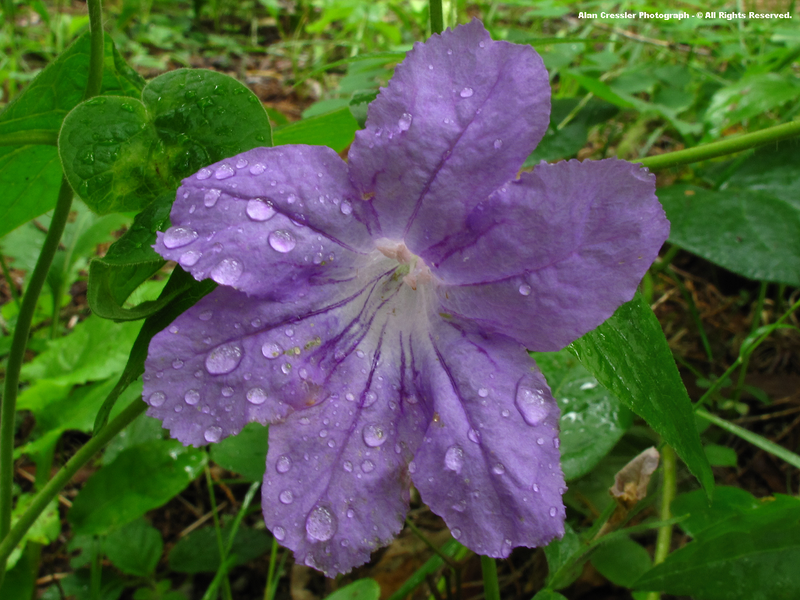 It is endangered within Maryland, Pennslyvania, and the state of Wisconsin, as well as threatened in North Carolina and Michigan. 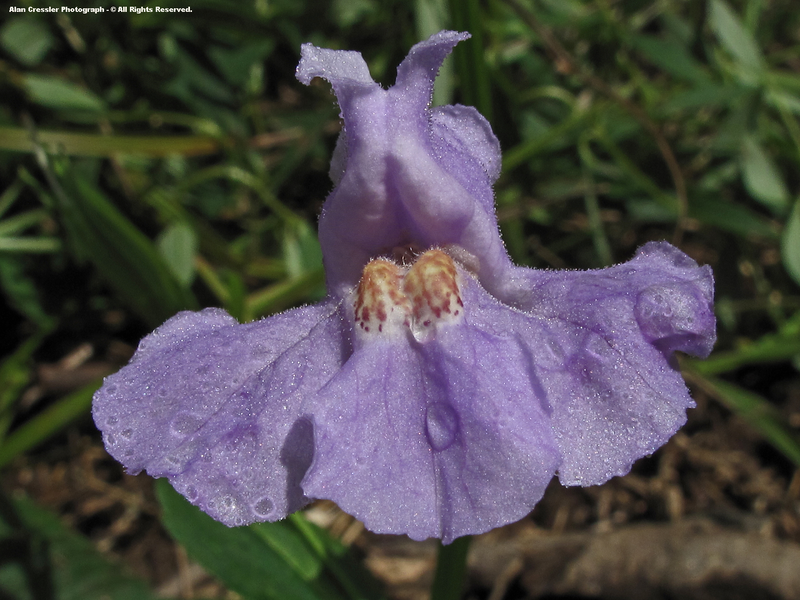 Limestone Wild Petunia, as its name implies, is a lover of rich soils which have developed over time from calcareous rock stratas. It is rarely discovered in nature outside of such favored settings, being most common, of course, within the Virginia karst belt. ( Ruellia purshiana ) . False Aloe, also sometimes called American Aloe, has only been documented within Lee County of the High Knob Landform in Virginia. 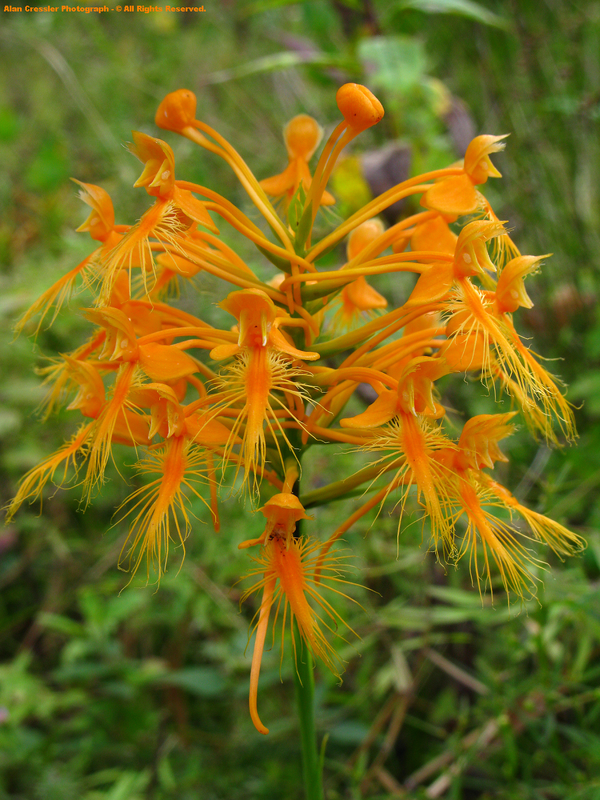 Its unusual blooms appear from late spring into summer. [ False Aloe is a very rare and imperiled species within Virginia ]. Adam's Needle ( Yucca filamentosa ) is another member of the Agave Family ( Agavaceae ), with both native and introduced species. Those native to the High Knob Landform are found within its great calcareous cliffs and barrens. Jack-In-The-Pulpit is the most famous member of the interesting Arum Family with a couple of different variations ( at least ). The most common woodland variety is subspecies triphyllum, variation stewardsonii having more fluted spathes and a preference for wetlands ( reference Digital Atlas of the Virginia Flora ). 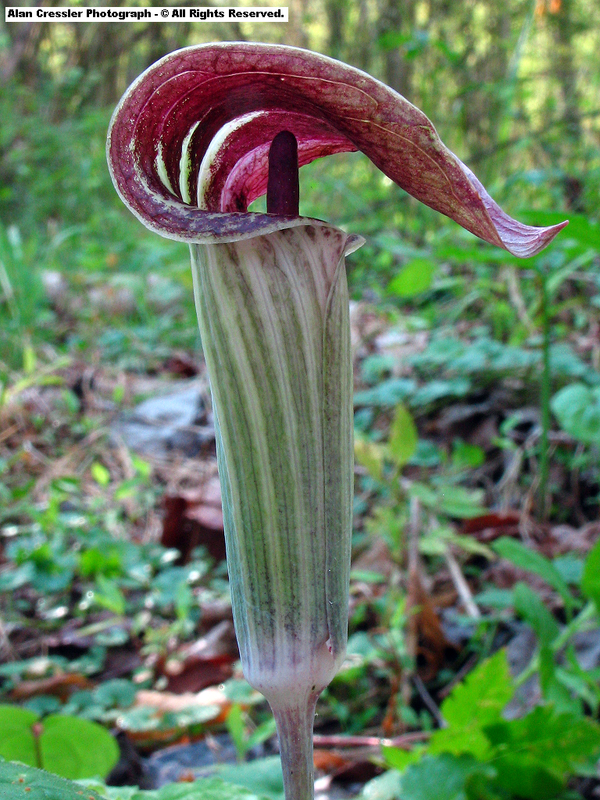 Green Dragon ( Arisaema dracontium ) is also an interesting Arum of the High Knob Landform. 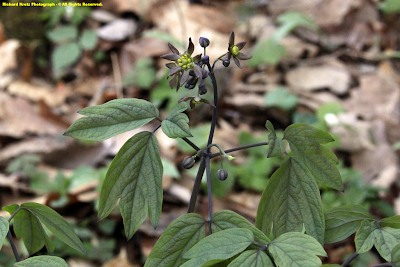 Blue Cohosh is an herb that does very well amid the cool, mesic forests of the High Knob Massif. 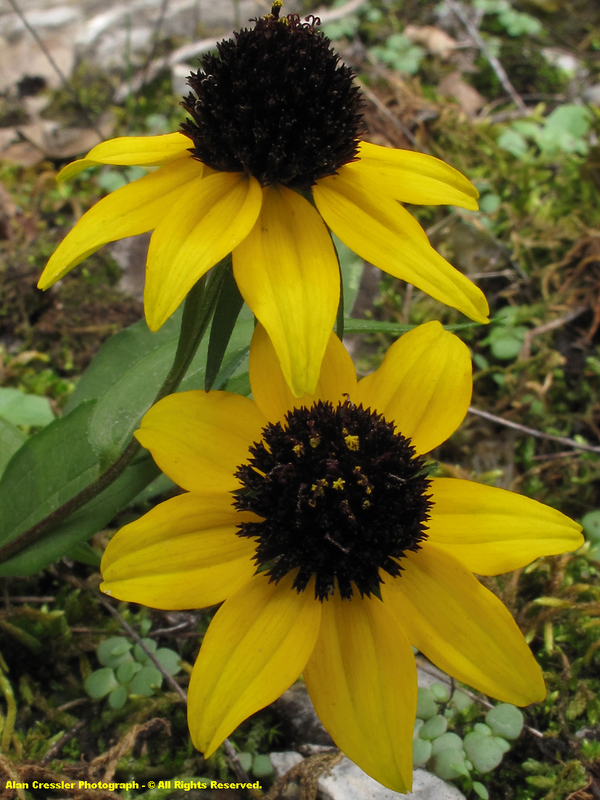 A nutrient demanding species with late April into May blooming times in mid-upper elevations. Twinleaf is a High Knob Landform-Clinch River Valley wildflower often confused with Bloodroot. However, upon close inspection, it has a single leaf nearly split completely into two parts which will distinguish it from the multi-lobed leafs of Bloodroot. 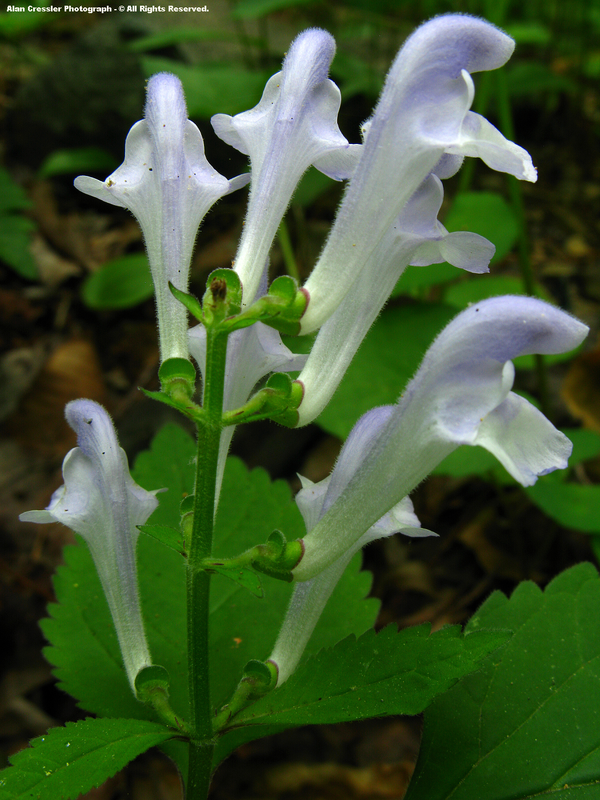 [ Twinleaf is most common in the piedmont & mountains of Virginia, especially within counties of the karst belt. It tends to have a shorter blooming period than Bloodroot, as well as that of the next little beauty shown below ]. Mayapple is a common spring wildflower that is also in the Barberry Family. Its growth begins during April across lower elevations, with blooming in mid-late April into May within most locations. [ My nature journal records that it may bloom into June amid the lofty basins of the High Knob Massif ]. 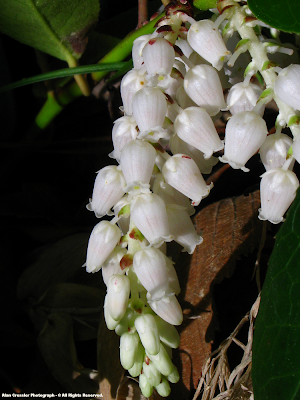 Wild Ginger is an often overlooked wildflower since its actual flowers are more often than not hidden from view by leaves and litter on the forest floor, with the relatively large kidney-shaped leaves being its best locating feature. 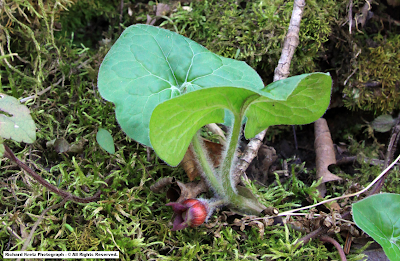 ( Asarum canadense var. reflexum ) . 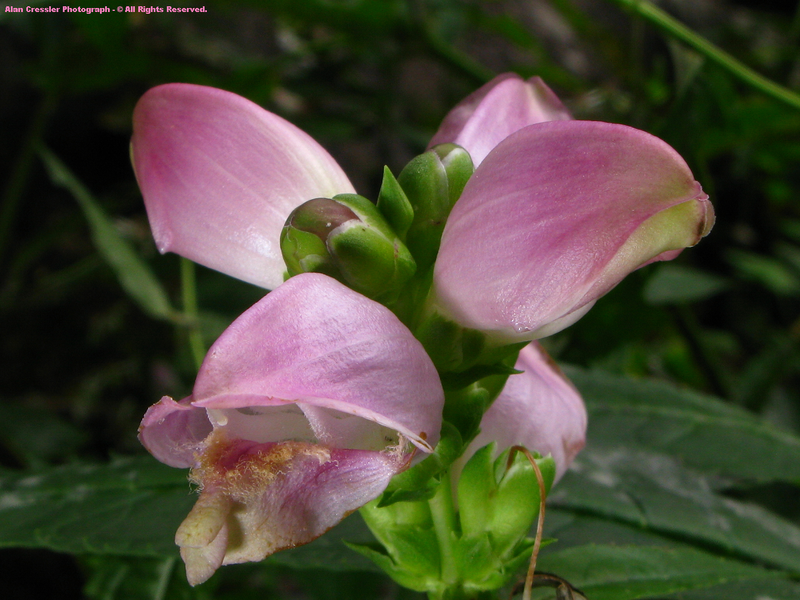 A group of wildflowers often mistaken for Wild Ginger are known as Little Brown Jugs ( for their many little jug-like flowers ). 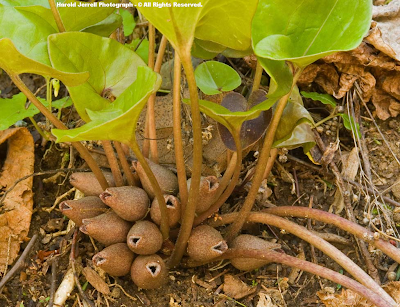 This group can be distinguished by their evergreen leaves, which are smooth and leather-like in nature as opposed to the deciduous leaves of Wild Ginger. ( Aristolochia serpentaria ) . 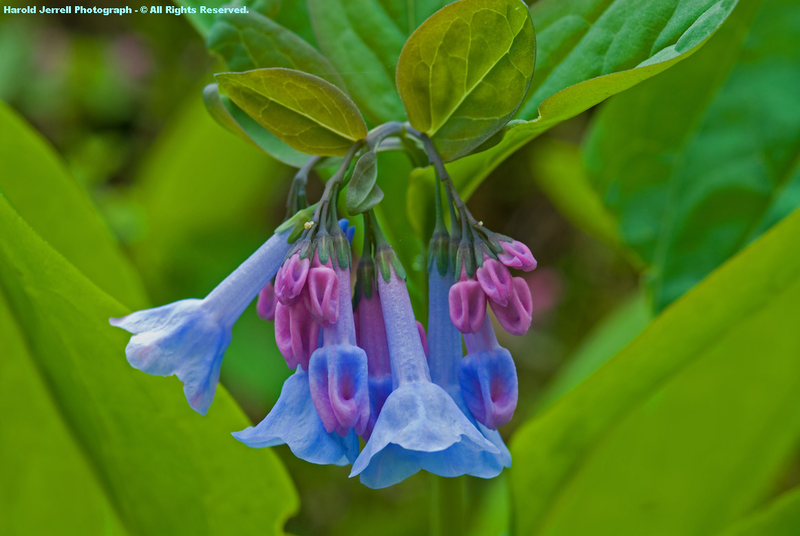 Virginia Bluebell is a gorgeous wildflower that likes the rich soils weathered from karstic terrain within the High Knob Landform, from Wise into Lee counties ( also Russell & likely in Scott ). 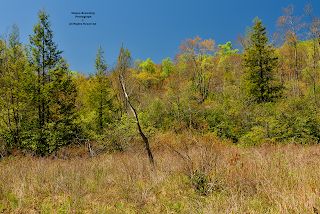 [ *A possible to likely species within the High Knob Landform given its documentation within an adjoining county ( necessary since so much of the HKL has not been extensively studied ) ]. Squaw Root is not your typical wildflower, as its actually a parasite that grows upon the roots of trees. Its preference is Oaks ( Quercus spp. ). Lacking chlorophyll and the means to utilize photosynthesis in order to tap and harness incoming solar radiation ( i.e., the sun's energy ) it is necessary for Squaw Root to obtain vital nutrients for life from the roots upon which it is attached. Although hardening over time, Squaw Root is quite soft upon spring emergence and is a favorite treat of hungry Black Bears ( Ursus Americanus ). Alan Cressler Photograph - © All Rights Reserved. 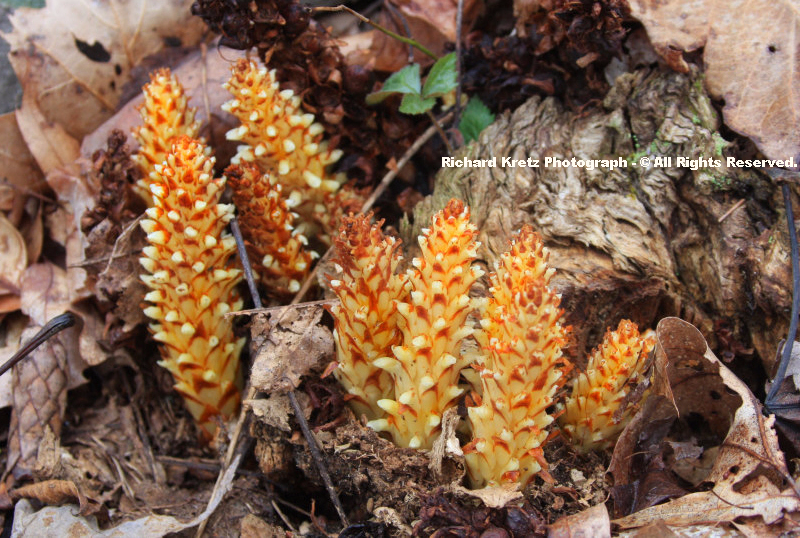 One Flowered Broomrape ( Orobanche uniflora ) is a parasite upon the roots of several different tree species. 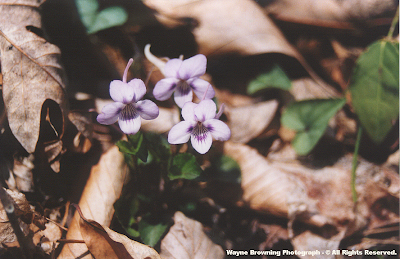 It emerges during April and May within rich woods. Beech Drops ( Epifagus virginiana ) is a herbaceous parasite upon the roots of American Beech ( Fagus grandifolia ) trees during the autumn. A much smaller and more common wildflower blooming around the same time as Bloodroot and Twinleaf is called Rue Anemone, with its little mitten-like leaflets. 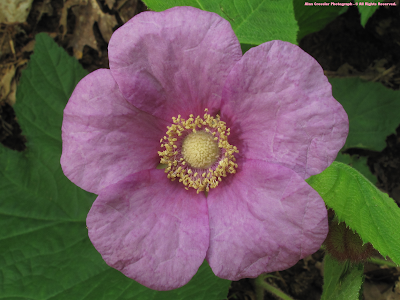 ( sometimes pinkish ) petals are actually sepals. It has no petals! 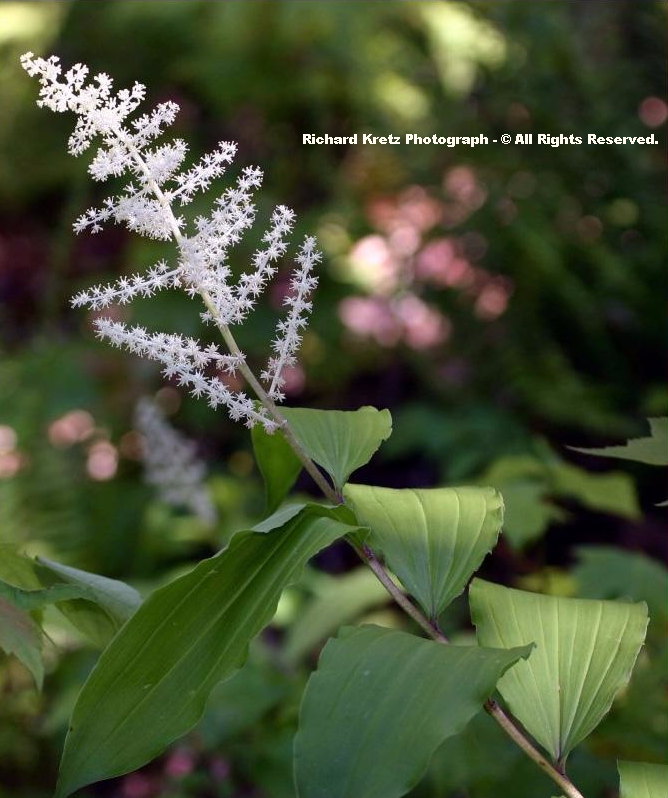 [ The photograph by Richard above being zoomed in close for detail, such that the plant appears much larger than it really is upon discovery in nature. As of April 9, I have both Bloodroot and Rue Anemone blooming together here in Clintwood ]. 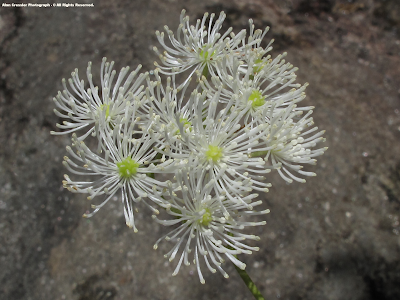 Mountain Meadow-rue ( Thalictrum clavatum ) is a southern Appalachian endemic documented across the southwestern half of the High Knob Landform ( including Lee County ), and a hand full of counties in the southern Blue Ridge of Virginia. 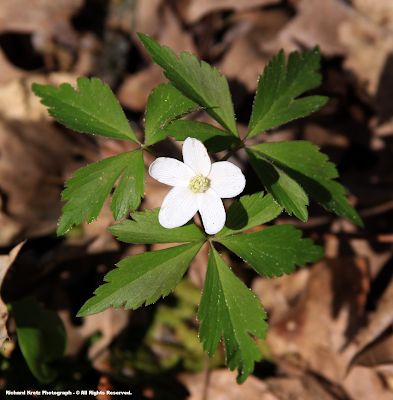 Small Wood Anemone has a more limited range as a High Knob Landform & southern Appalachian endemic species than the much more widespread Wood Anemone. 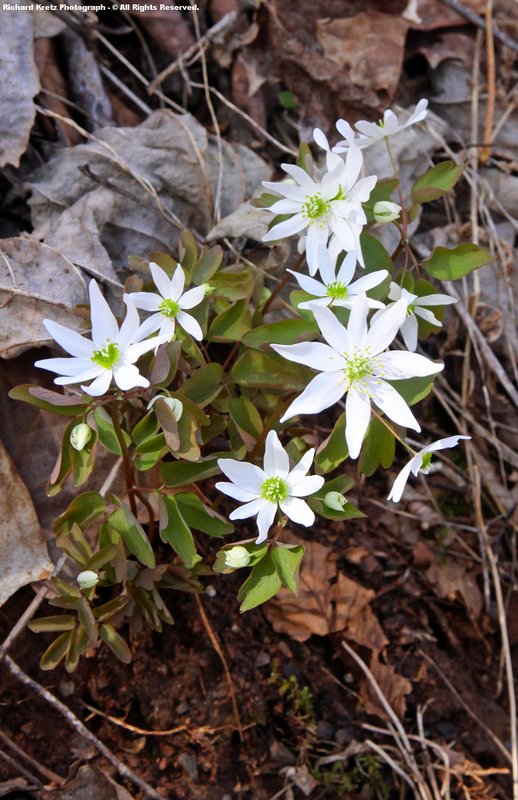 is another early spring bloomer with white sepals only, and no actual petals, like Rue Anemone. [ As noted above, it has spread outward through time from its stronghold within the southern Appalachians all the way north into Canada ( as many species continue to do in the wake of the last, great glaciations of the Pleistocene Era ) ]. 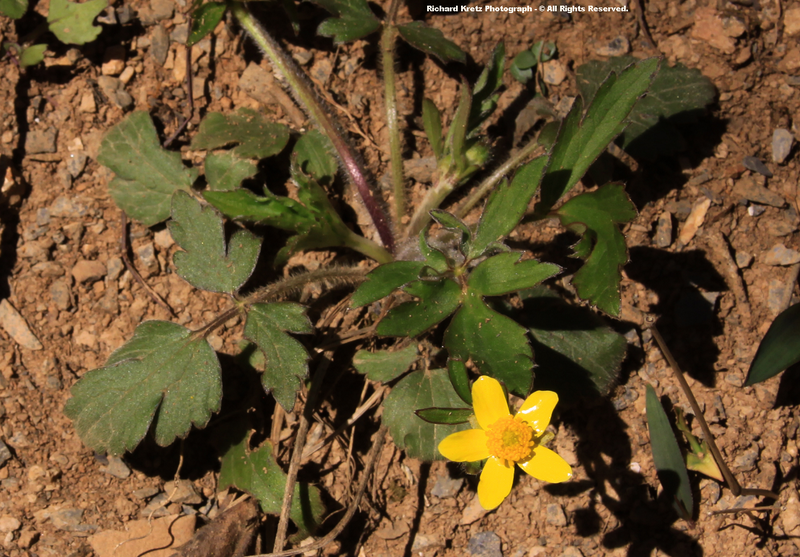 Mountain Thimbleweed ( Anemone lancifolia ) is a limited range species which tends to intergrade, or hybridize, with Anemone quinquefolia varieties to make identification of these species harder ( as noted by the Digital Atlas of the Virginia Flora ). Thimbleweed ( Anemone virginiana var. 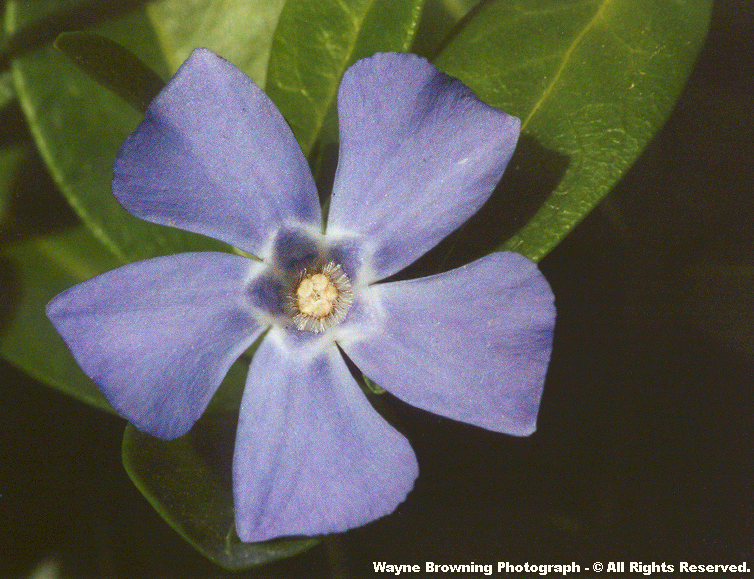 virginiana ) is a much larger & later blooming species of summer, with a widespread distribution. It has a distinctive fruiting head that is cylindrical, or thimble shaped, from which it takes the name Thimbleweed. Leather Flower is widespread across the High Knob Landform and Clinch River Valley, but is an endangered species within states such as Illinois & Pennsylvania. 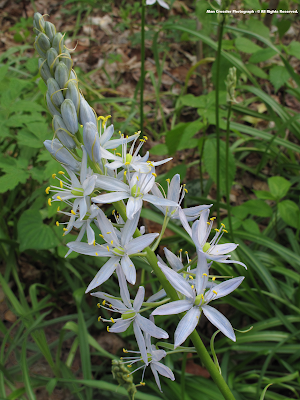 It likes basic soils and rich woods, with blooming into May or locally later. 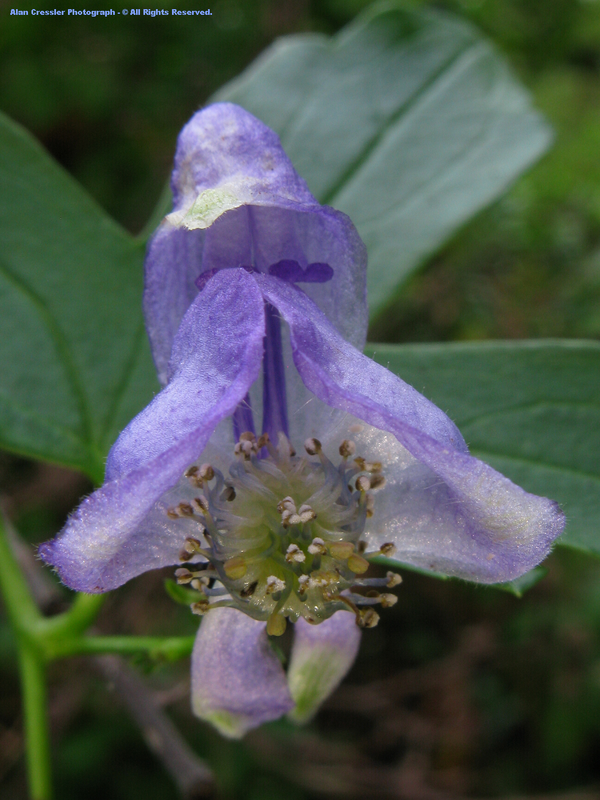 [ Leather Flower, or Vasevine, being widespread in terms of being documented within nearly all the counties of the High Knob Landform, but likely not discovered that often in nature ]. 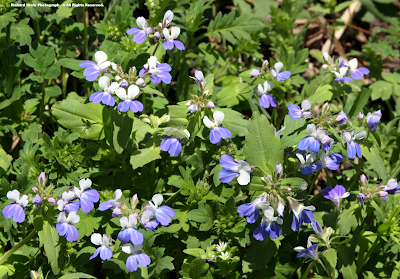 Dwarf Larkspur is a truly beautiful spring wildflower featuring a nice raceme of blue to white colored flowers above its deeply divided leaves. 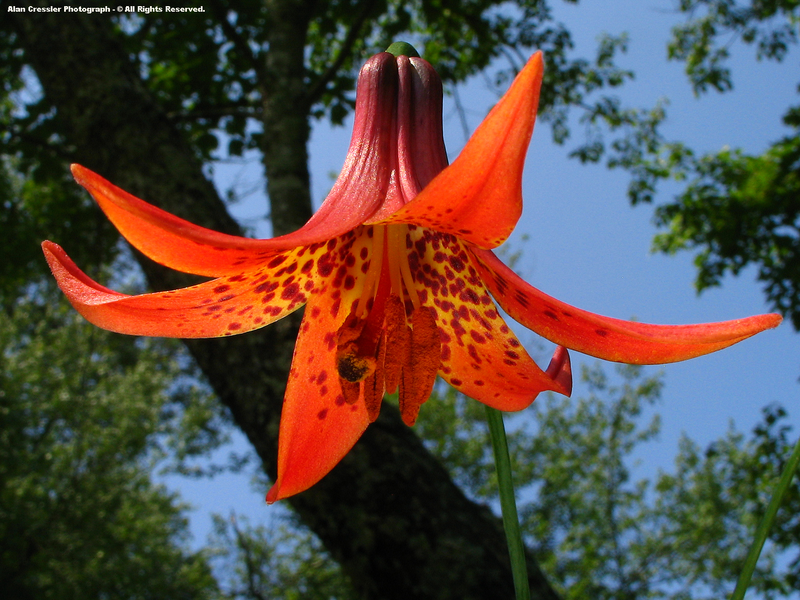 Despite such beauty, it is poisonous! While none of the above species are the type of Buttercup most often thought about, there are plenty of those within the counties of this landform ( more than listed no doubt ). Appalachian Bugbane is a globally rare species that is listed as very rare in Virginia. 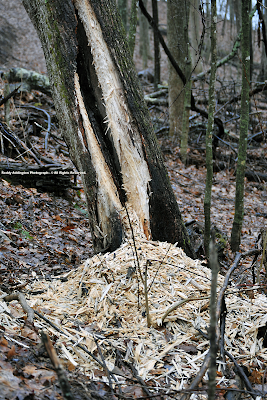 It has only been documented by the Digital Atlas within the High Knob Massif area of Wise and Scott counties. It is also found across the southwestern end of the High Knob Landform. Satin Curls is a extremely rare and critically imperiled species within Virginia. 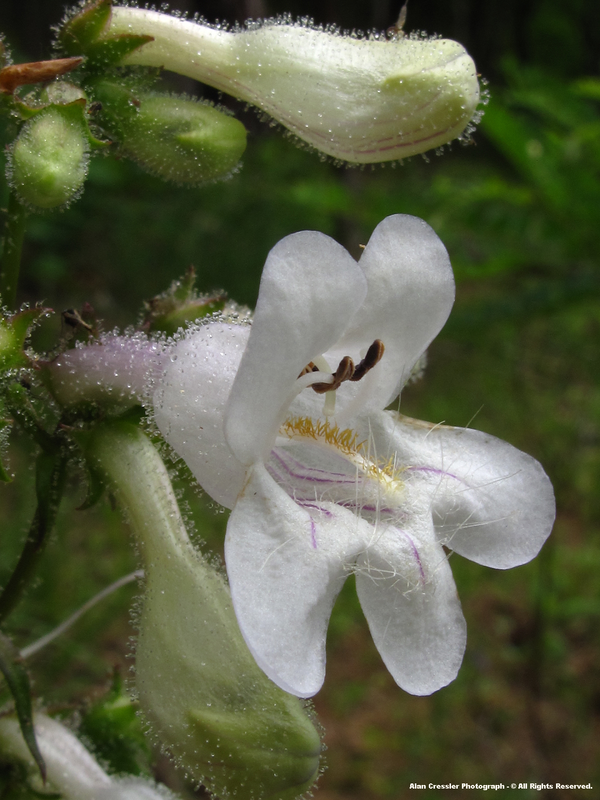 White-leaved Leather Flower is a rare species that was originally listed for Lee County, but may actually be historical to Virginia unless it can be discovered again in nature. [ *A possible to likely species within the High Knob Landform given its documentation within an adjoining county ( necessary since so much of the HKL has not been extensively studied )]. Meadow Parsnip does not look much like a woodland wildflower, but upon close inspection has nice umbels of tiny little flowers. It blooms during April into May. 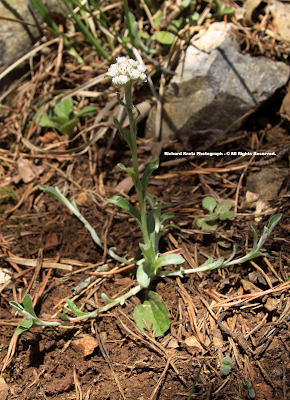 Hairy-jointed Meadow Parsnip ( Thaspium barbinode ) has widespread documentation within the mountains & piedmont of Virginia. Filmy Angelica is a common species within mid-upper elevations of the High Knob Massif, and is endangered in both the states of Kentucky and Maryland. 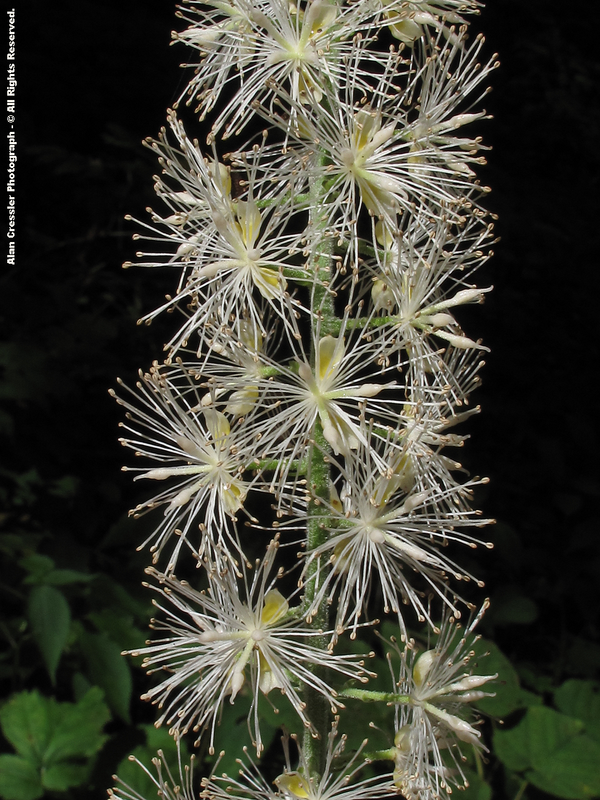 The Cow Parsnip of upper elevations within the High Knob Massif is often a good floral gage of spring & summer wetness, with wetter seasons causing it to grow 6 to 10+ feet tall ( producing an impressive looking plant ). [ Cow Parsnip is an endangered species in Kentucky, being primarily restricted to upper elevations of Black Mountain ]. Although the Rattlesnake Master is globally secure, it is a very rare and imperiled species within Virginia. Periwinkle is a very common evergreen vine introduced to Virginia, and currently in bloom within many locations. 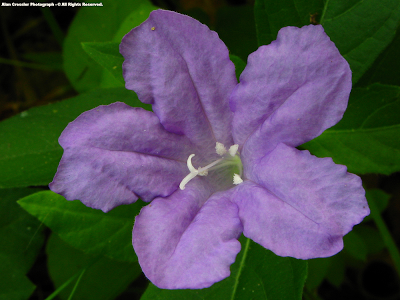 It is classified as an exotic invasive, essentially a pest, due to its tendency to spread ( despite its pretty, star-shaped bloom ). Blue-eyed Mary is a imperiled species known from only five counties in Virginia, mostly within the Upper Tennessee River Basin ( including Scott & Russell ). 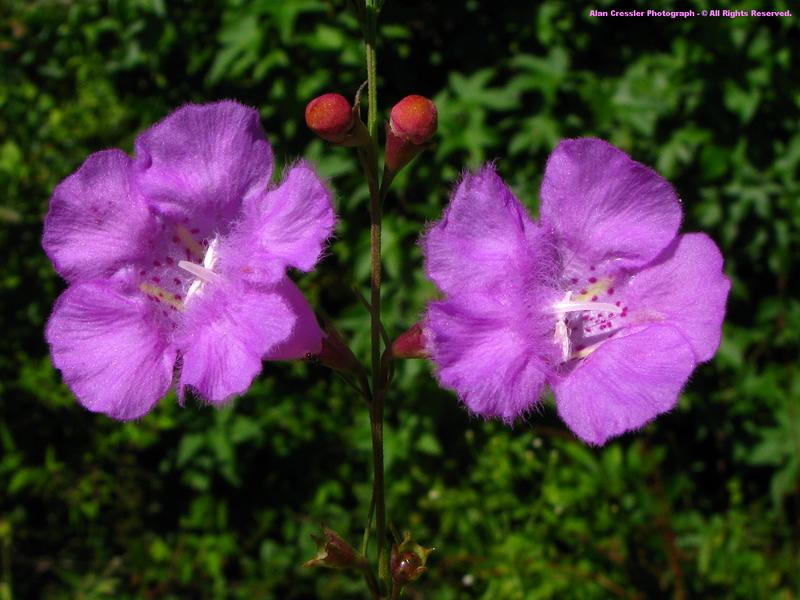 It is endangered in Tennessee, and known from only two counties in central portions of that state. [ Its G5 Status, globally secure, seems unwarranted given its obvious rarity within North America ]. Purple False Foxglove is another gorgeous wildflower that is one of so many within the wonderful Figwort Family. Its found in Wise County and across the southwestern end of the High Knob Landform. 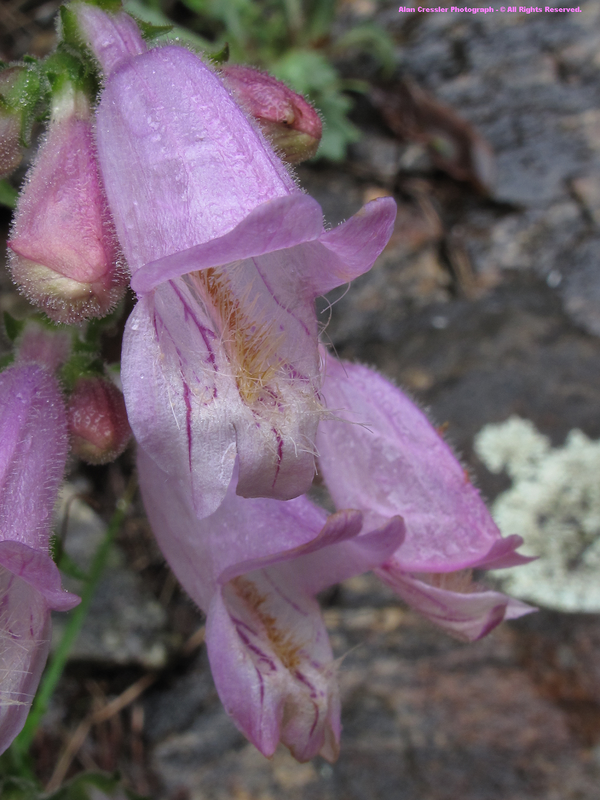 Mullein Foxglove is a critically imperiled, extremely rare species in Virginia. 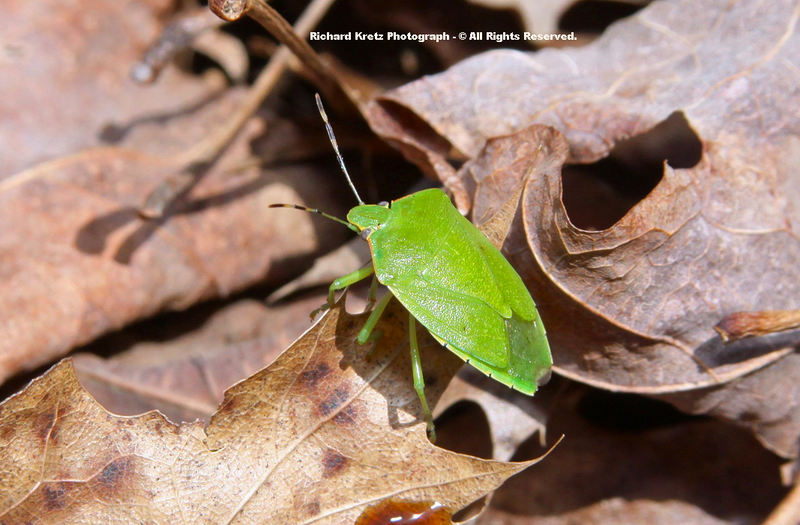 It is a resident of rocky, calcareous woodlands within the High Knob Landform. 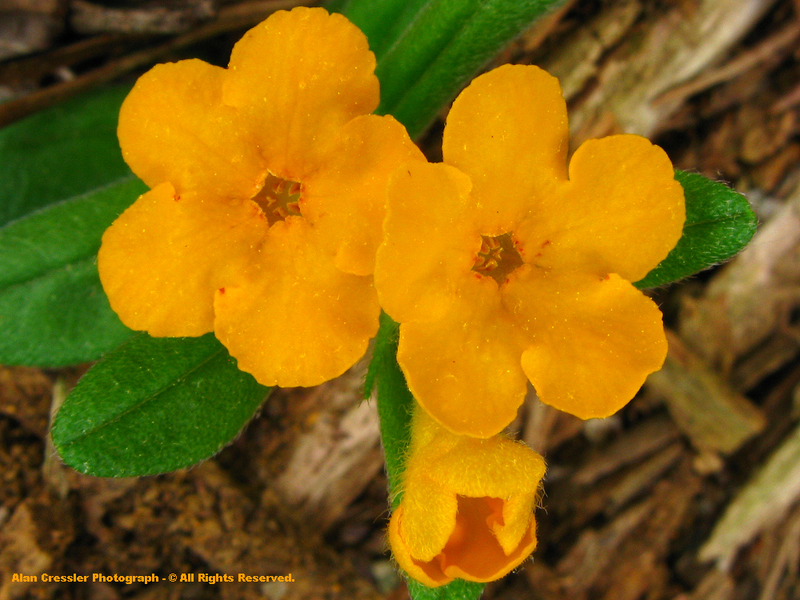 **Molecular studies have found that the genus Mimulus may eventually be placed within the Lopseed Family ( Phrymaceae ). ( most numerous within the Appalachians ). Showy Gentian ( Gentiana decora ) is a southern Appalachian endemic species with a late summer-early autumn blooming period. 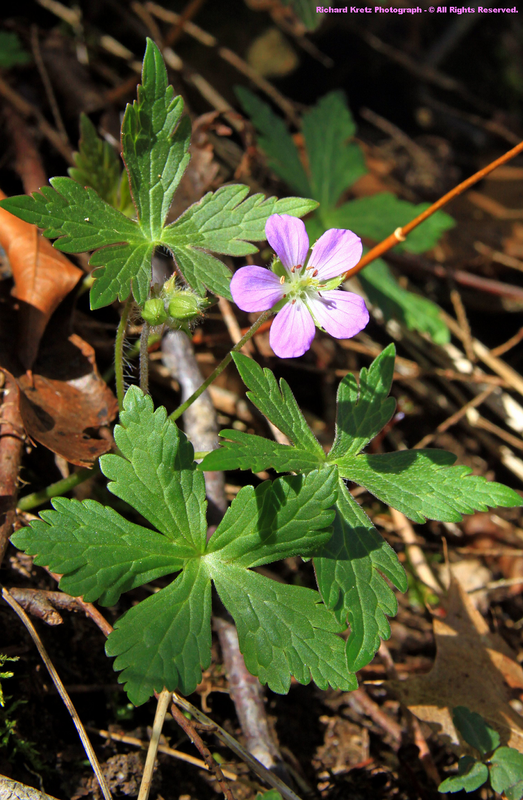 Wild Geranium ( species: maculatum ) has been blooming for a while within lower elevation sites, such as The Pinnacle NAP of the Clinch River, but it will be a while longer before they begin within colder locations. [ My nature journal records, for example, that Wild Geraniums were blooming in the High Knob Lake Basin on June 1, 2001 and during May 23, 2006 ]. ( Geranium molle ) . 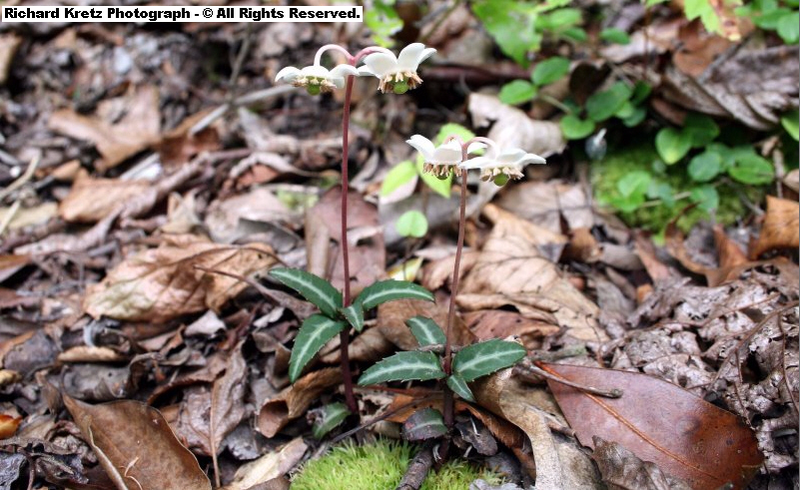 Spotted Wintergreen is always a lovely discovery within the mountain woods, whether it be winter or during the May-June blooming period. 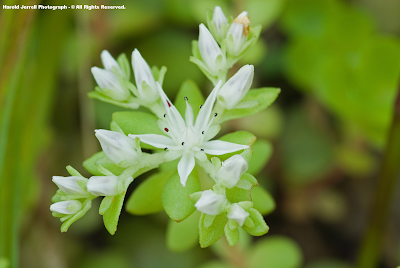 It possesses evergreen leaves, as is characteristic of members of the Heath Family. 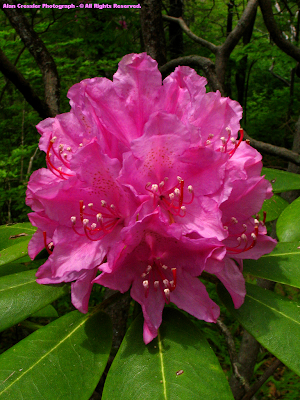 Great Rhododendron, also called Great Laurel, is one of the most dominant members of the Heath Family across the High Knob Landform ( my nature journal records an extremely heavy bloom at High Knob Lake on July 2, 2009 during a chilly July in the mountains ). ( which future genetic testing may hopefully resolve )]. 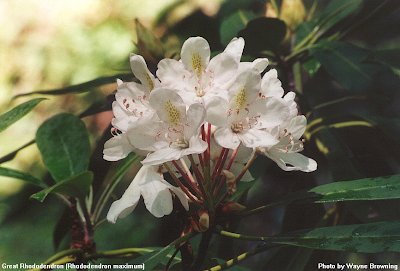 Mountain Laurel is actually the true "Ivy" of the mountains, with a liking for rocky or sandy soils. 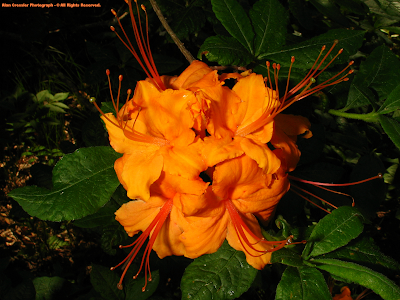 It can bloom from late April into June with increasing elevation. 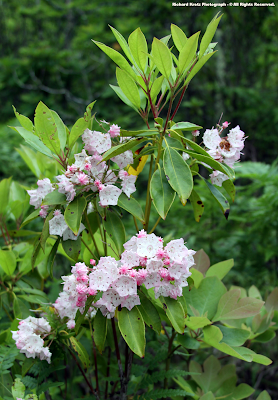 Highland Doghobble is an extremely to very rare shrub species of Virginia with a local abundance in some wet settings amid the High Knob Massif and its adjacent landform. 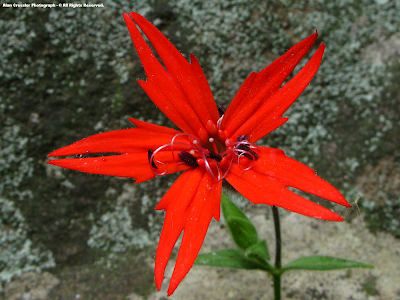 Redtwig Doghobble is an endemic shrub of the southern Appalachians, and is listed as endangered within Kentucky. Smooth Azalea has a Virginia Natural Heritage Program ( VANHP ) ranking of imperiled, which means its very rare within the Old Dominion. Trumpet Honeysuckle is a species reported from Lee County and the southwestern end of the High Knob Landform. 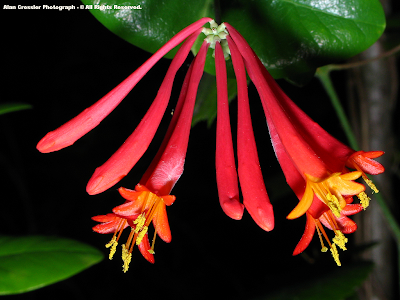 Japanese Honeysuckle ( Lonicera japonica ) is a widespread and very invasive species that has been introduced. 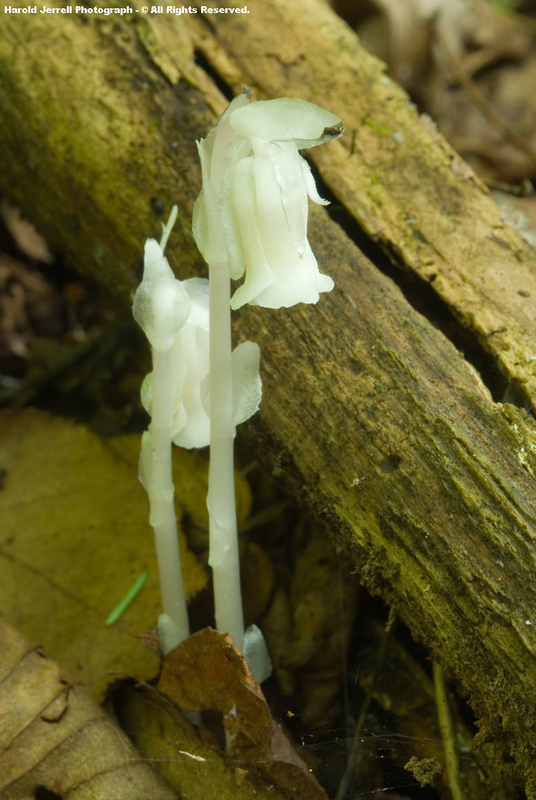 Indian Pipe is a ghostly looking plant amid the shady, damp woodlands of summer. At times there can be massive eruptions of these following dry spells, with one documented as occurring during June 2003. 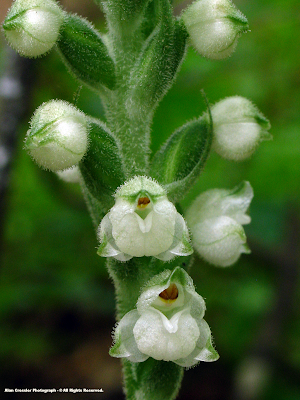 [ Indian Pipe is white or occasionally varied in colors, except green, due to its lack of chlorophyll. This herbaceous perennial is interesting in that it forms a special relationship, like so many floral species, with fungi, who in the process of breaking down organic matter for their own energy supplies the roots of Indian Pipe with needed nutrients for its life. A symbiosis exemplified! ]. Pine Sap ( Monotropa hypopithys ) is another interesting member of this family, with variations in its color as well ( other than green ). 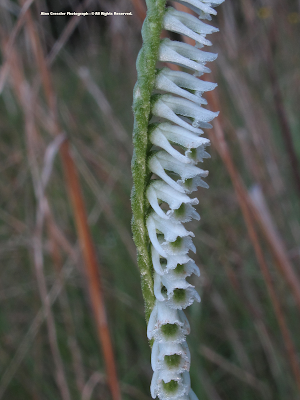 It often arises earlier in the spring than Indian Pipe. ( it may be locally more widespread ). 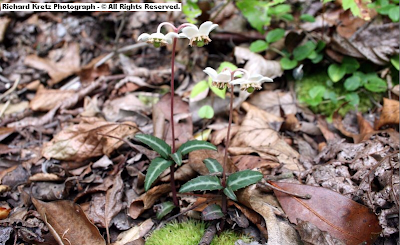 [ Indian Pipe & its associates were formerly placed within the Heath Family ( Ericaceae ), but have more recently been classified by some botanists as being part of a separate family called the Monotropaceae ]. 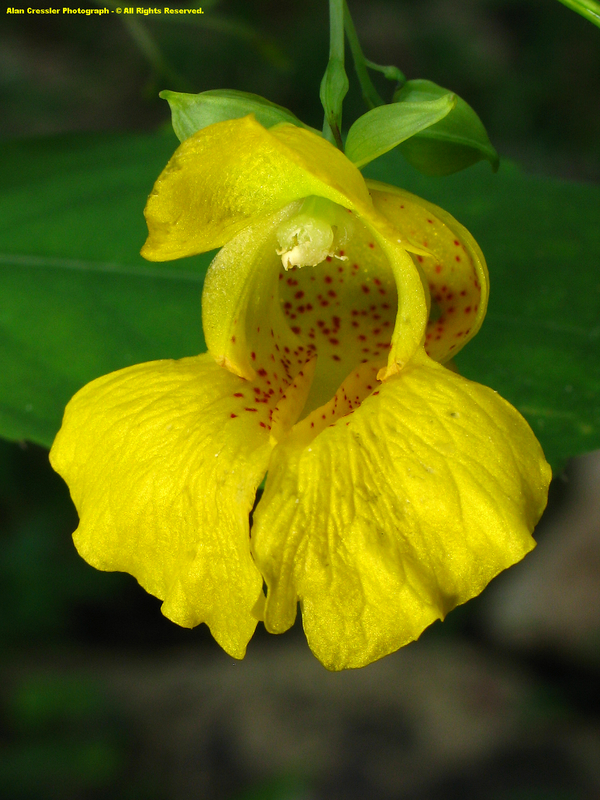 Yellow Jewelweed is a species of wet, mesic woods that blooms amid summer. 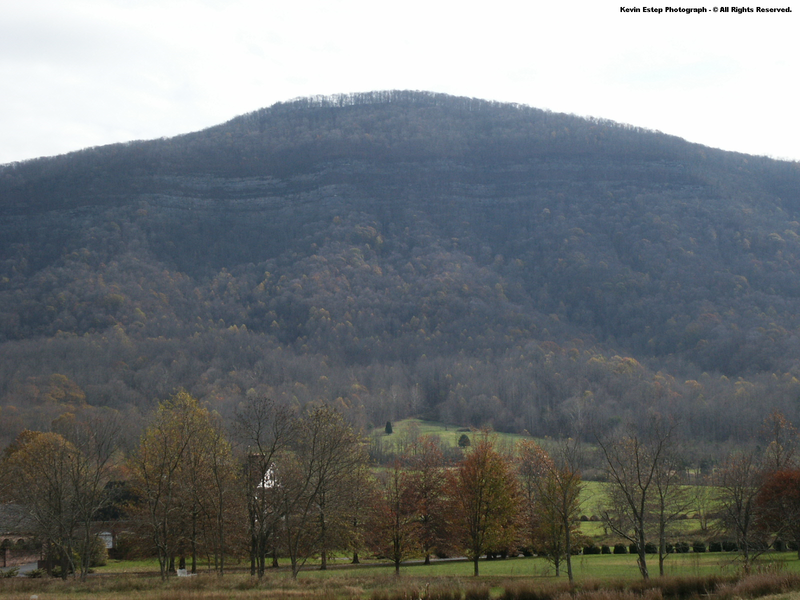 Although not stated by most accounts, it has a strong tendency to grow within upper elevations of the High Knob Landform and upon calcareous stratigraphy at lower elevations where it may replace the next variety. [ My nature journal records July-August as blooming times within upper elevations of the massif ]. 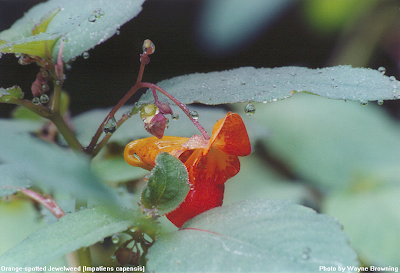 Orange-spotted Jewelweeds favor wetter sites in lower elevations and have a distribution that is more widespread in nature outside of the karst belt. Spotted Snapweed ( Impatiens balsamina ) is an introduced variety that is relatively rare within Virginia. Partridge Berry is a gorgeous little wildflower of the Madder Family, with a pleasant smell. 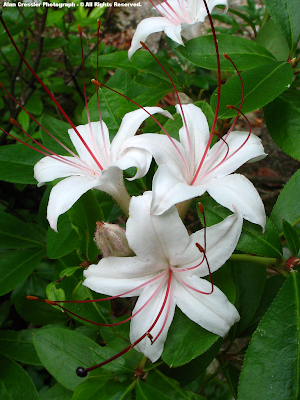 It typically blooms during the May-June period, and often produces these beautiful flowers along with aromatic, edible red berries. 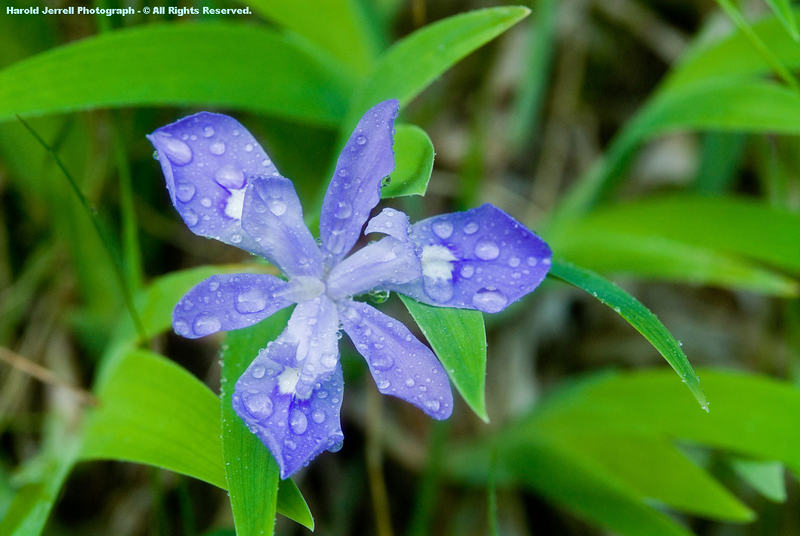 Canadian Summer Bluets is listed as very rare within Virginia, and is found only from the High Knob Landform into parts of the New River Basin. 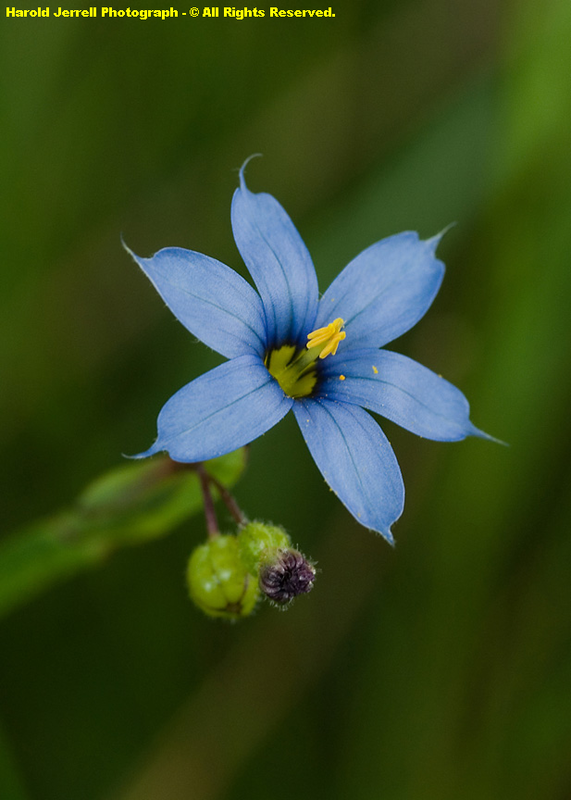 Barrens Bluets is a VANHP critically imperiled species, being listed as extremely rare in Virginia and documented only within Lee County of the High Knob Landform. 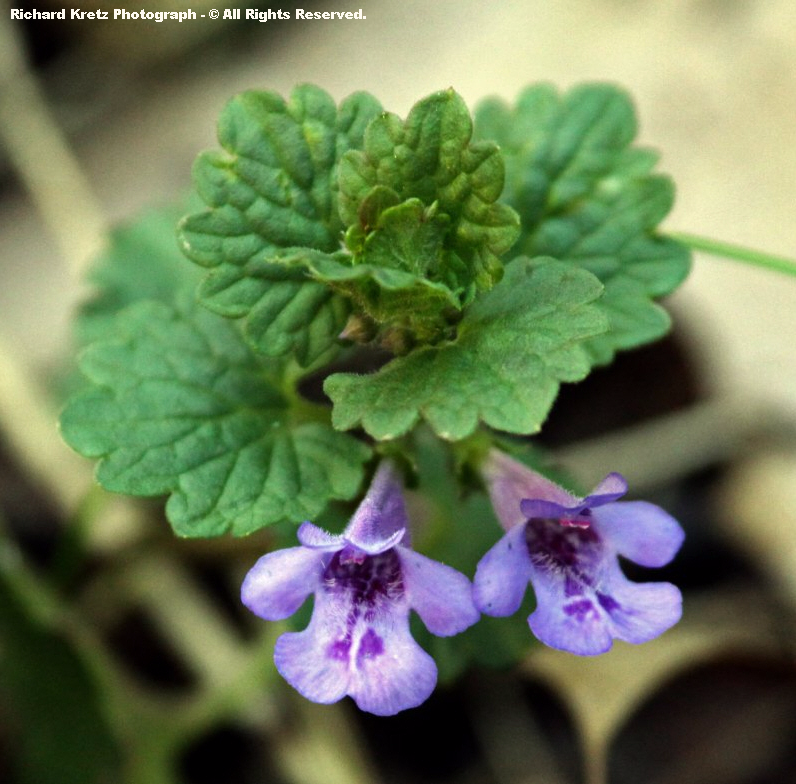 Ground Ivy is a prolific growing little plant that often spreads across yards and waste places. It is introduced to Virginia, and not a native wildflower. 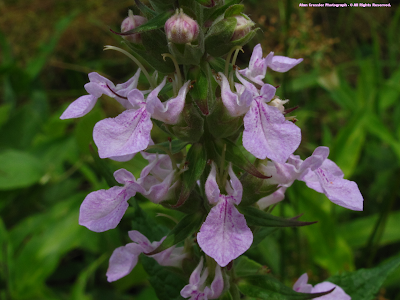 The Mint Family has many complex groups of species, with many native and introduced varieties. 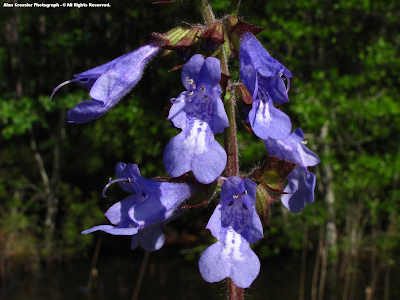 Hoary Skullcap is a very rare species within Virginia, with Lee being the only county west of the Piedmont to be Digital Atlas listed. Small Skullcap ( Scutellaria parvula var. 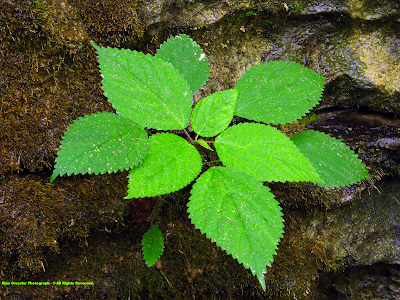 parvula ) is a VANHP critically imperiled species, although more herbarium work is needed to map out its specific varieties. Gyandotte Beauty is a very rare Virginia species, which ranges from the High Knob Landform across the Upper Tennessee River Basin. Black Elderberry is part of the Adoxaceae Family, commonly called Muskroot, that now includes the interesting Viburnum's which were moved out of the above noted Honeysuckle Family ( Caprifoliaceae ). [ Part of molecular and phylogenetic studies which are reshaping the arrangements and relationships of many floral species ]. Black Elderberries are associated with one of the many famous "winters" of the mountains, marked by chilly spells of weather during spring and summer. 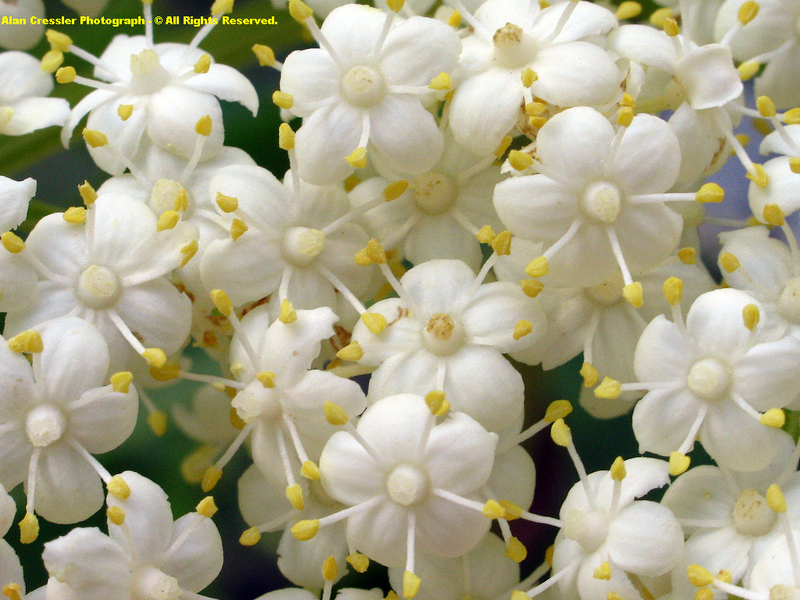 Red Elderberry ( Sambucus racemosa var. pubens ) is a mid-upper elevation species within the High Knob Landform, where cooler conditions are the norm. 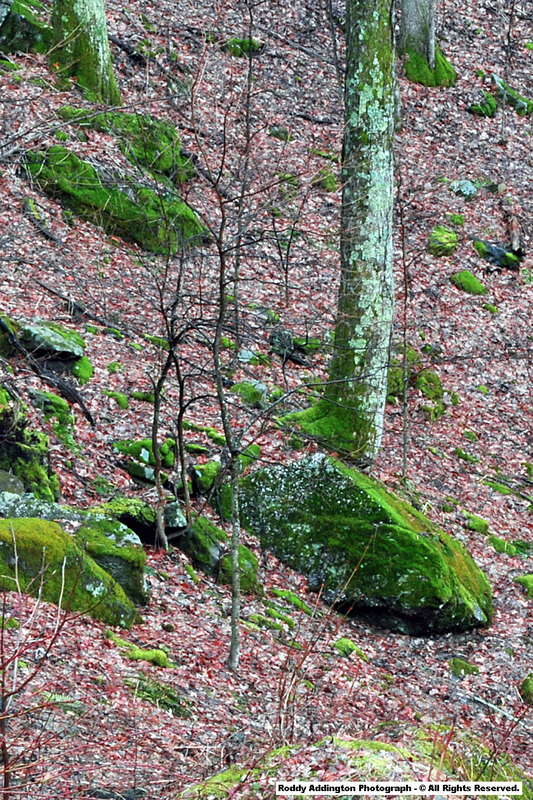 They prefer rocky woodlands and forests along boulderfields. Red Elderberry is endangered within Kentucky & Illinois, and listed as a historical ( extirpated ) species of the state of Rhode Island. 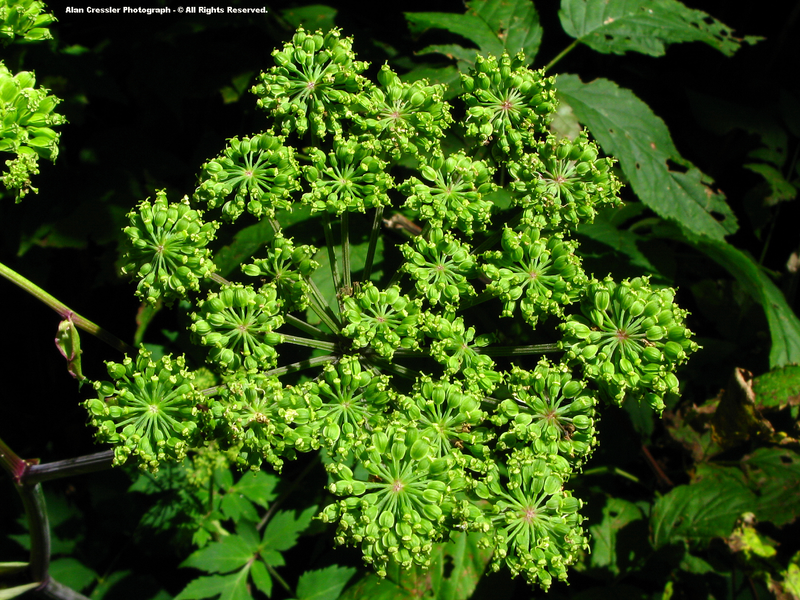 [ Red Elderberry foliage, stems, and roots are all poisonous ]. 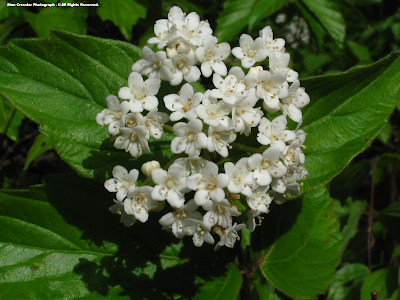 Downy Arrowwood has beautiful blooms and is only one of numerous very interesting species of Viburnum in the High Knob Landform. It is a threatened species of Kentucky, and endangered within parts of New England. Hobblebush, sometimes also called Moosewood, is a Viburnum of the Northern Hardwood Forests of the High Knob highcountry. It is endangered in Kentucky. 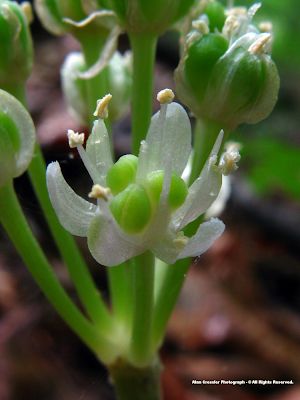 Northern Wild-raisin is a lover of the mid-upper elevation wetlands of the High Knob Massif and endangered within the states of Kentucky, Indiana, and Pennsylvania. 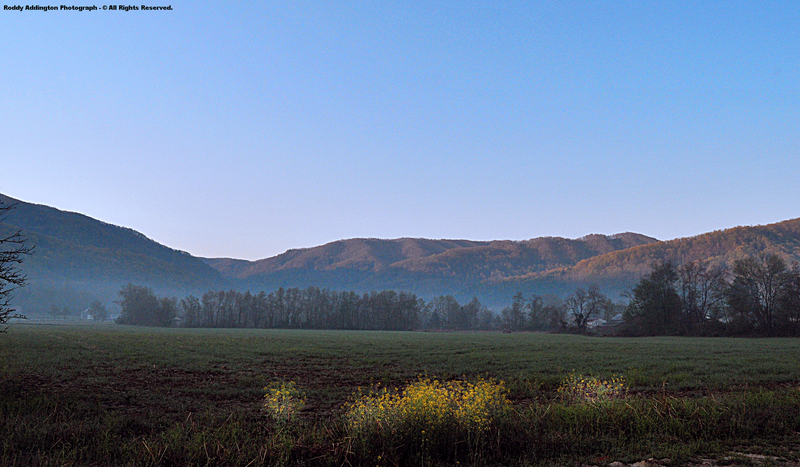 A member of the Mustard Family adds color to a majestic morning scene upon the Valley floor of the High Knob Landform. 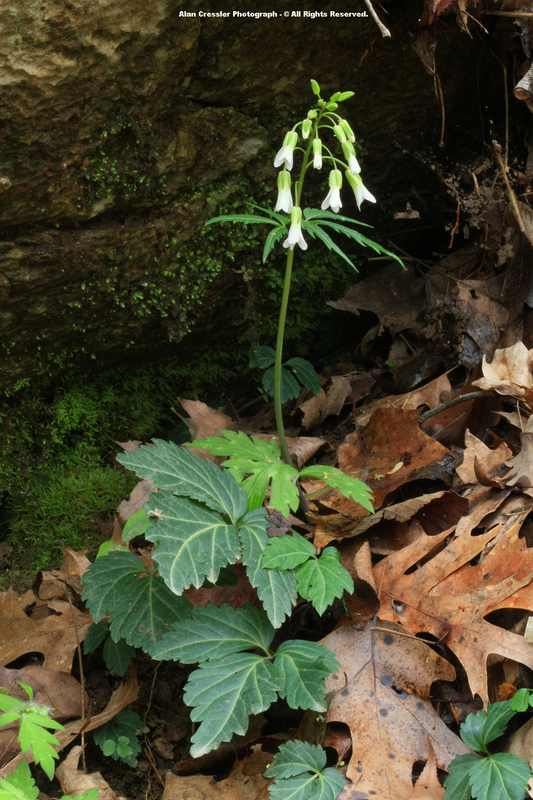 Cut-leaved Toothwort is one of 17 species in the genus Cardamine listed on the Digital Atlas of the Virginia Flora ( part of the Mustard family ). 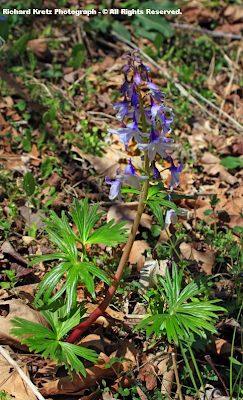 It was blooming early in April when Richard photographed the above specimen within majestic Pinnacle Natural Area Preserve of the Clinch River Valley, in Russell County, Virginia. An analysis of DNA sequence data from chloroplasts ( the site of photosynthesis ) of what has been called the Cardamine concatenata alliance, of which the next two highlighted individuals are members, revealed that species found today within eastern North America, western North America, and Eurasia all developed separately! 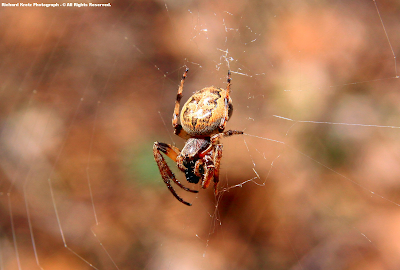 An excellent example of how phylogenetics is helping to better define relationships among both living and extirpated organisms. [ In colder mountain drainages, Cut-leaved Toothwort may not bloom until mid-April into early May ]. 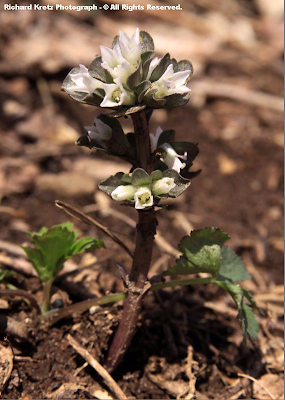 Two-leaved Toothwort tends to be a higher elevation species that blooms in the High Knob Massif during late April and May. Slender Toothwort ( Cardamine angustata ) tends to favor lower elevations, and blooms earlier. 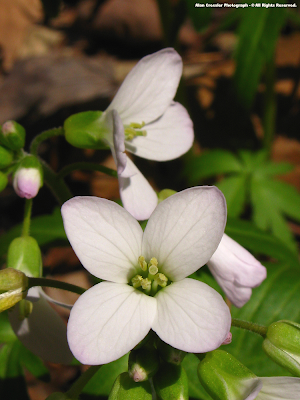 Another group of Cardamine species fall into what are commonly called bitter cresses, which lack deeply divided leafs of toothworts and possess small flowers ( many very tiny ). 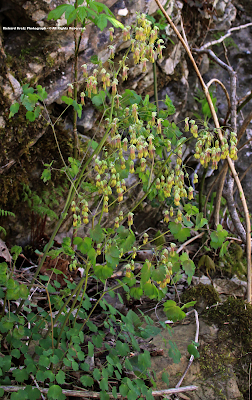 Small Mountain Bittercress ( Cardamine clematitis ) is a very restricted upper elevation endemic that ranges from the High Knob Massif and Clinch Mountain into the Mount Rogers area. 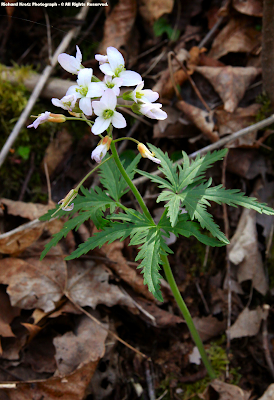 Hairy Bittercress ( Cardamine hirsuta ), in striking contrast, is an introduced species that is common throughout Virginia. [ Ditto for Pennslyvania Bittercress ( Cardamine pensylvanica ), except its native to Virginia ]. Many members of the Mustard Family, or Brassicaceae, have been introduced. Some of these species are invasive, such that they tend to take up spaces ( fill ecological niches ) that would typically be occupied by native plants. 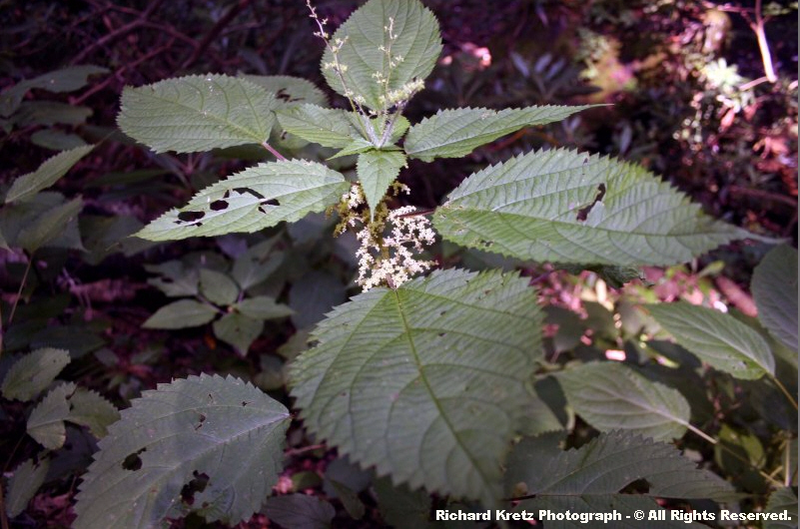 Wood Nettles are famous within the High Knob Massif, with an entire section across the head of the large Clear Creek Basin being named "The Nettle Patch." The Wood Nettle is a mesic loving component of the endemic Southern Appalachian Northern & High Elevation Cove hardwood ecosystems of this remnant massif of the High Knob Landform ( also grows into lower elevation settings ). 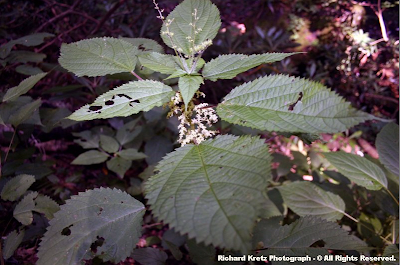 ( Urtica dioica ssp. gracilis ) . Wild Stonecrop is another wildflower which often begins blooming during April, continuing into May or even June at higher elevations. It can be found growing at the base of trees, across rocks, logs, and near creeks. of the area. It has yellow petals. 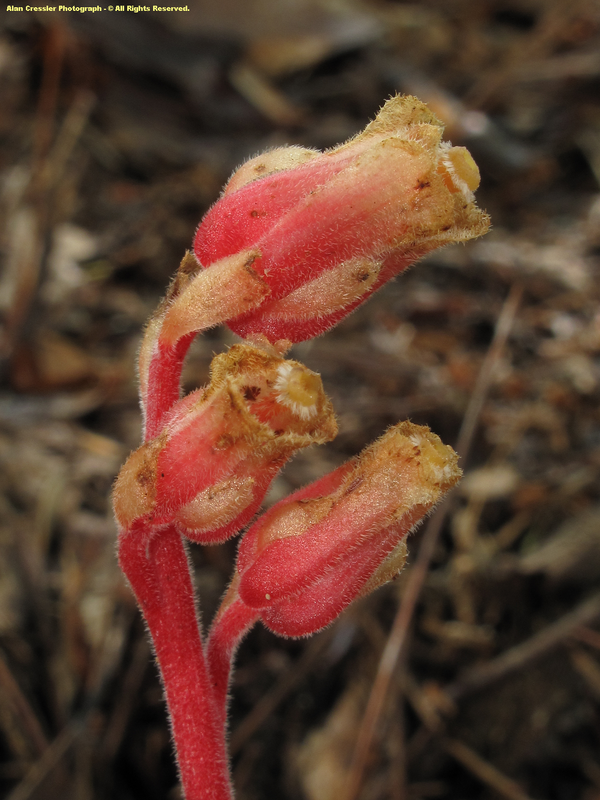 The beautiful Fire Pink is a species that will soon bloom, if its not already within warmer, low elevations, and continue doing so into the summer ( especially at higher elevations ). 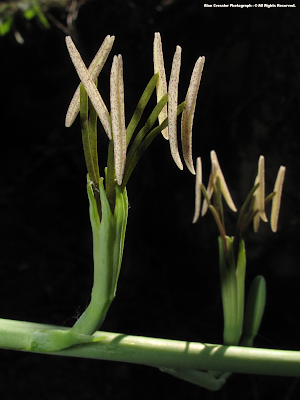 It possesses a long blooming period under ideal conditions. Star Chickweed is a woodland wildflower of surprising beauty, especially when it grows in large clusters. 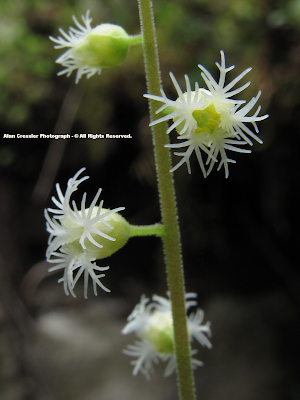 Tennessee Starwort ( Stellaria corei ) is a less frequent variety which grows from the High Knob Landform to the Great Smokies. Most folks are more familiar with the introduced varieties, such as Common Chickweeds ( Stellaria media ) & ( Stellaria pallida ), as well as the Grass-like Starwort ( Stellaria graminea ). 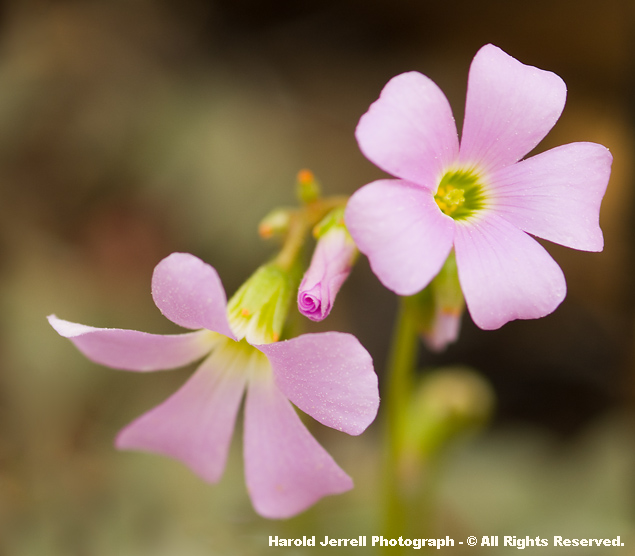 The Pink Family ( Caryophyllaceae ) like many floral families, decorates this ancient mountain landscape with some rare species, as well as introduced varieties. While Roundleaf Catchfly might initially appear similar to the common Fire Pink at a glance, it is a rare southern Appalachian endemic species. 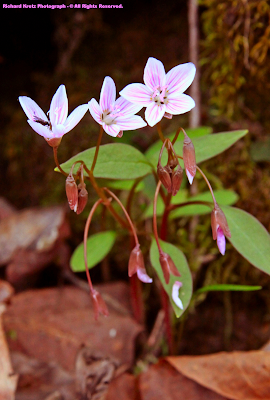 Its been documented from the Cumberland Mountain flank of the High Knob Landform into portions of the Cumberland Plateau and, as Alan Cressler notes, likes growing under overhangs of sandstone cliffs where little rain can reach the plant ( unlike Fire Pink which can often be found within rich, mesic woods ). It is a very rare, imperiled species in Virginia. 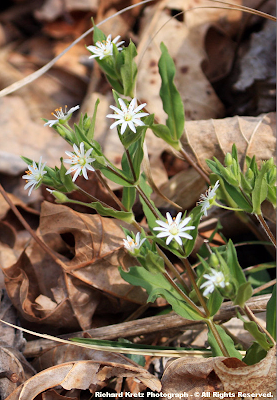 Appalachian Sandwort is a rare endemic found within the Martin's Fork Wild River study area of the High Knob Landform. It has only been documented in Lee, Floyd, Nelson & Madison counties within Virginia. It is an endangered species in Tennessee. 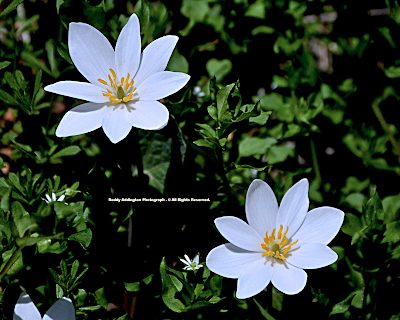 Pitcher's Stitchwort is listed as an endangered species in both Indiana & Ohio. Silverling is another rare plant species listed as endangered within Kentucky and threatened in Tennessee. 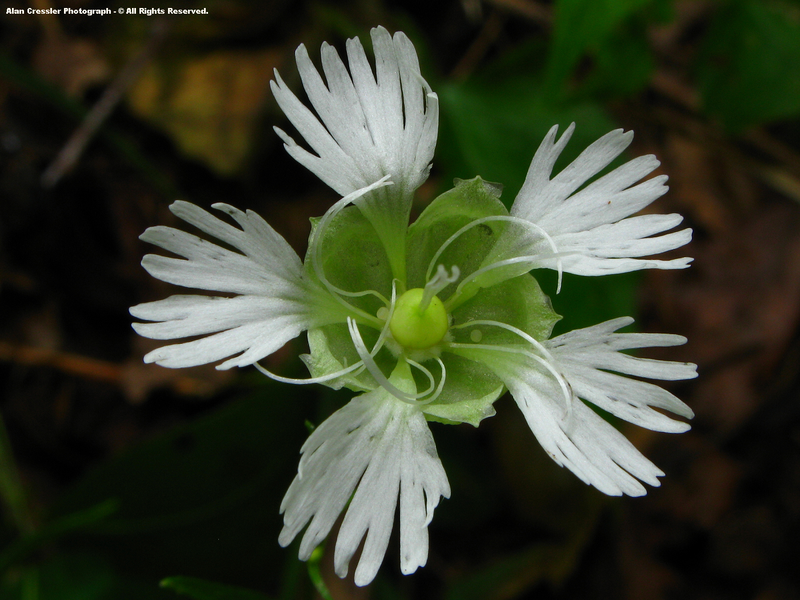 Ovate Catchfly is also a limited range species that has so far been found only within Lee, Wise, and Dickenson counties of Virginia. It is endangered in the states of Tennessee, Illinois, and Indiana. 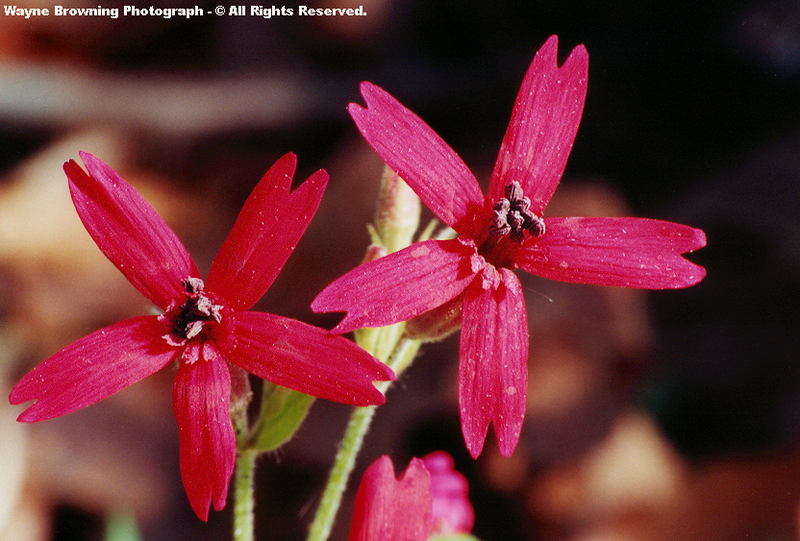 Ovate Catchfly is a globally rare species that is listed as critically imperiled ( extremely rare ) in Virginia. Spring Beauty was highlighted on the previous March update, but deserves another look since the flowers appear similar to a species that will bloom in early-mid summer amid the highcountry ( refer to Mountain Wood Sorrel ). Common Cinquefoil is widespread across the eastern half of North America, and can be an invasive, weedy plant. Downy Hawthorn is an extremely rare species within Virginia that possesses a northern range ( i.e., it is much more common at higher latitudes ). It grows amid portions of the High Knob highcountry, where elevation and cooler, wetter conditions make up for the lack of latitude. 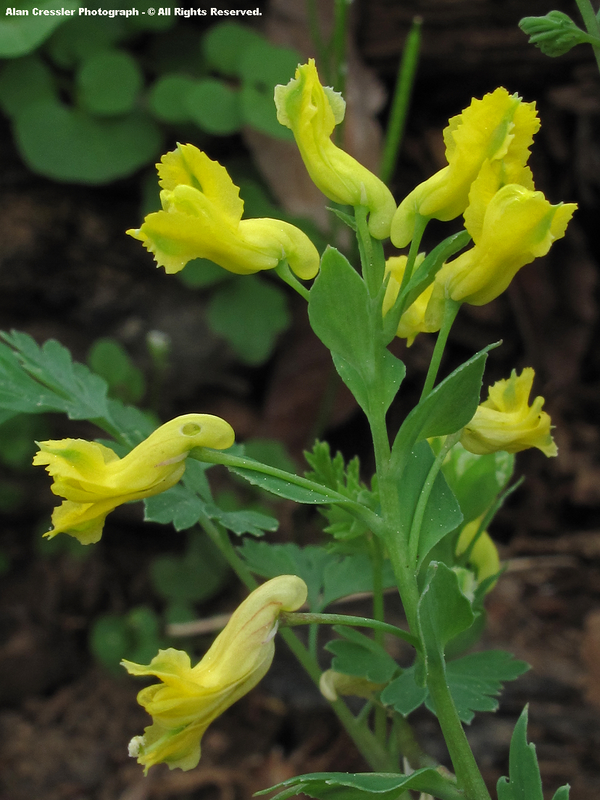 American Ipecac is another species which is extremely rare in Virginia, with a Digital Atlas listing for only Wise and Halifax counties. 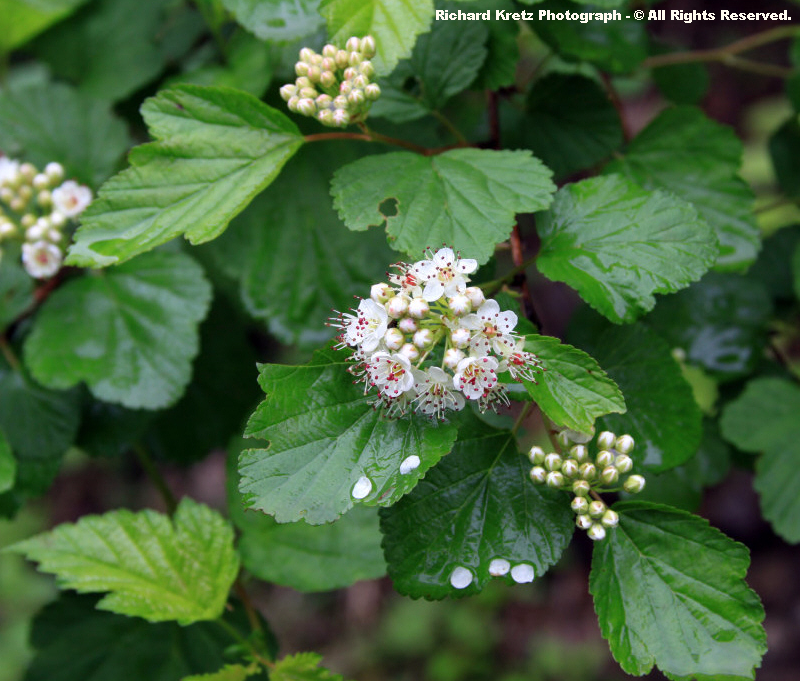 Virginia Spiraea is a very rare global species, and is Digital Atlas listed as extremely rare in Virginia. 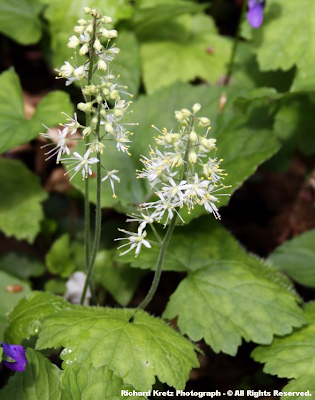 Foamflower, also called False Miterwort, is a common spring wildflower that blooms along with others like Wild Geranium, Fire Pink, and Long-spurred Violet as the Coltsfoot ( Tussilago farfara ) of spring's dawn go into pappus. 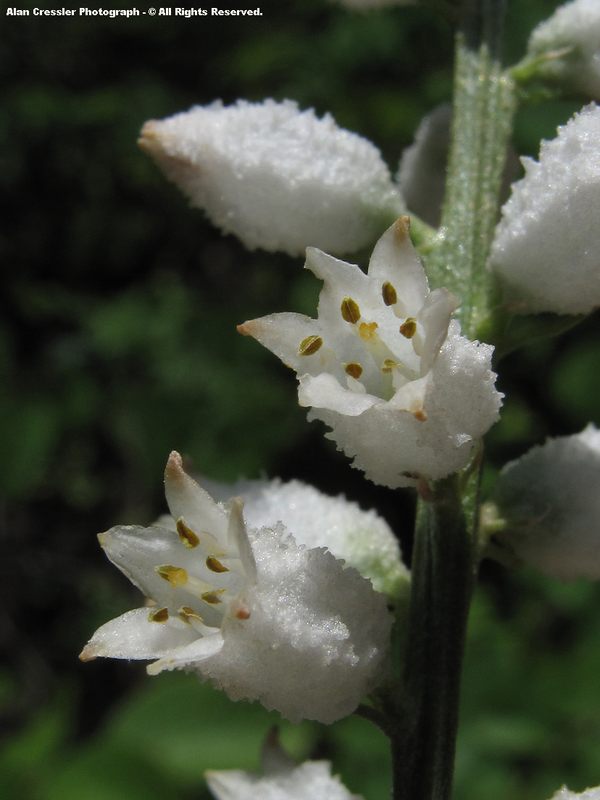 [ The flowers of Foamflower grow on leaf-less stalks, called racemes, with long stamens capped by orange or red anthers that extend outward well beyond the flower petals ]. 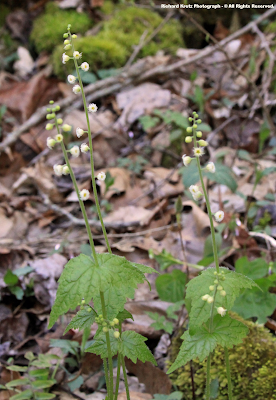 True Miterwort, also called Bishop's Cap, is rather widespread within the mountains and piedmont of Virginia. The beauty of Miterwort requires a magnifying lens in order to appreciate its five delicately fringed petals, possessing a star shape when extended outward ( as in the above plant ). Allegheny Brookfoam ( Boykinia aconitifolia ) is a rare plant species of the High Knob Landform, documented from Wise & Scott counties into the great Cumberland and Brush Mountain wilderness of the Martin's Fork Wild River Area. 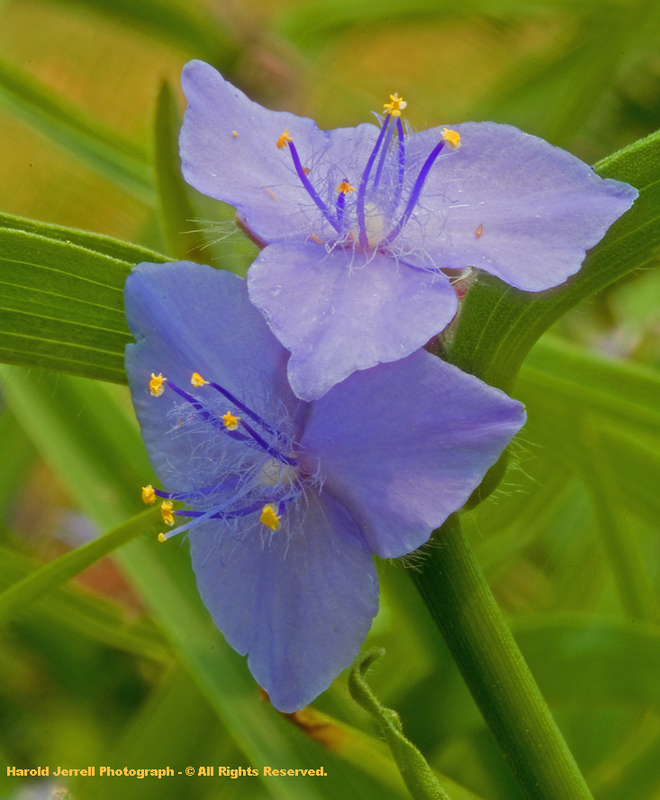 ( Tradescantia virginiana ) . 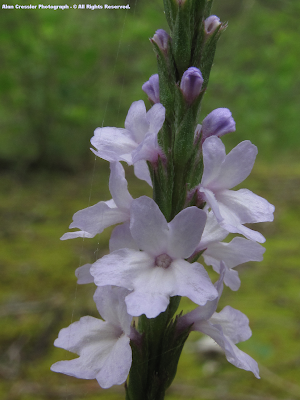 Narrowleaf Vervain is a perennial wildflower arising from deep rhozomes which likes basic soils weathered from calcareous stratas, with blooming from May into June. ( Verbena urticifolia ) . 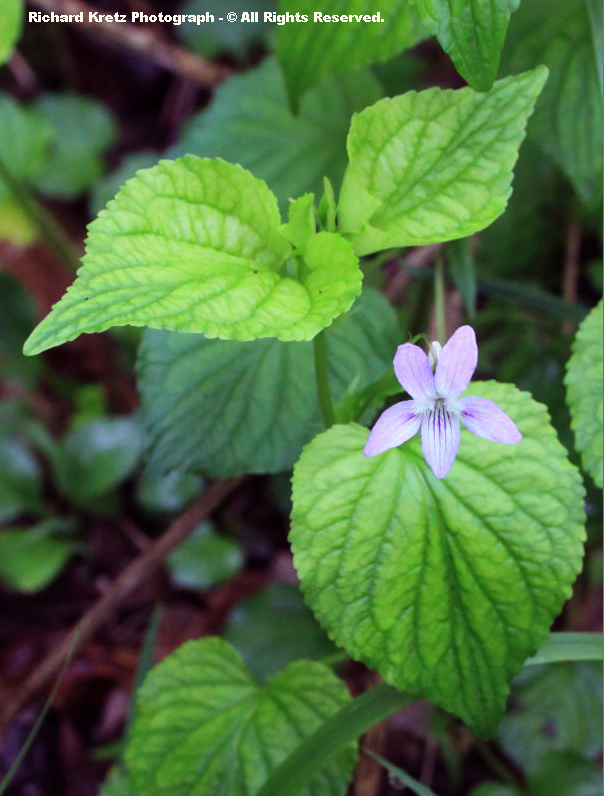 Largeleaf Waterleaf is a wildflower of rich, mesic woods, with a concentration within the High Knob Landform & Upper Tennessee River Basin. Blooming is during May in most seasons. Canada Waterleaf ( Hydrophyllum canadense ) is a mid-upper elevation species of High Elevation Cove Hardwoods & other mesic settings, with typical blooming into June amid the High Knob highcountry. Virginia Waterleaf ( Hydrophyllum virginianum ) is generally a lower to mid elevation species with a more widespread distribution across the Piedmont & mountains of Virginia. Purple Phacelia is a beautiful wildflower which tends to grow in conspicuous clumps where it is found. My nature journal records it blooming during late April and May. 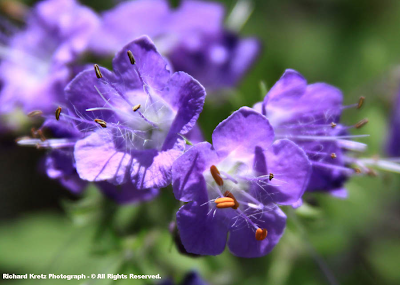 Miami Mist ( Phacelia purshii ) is a lovely species with a concentration within the Upper Tennessee Basin and Clinch River Valley, with documentation within Lee & Scott counties of the High Knob Landform. 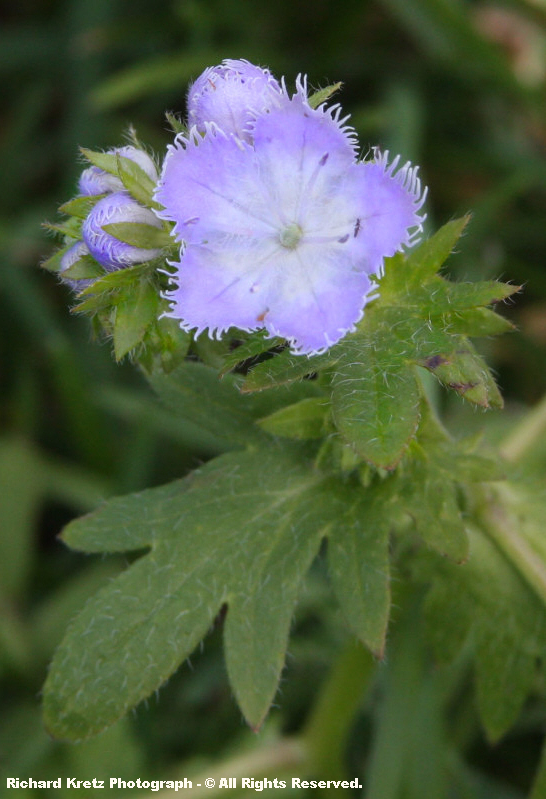 Small Flower Phacelia ( Phacelia dubia var. dubia ) is a species documented in Russell County, and near the southwestern end of the High Knob Landform in Tennessee. 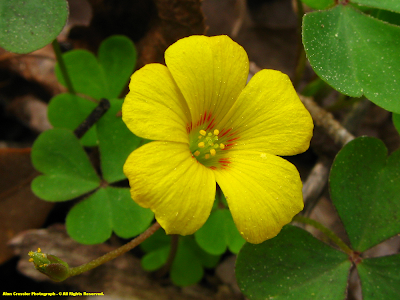 While Mountain Wood Sorrel flowers might appear similar at a glance, the plant is in a different family from Spring Beauty with shamrock, clover shaped leaves. It blooms later in most locations, with my nature journal recording June & July as the months for blooming in the High Knob Massif. 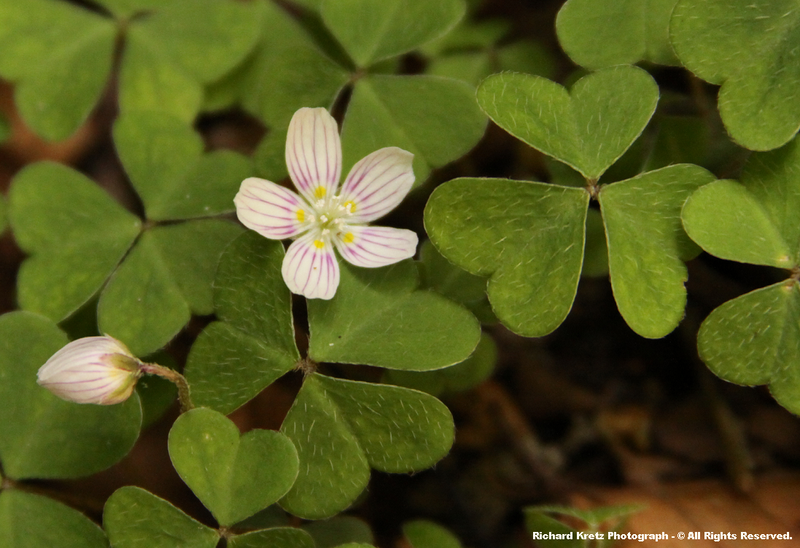 Violet Wood Sorrel is a simply gorgeous species that blooms in the High Knob Landform. It is interesting in that there can actually be two blooming periods during the year, one in April-May and the other during late summer into autumn. 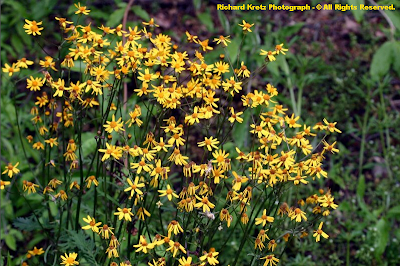 Golden Ragwort is a wildflower that fills pastures and road sides with golden yellow during April and May with a special liking for soils weathered from acid based stratigraphy. 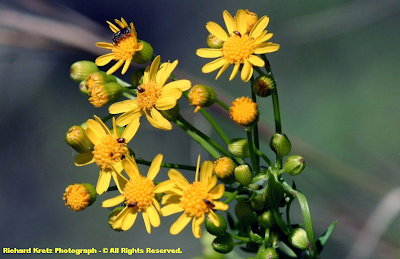 Although blankets of golden yellow beneath trees in pastures look beautiful, most species of Ragwort are poisonous. 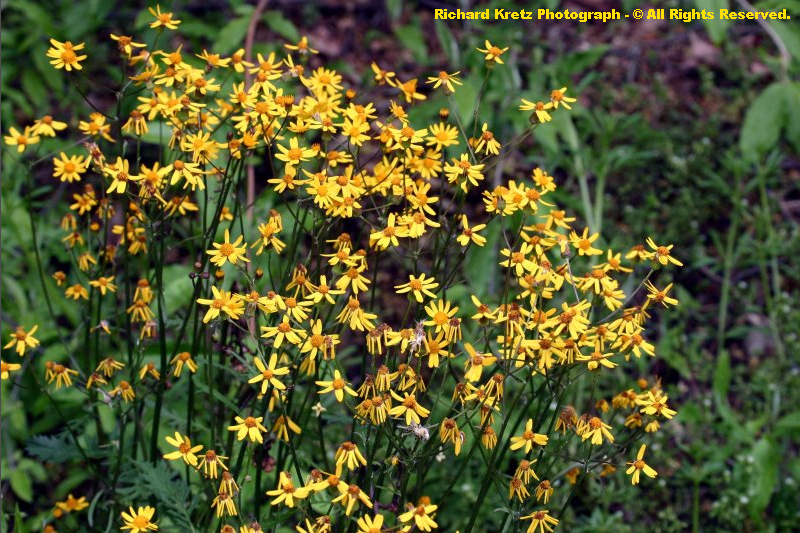 Yarrow-leaved Ragwort is a state & globally rare species known only from Lee and Scott counties in Virginia. It is critically imperiled, and a species of special global concern. Balsam Ragwort is a species with widespread distribution but limited regional concentrations, with a preference for basic soils and part of a rather confusing array of species ( as noted by the Digital Atlas of the Virginia Flora ). Plantainleaf Pussytoes are named for their plantain-like basal leaves. 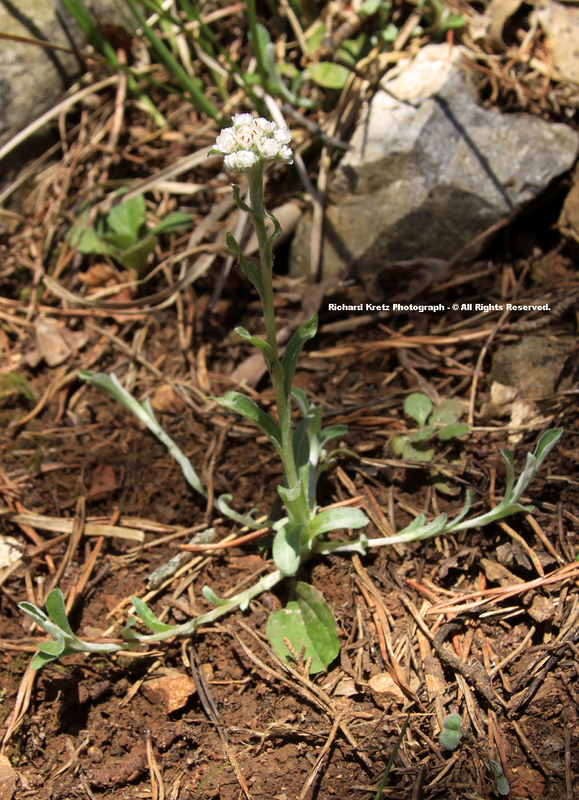 They are part of another complex genus named Antennaria, that is also in need of more herbarium study to better map out its specific species. 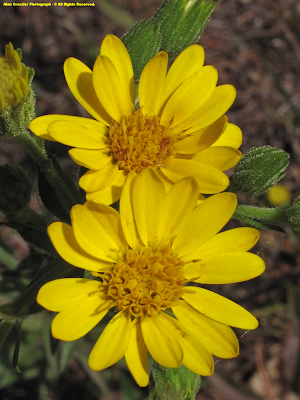 They bloom from late March into May and favor xeric, or dry, well-drained soils. Solitary Pussytoes ( Antennaria solitaria ) are easiest to identify quickly, since they are the only species of Antennaria to produce just a single flowering head ( in contrast to the multi-clustered flower heads of Plantainleaf Pussytoes and other genus members ). 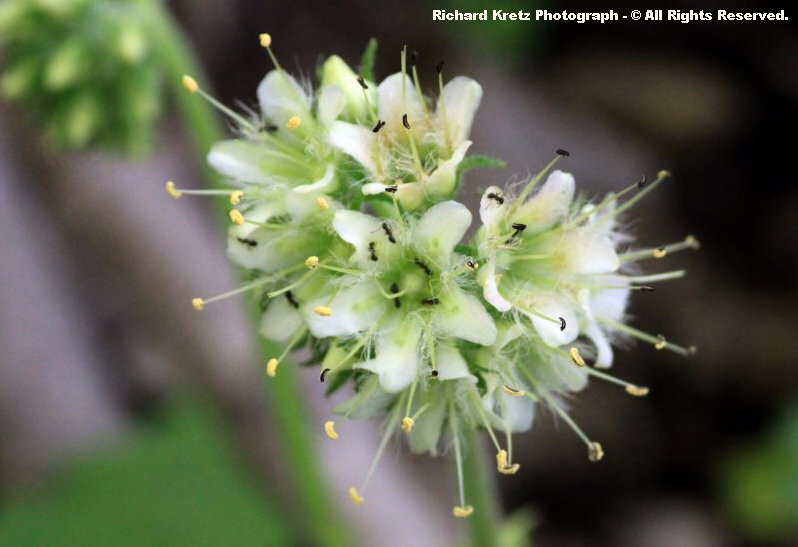 [ Species of the Antennaria genus are Dioecious perennials, meaning that they produce male and female flowers on separate plants ]. 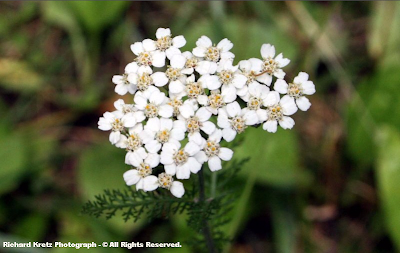 Yarrow is a widespread, very common member of the Composite Family that can bloom from April up until frost each year. 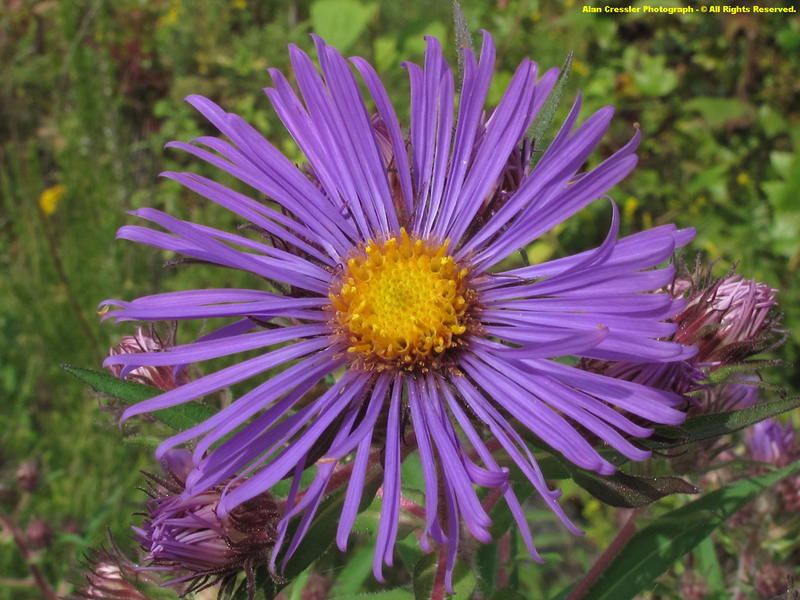 The very large Composite Family, also known as Asteraceae, possesses an enormous number of members such that it comes to dominate the floral color landscape during summer & early autumn. 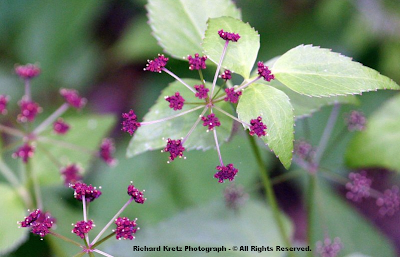 Pink Thoroughwort is a very rare and imperiled species within Virginia, with a concentration amid the High Knob Landform and adjoining counties. 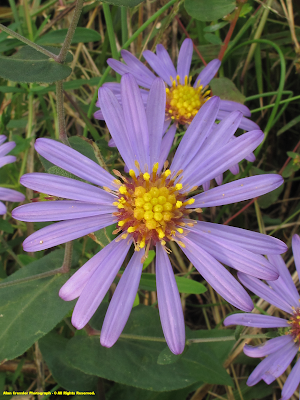 Rough-leaved Aster ( also called Low Rough Aster ) is extremely rare within Virginia, and endangered in Kentucky. Creeping Aster is also listed as being extremely rare in Virginia, with a concentration within the High Knob Landform counties of Wise, Scott, and Lee. 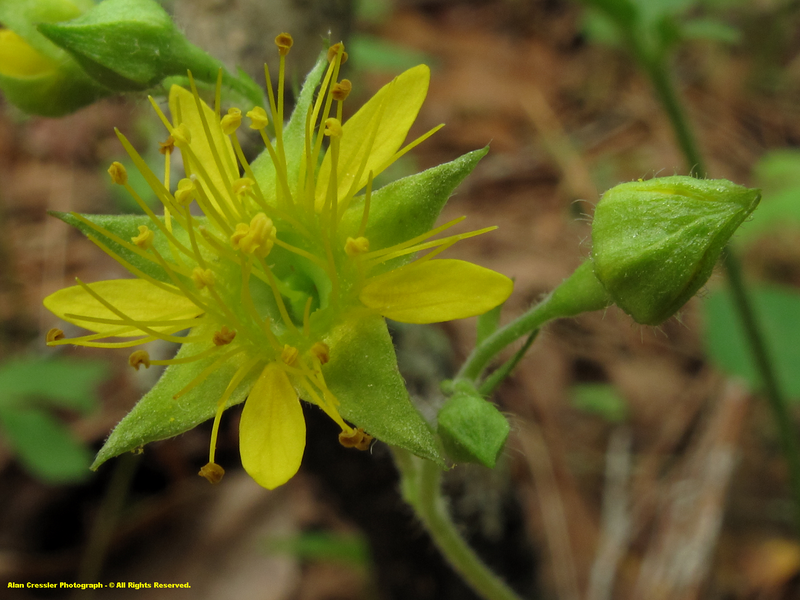 Stiff Goldenrod is very rare in Virginia with documentation so far being only within counties of the High Knob Landform westward of the New River. 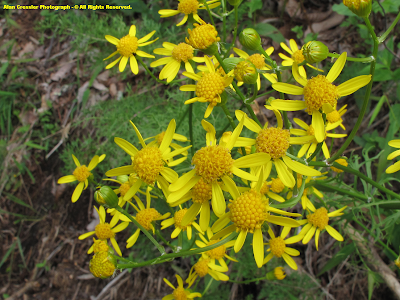 Yarrow-leaved Ragwort ( as noted above ) is both a global and state rarity, with Lee and Scott counties of the HKL being two of only nine counties within North America to be USDA listed for this species. 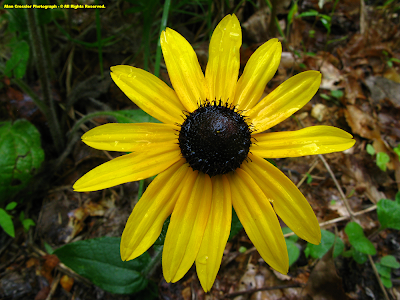 Pinnate-lobed Black-eyed Susan is an extremely rare, critically imperiled species in Virginia. It is found only amid the great belt of calcareous cliffs ringing the High Knob Massif for 50+ air miles ( and one other location in Virginia ). Prairie Rosinweed is also a species that is critically imperiled in Virginia, with Lee being the only county listed in the state ( several counties in the Tennessee end of the HKL are listed ). Barrens Silky Aster is another species which is extremely rare in Virginia, and critically imperiled. It is endemic to calcareous barrens in the HKL. 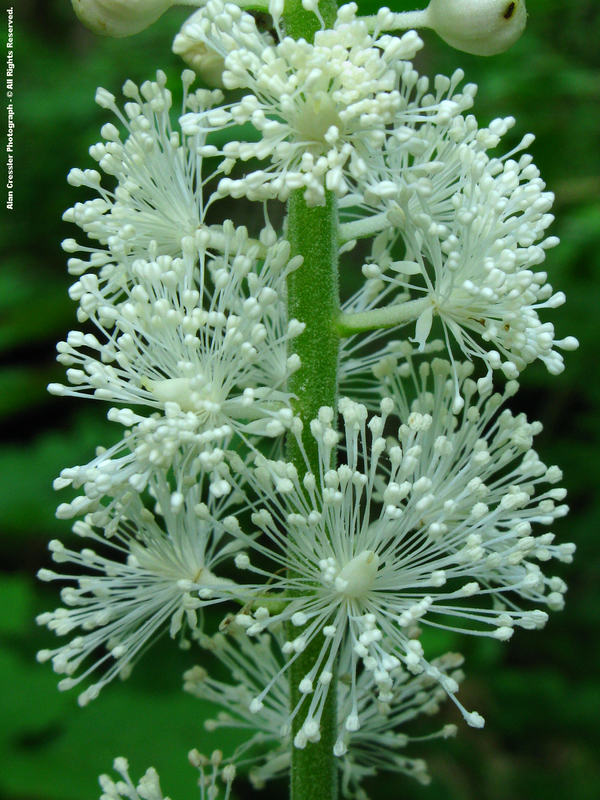 Many other Composite Family members are notable, such as Steele's Joe-pye Weed which is a true southern Appalachian endemic, with the halotype location being High Knob. The Fumitory Family is not complex in terms of having alot of members, in fact, it has very few species which are representative within Virginia in comparison to most floral families. It is placed within this section since the members which are present are nothing less than magnificent! 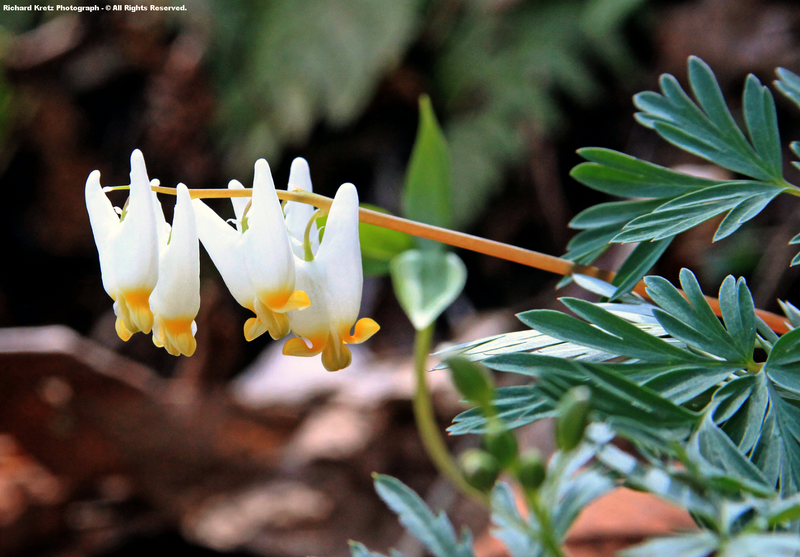 Dutchman's Breeches is typically the first of the glorious Dicentra genus to become showy during early spring, with blooming amid the Powell Valley of the High Knob Landform during April-early May ( although, they are not yet officially listed by the Digital Atlas for Wise & Lee counties ). [ The specimen above was photographed by Richard Kretz in The Pinnacle Natural Area Preserve during early April. 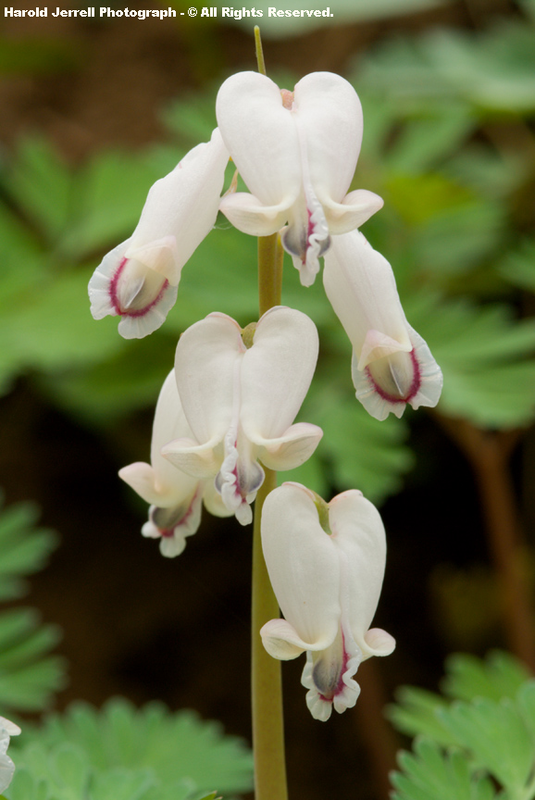 Dutchman's Breeches and Squirrel Corn have both been well documented in Wise & Lee counties of the HKL ( exemplified by Harold Jerrell below ) ]. Squirrel Corn blooms around the same time as Dutchman's Breeches within the great High Knob Landform, coming in perhaps a few days later on average than the little pants hanging upon the "clothes line" of the Dutchman. 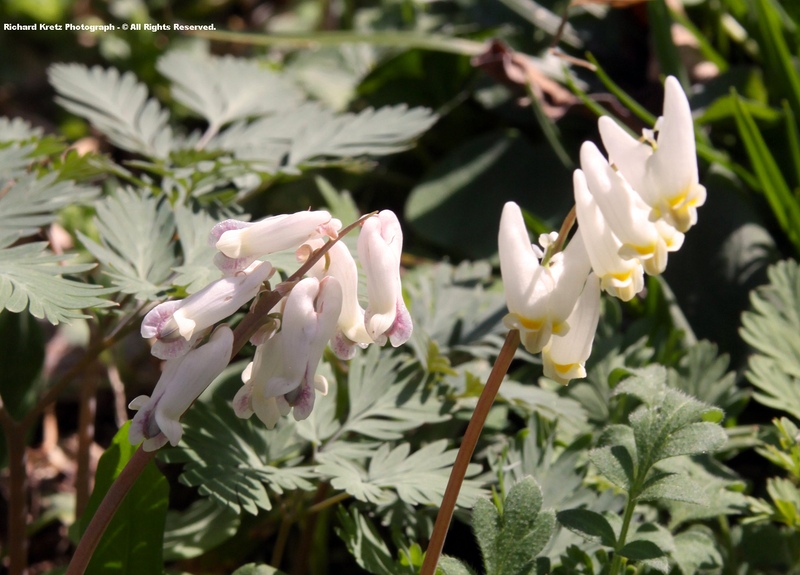 [ Squirrel Corn has not yet been officially listed for Wise, Scott, and Lee counties but has, as noted above, been locally identified and documented. It is restricted to only a few known areas ]. 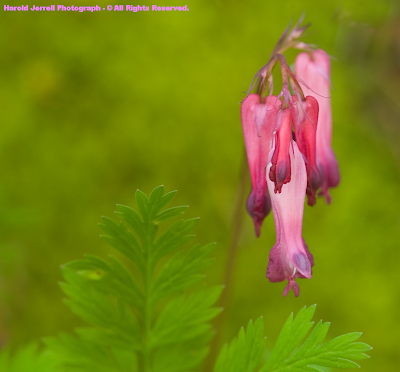 Wild Bleeding Heart is the third member of our beautiful Dicentra genus, with pink flowers and a little later blooming time. [ My nature journal records Wild Bleeding Heart as blooming in Powell Valley of Wise County on May 5 in 2000, along with the last of the Squirrel Corn ]. Although flowers are showy, it should be noted that all three of these Dicentra species are poisonous. In fact, creatures as large as bulls and cows have been killed by eating their leaves during spring. Their extermination over time, within and along pasture lands, has likely contributed to these species being less abundant today. Pale Corydalis is another outstanding wildflower which grows in the High Knob Landform, being clearly identified by its beautiful pink flowers with yellow ends! 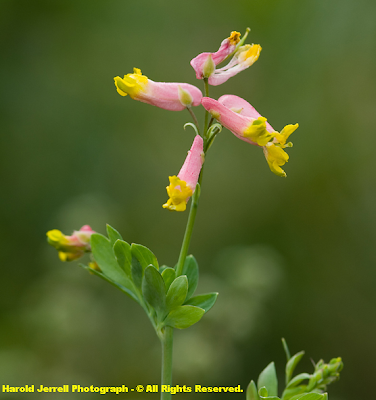 Yellow Corydalis also grows in the area, and has showy flowers which are completely yellow in color. 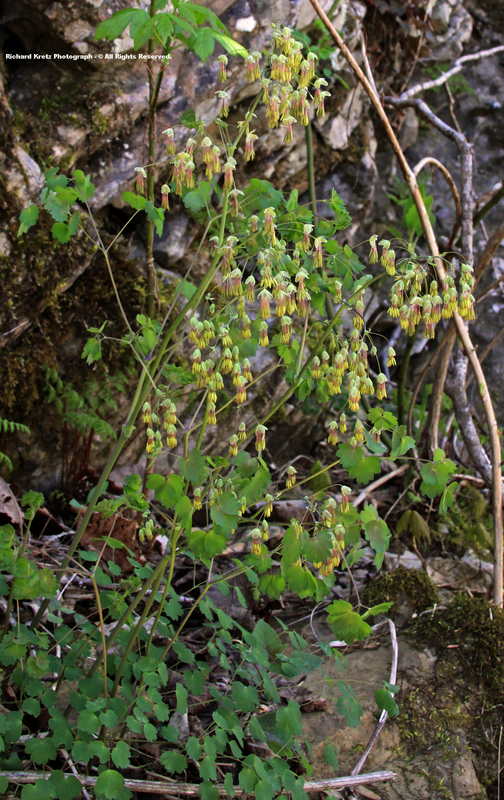 Climbing Fumitory ( Adlumia fungosa ) is a rare species of the mountain area which is considered to be endangered in Kentucky and highly threatened in Tennessee. Dwarf Crested Iris is a common and beautiful spring wildflower that will shortly begin blooming across many lower elevations, if it is not already. 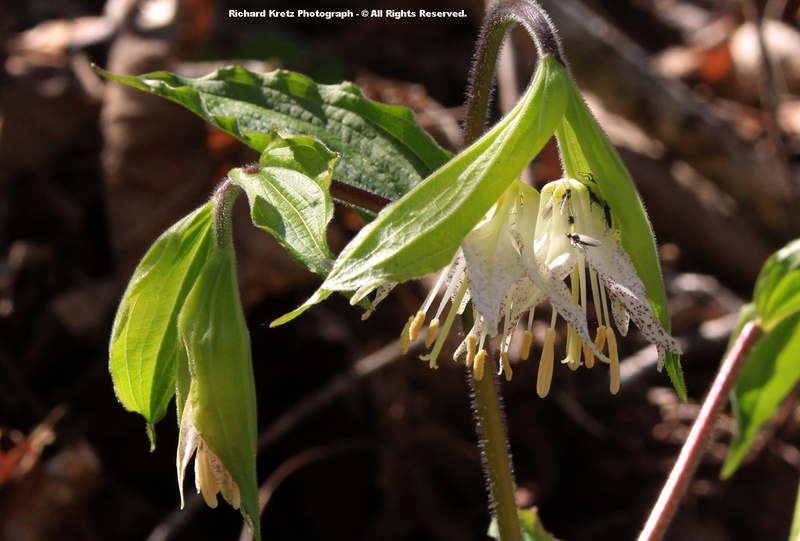 Blooming will continue into May, especially within the higher elevations in rich woods. The Dwarf Iris ( Iris verna var. 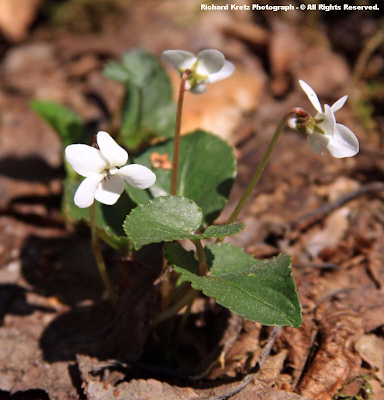 smalliana ) is another species within the High Knob Landform that favors rocky woodlands. 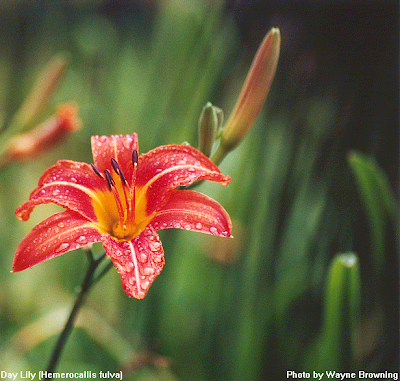 The Yellow Flag Iris ( Iris pseudacorus ) is an introduced species that blooms along streams during May & June. 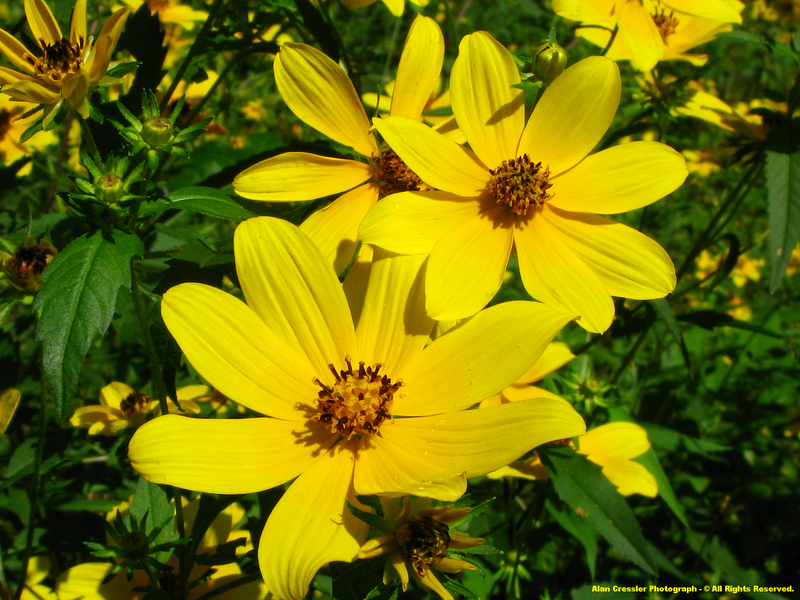 It is considered to be a highly invasive, noxious weed. 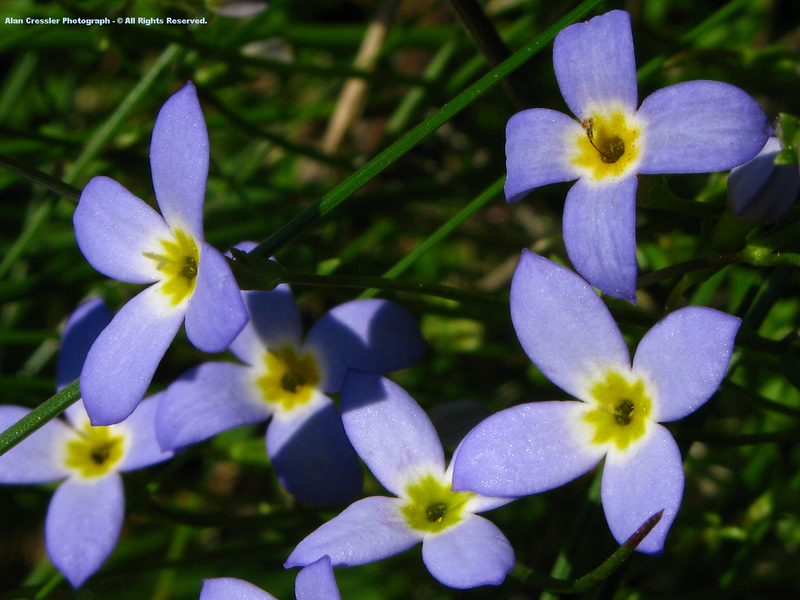 Common Blue-eyed Grass, also known as Narrowleaf, is again not actually a grass, but rather part of the Iris Family. 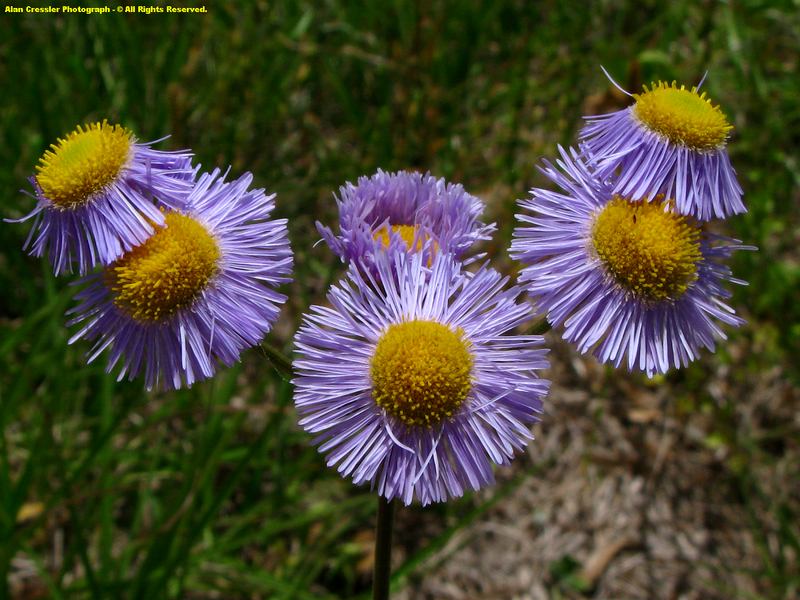 Blue-eyed grasses, like Yellow Stargrass, are often mistaken for grass until they erupt with gorgeous blooms! White Blue-eyed Grass is a rare species found only within the High Knob Landform counties of Lee & Scott, as well as Giles, in all of Virginia. 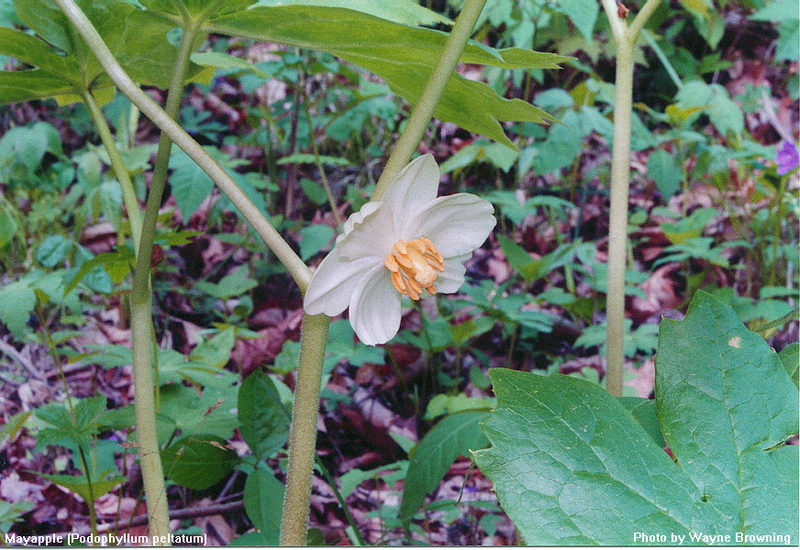 Large patches of Large-flowered Trillium will soon turn the woods white in portions of the High Knob Landform, with a notable and gradual change of the petals into various shades of pink with age. 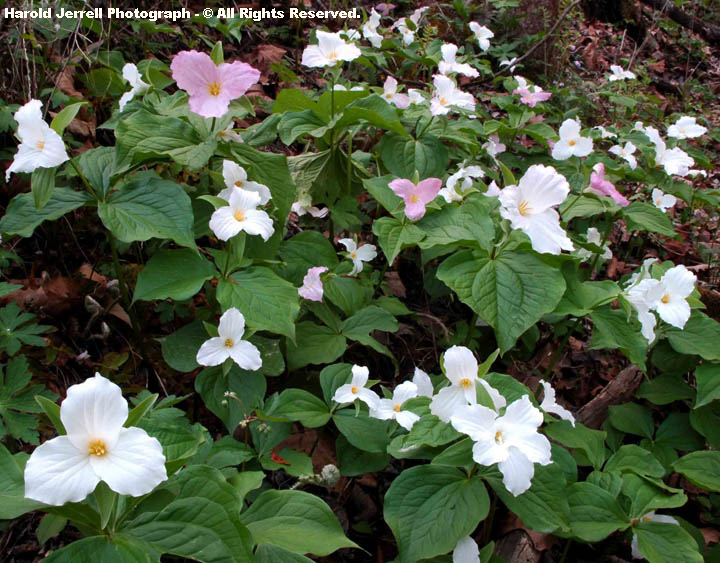 Entire slopes covered by gorgeous, multi-colored Trilliums are a sight to behold! 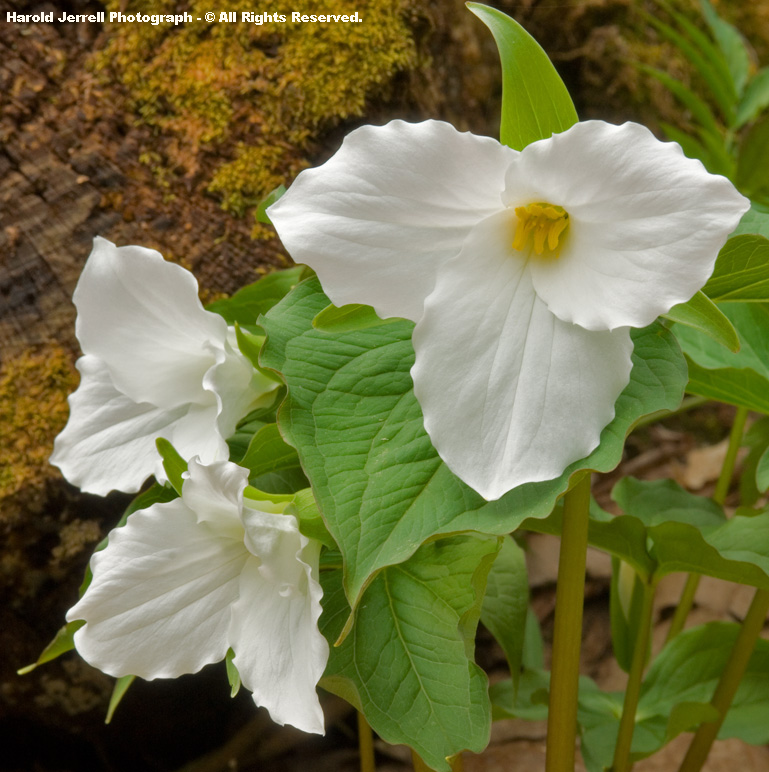 The Large-flowered, also called Great or White, Trillium makes an excellent subject in the light of morning, against lingering blackness, with Roddy photographing beautiful specimens on April 11. 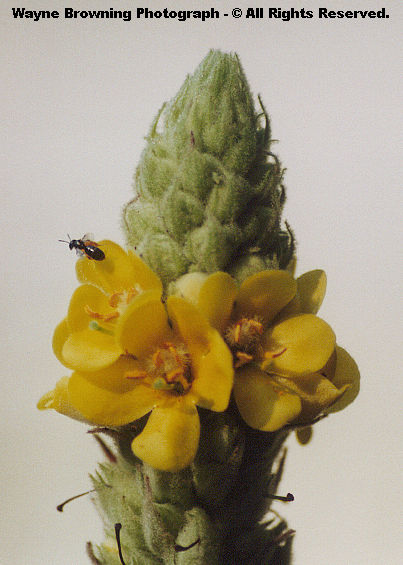 A significant amount of pollen is visible from the two pairs of three yellow anthers. 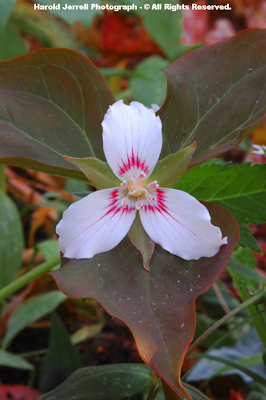 Note Trillium lives up to its name with 3 sepals and 3 petals above a single whorl of 3 leaves to go along with its anther trios! 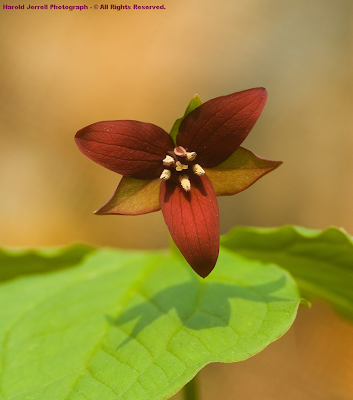 Red Trillium, also called Wake Robin, is a species that looks so gorgeous but smells so very BAD! Yes, indeed, this beauty smells like fetid, putrified meat ( at least, to many folks )! [ Other locally common names for this species include: Stinking Willie & Stinking Benjamin ]. Again, there is much more than meets the eye with Trilliums, and it has nothing to do with some of their stinking kin! 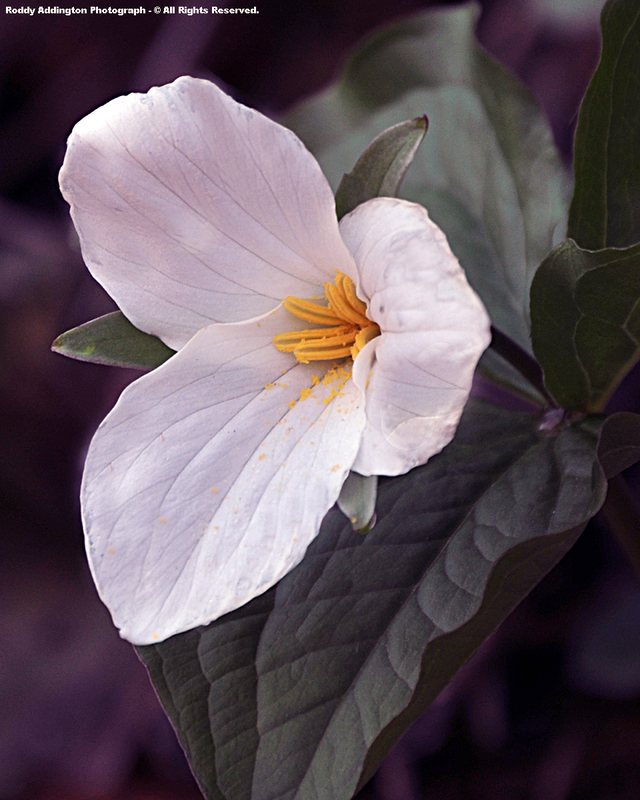 Wake Robin can take on various colorations, so that the name Red Trillium might not be the best ( but often tends to be the most common color form ). Mountain Red Trillium, also called Furrowed Wake Robin, is a species only recognized in recent decades and tends to be a higher elevation variety associated with Southern Appalachain Northern Hardwoods & High Elevation Cove Forests ( as well as the fingers of Mixed-Meosphytic Northern Hardwoods that I locally associate with cold air drainages in the massif ). Complications again arise with white forms of Furrowed Wake Robin, such that it can often be difficult to distinguish from white morphs of the Wake Robin ( Trillium erectum ). [ In an idealistic situation, the Red Trillium in Powell Valley would give way to the Mountain Red Trillium of the High Knob highcountry, ah, if only it could be that clearly defined! ]. The most gorgeous Painted Trillium of the High Knob highcountry is clearly distinguished as a lover of cool, mesic, upper elevations with an acidic soil tendency. 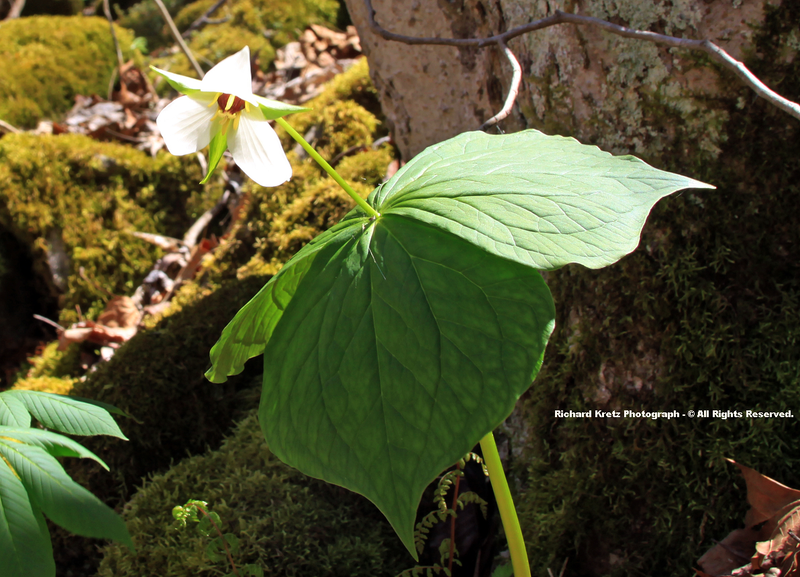 [ The LIFE history of a Trillium is little known but fantastic, as attached to its seeds is a segment rich in oils which attracts ants. Like the hard workers they are, the ants carry away the seeds, eat their oily segment, and leave the seeds in place to eventually germinate ( another wonderful example of dispersion for a species rooted in the ground, without legs or wings! ). 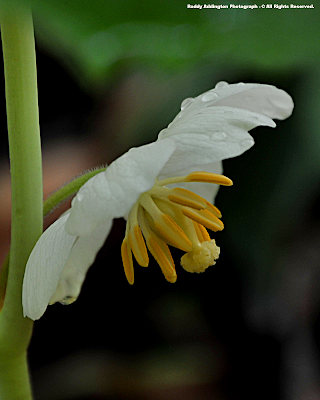 However, the germination process takes time, such that going from a mature, seed producing Trillium to a new plant which flowers may take 4 to 6 years ( under good conditions ). One established individual Trilliums and their colonies can live for decades, if left undisturbed, and be dependably found in the same locations each year. 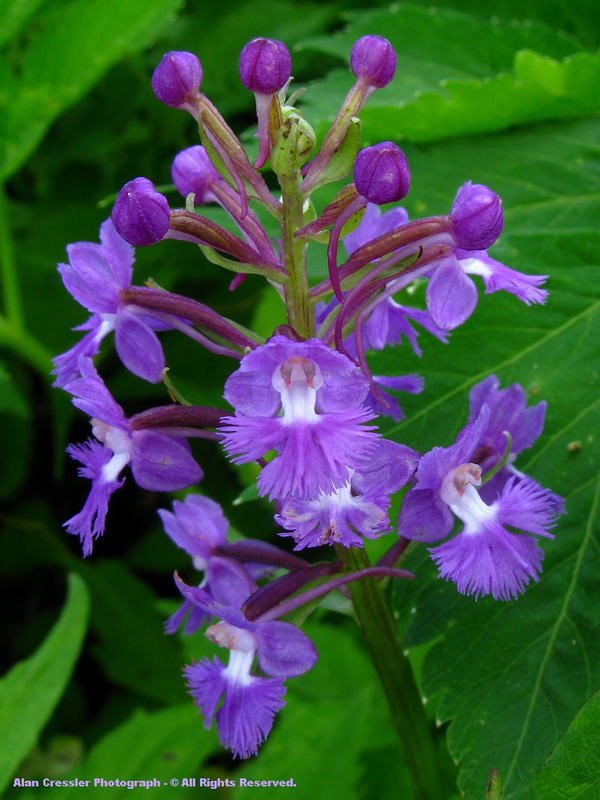 Thus, like the majestic Orchids, they should never be picked from the wild ]. 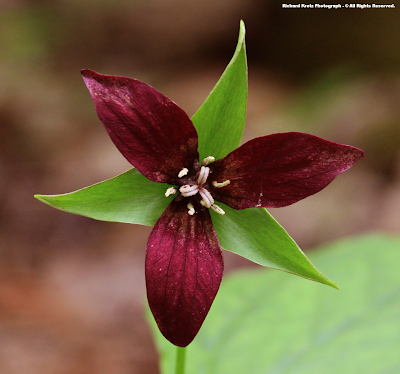 Nodding Wakerobin Trillium ( Trillium flexipes ) is another local species possessing a midwestern floristic affinity, which has reached into western flanks of the Appalachians. 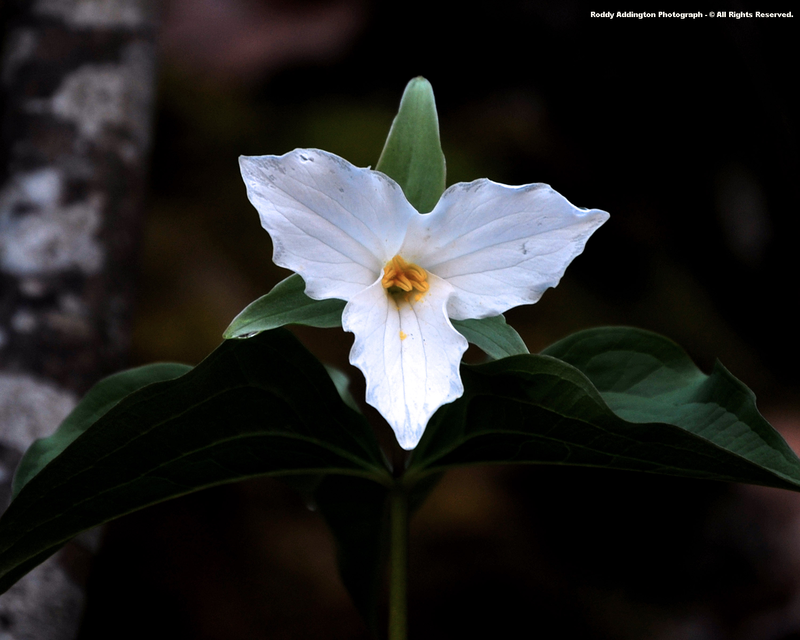 Sweet White Trillium ( Trillium simile ) is perhaps the most controversial local species, with an apparently narrow elevation range ( 1500-2000 feet ) and difficult identity via tendency to hybridize ( will require more DNA work ). 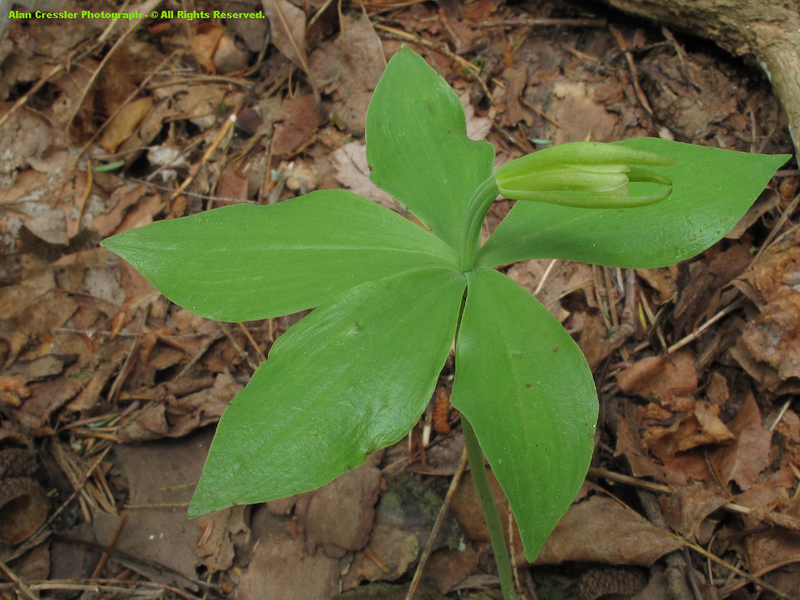 False Solomon's Seal is a member of the Lily Family, like the Trilliums, and ironically is more common and showy in nature than what is called Solomon's Seal ( see below ). 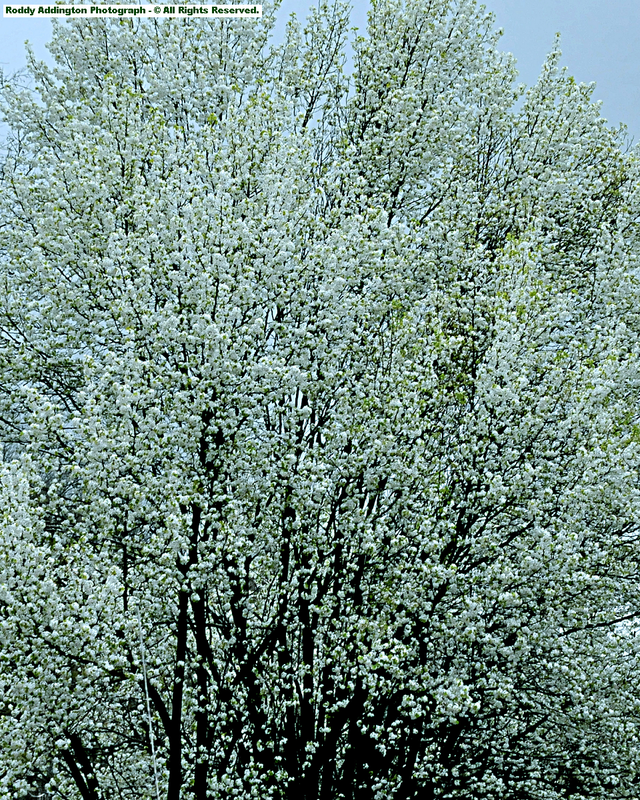 It blooms from April into June with variations in elevation. False Solomon's Seal blooms around the same time as Wild Geraniums ( Geranium spp. 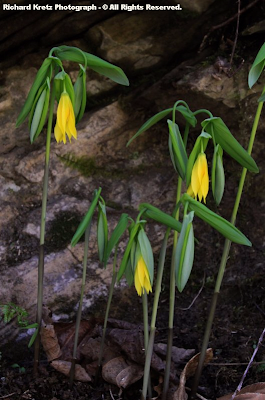 ), well illustrated by Harold's gorgeous photograph above [ also visible in this scene are the unfurling fiddleheads of what is likely Christmas Fern ( Polystichum acrostichoides ), and the growing plants of Mayapple ( Podophyllum peltatum ) ]. 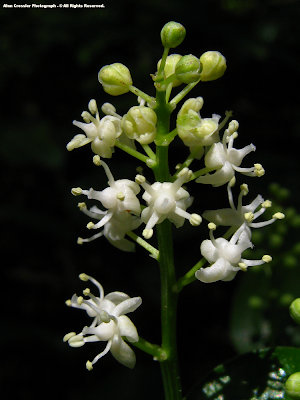 Starry False Solomon's Seal ( Maianthemum stellatum ) is a species documented within Russell County that may also range into the High Knob Landform. 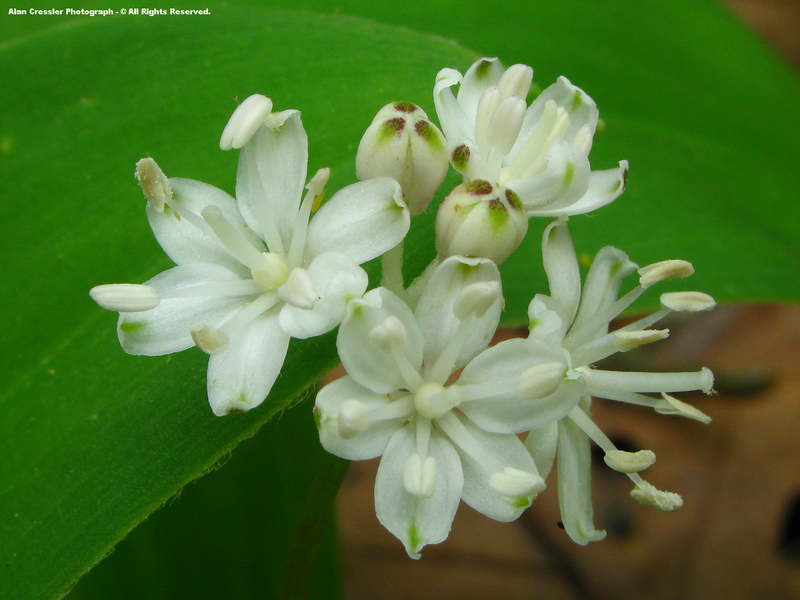 Canada Mayflower ( Maianthemum canadense ) is a common mid to upper elevation species in the High Knob Massif and the third member of the Maianthemum genus within the richly diverse Upper Tennessee River Basin. [ Canada Mayflower is a later blooming species that can often be found within the High Knob Massif during June & July ]. 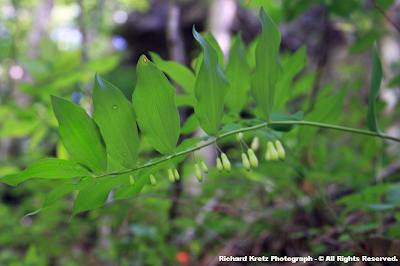 Solomon's Seal is a big plant which demands attention, growing up to 4 feet or more in length under ideal conditions, but is not nearly as showy as False Solomon's Seal. ( Polygonatum biflorum var. commutatum ) known from upland habitats but in need of more study. 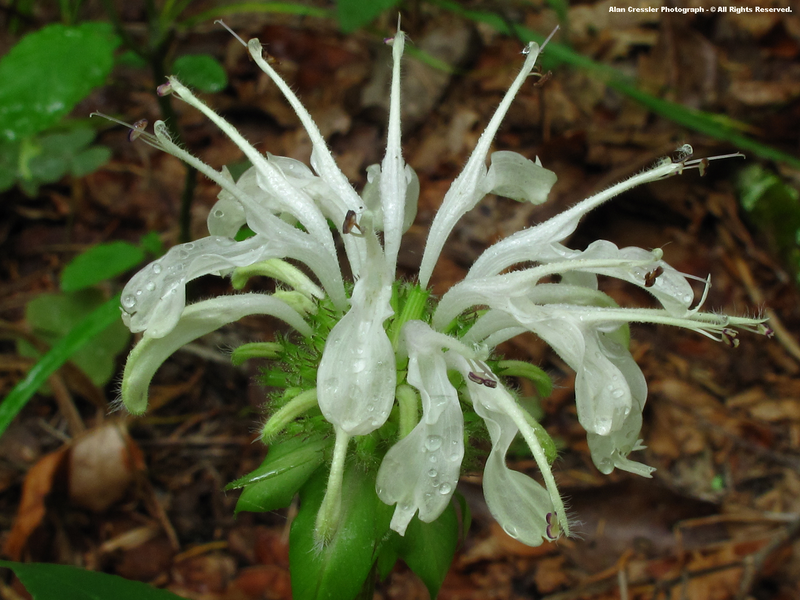 Spotted or Nodding Mandarin is a relatively rare species of moist slopes and coves across the High Knob Landform, which is at the center of its southern Appalachian stronghold as a limited range species. It is also a member of the Lily Family. 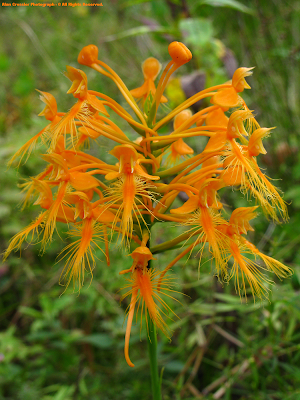 Yellow Mandarin ( Prosartes lanuginosa ), also called Yellow Fairy Bells, is an upland species that possesses a much more widespread distribution. Large-flowered Bellwort is a species favoring calcareous stratas of the High Knob Landform, and is most widespread within the karst belt of Virginia where it can find alkaline to neutral based soils. It will grow in other locations, but does best within soils weathered from limestone or dolostone. 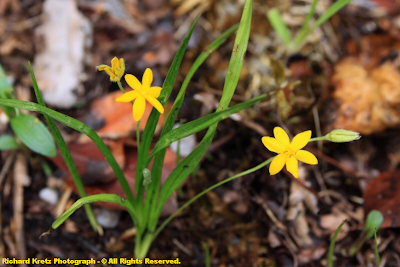 Yellow Stargrass can often be found in woods and does not look like a wildflower at all, until it blooms! It is part of the Lily Family as well. 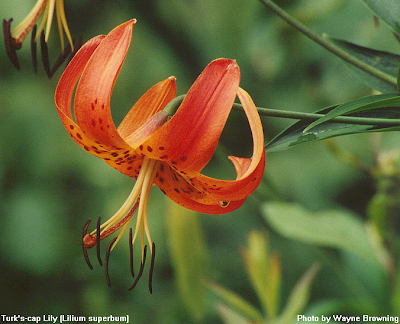 In fact, there are MANY other members of the Lily Family which will be of special interest in coming weeks and months. 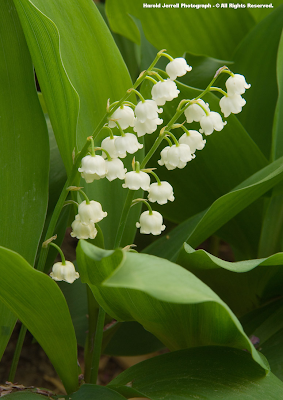 Lily of the Valley is a beauty which blooms during late spring into early summer within the High Knob Landform & Upper Tennessee Basin. Turk's-cap Lily blooms within the High Knob highcountry during summer, with my nature journal recording mid-July for blooming at highest elevations ( transplanted species often bloom during June within Powell Valley of Wise County ). 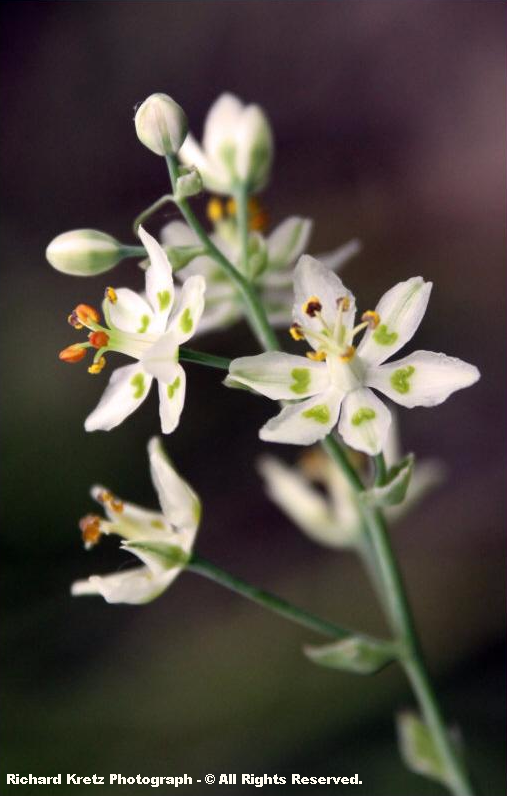 Mountain Deathcamas, also known as White Camas, is a rare plant documented within Wise, Scott, & Russell counties, as well as a few others within the Virginia karst belt. 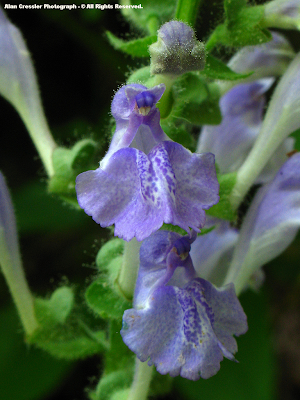 It is a summer blooming species. 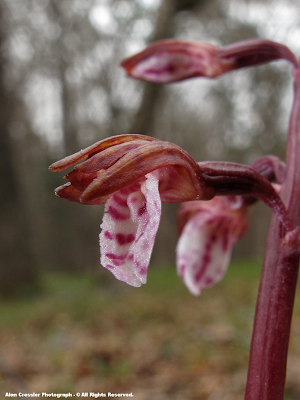 Speaking of showy, the Showy Orchis is a southern Appalachian endemic species which also begins blooming within the High Knob Landform and Clinch River Valley during April into May. 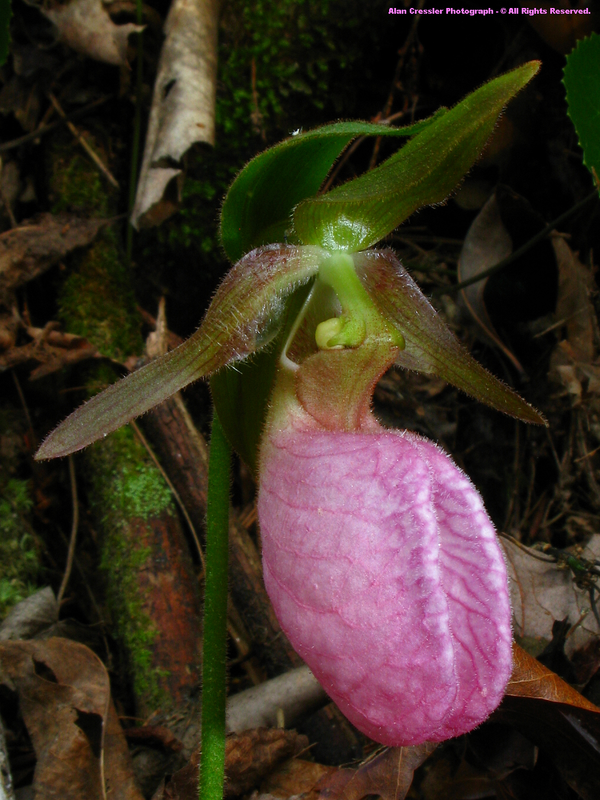 Around three dozen species of orchids have been documented within this area, with variable blooming times during the year. 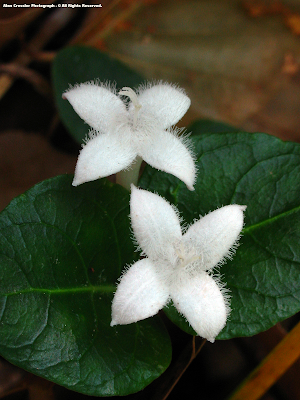 ( Tipularia discolor ) . ( * ) Documented in either Dickenson and/or Russell counties. 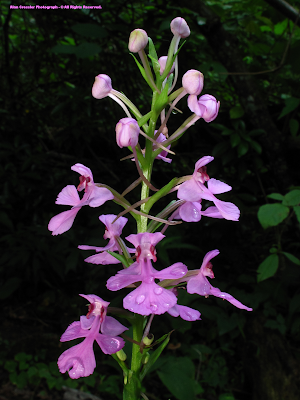 Tuberosus Grass-pink Orchid is very rare and imperiled within Virginia, and one of numerous species of note. Small Spreading Pogonia is also a very rare orchid in Virginia, being documented within the High Knob Massif and only three other counties in the state. 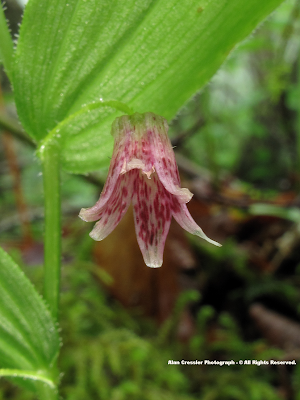 Small Whorled Pogonia is very rare on the global level, and is listed as Federally Threatened as well as State Endangered. 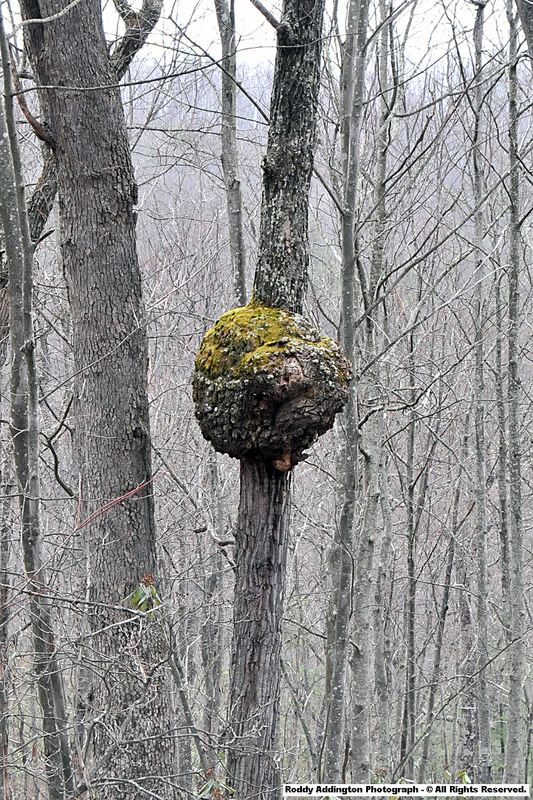 It has only been found within the High Knob Landform west of the New River ( i.e., officially documented ). 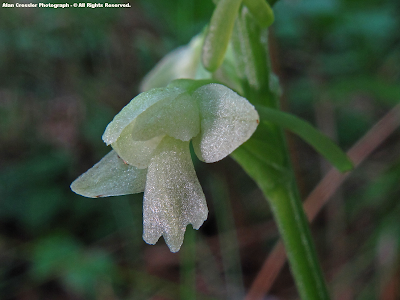 Bog Twayblade or Fen Orchid is also very rare within Virginia, with only the High Knob Massif being listed for it west of Mount Rogers. Nodding Pogonia is extremely rare within Virginia, and is also a globally rare orchid. 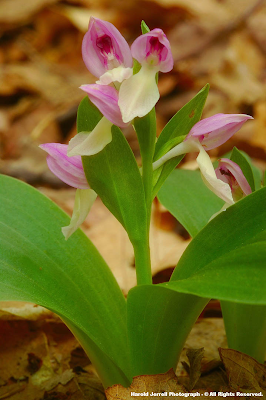 Yellow Crested Orchid is not listed on the Digital Atlas west of the Virginia Coastal Plain, but has been documented within the Martins Fork Wild River Study Area of the High Knob Landform. 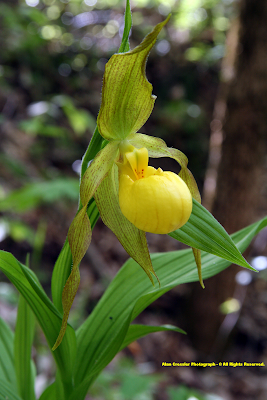 [ Yellow Crested Orchid is therefore considered to be a mountain disjunct in Virginia, where it is typically a coastal plain species ]. Rose Pogonia Orchid and the Great Plains Lady's Tresses are rare orchids which are possible within the High Knob Landform. 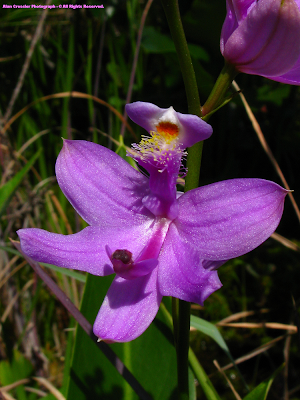 Removing any orchid species from its natural environment often results in its death, since this special relationship is ended when someone digs up the orchid. [ That is the reason so many Lady Slipper Orchids have been lost since people who dig them up, to take home, typically have them die! ]. 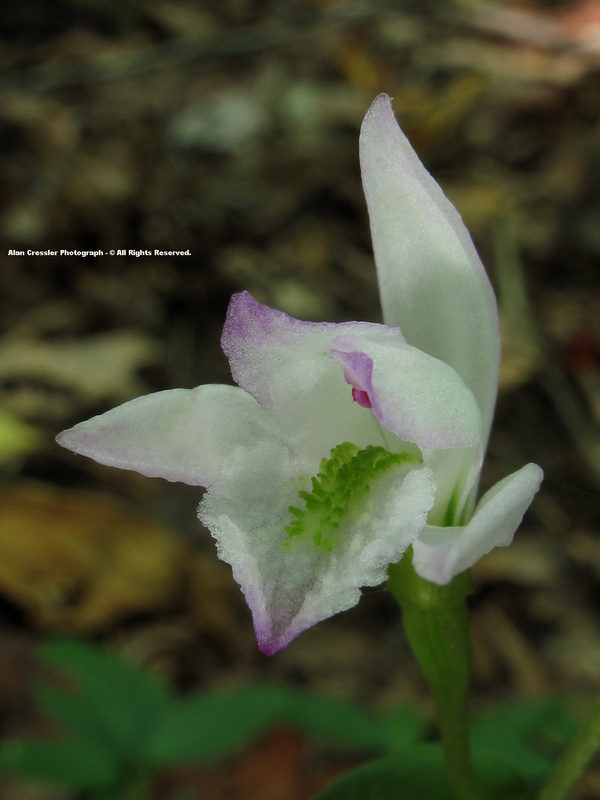 Orchids are a very nice floral example of the great biodiversity of the High Knob Landform & Clinch Valley of the Upper Tennessee River Basin, and the adjoining Upper Cumberland Basin ( along the northwestern flank of the HKL ). [ A combination of a diversely varied geology, topography, and climate has made this ancient mountain landscape a haven for varieties possessing northern, southern, & midwestern affinities. 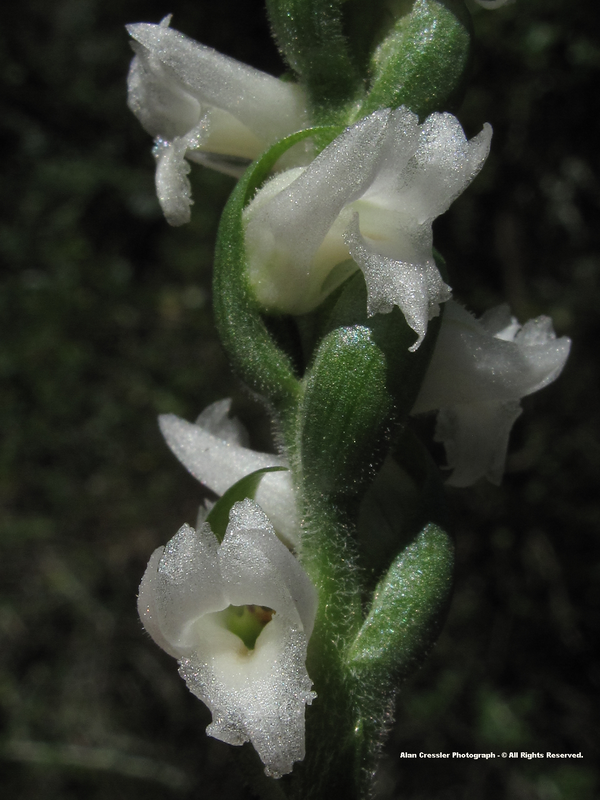 During the course of millions of years this has allowed for the establishment of relics, limited range species, and for a general diversification of this wonderfully beautiful floral group. 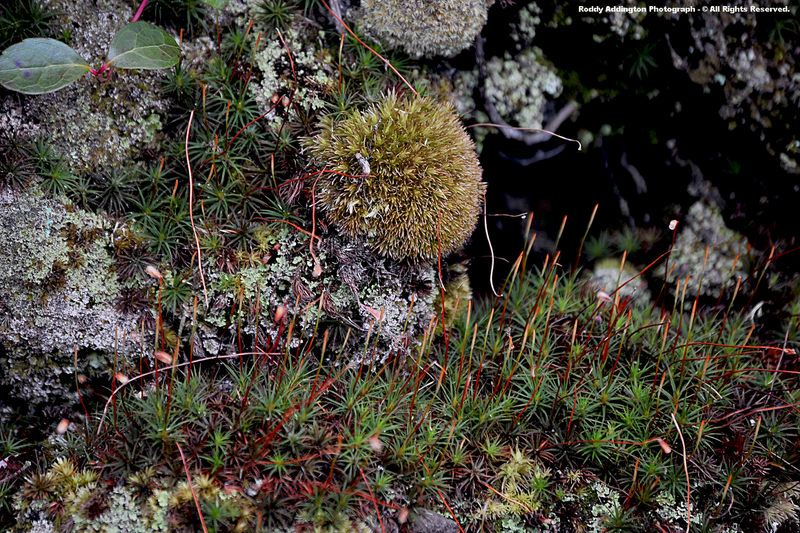 One of many examples which could be cited to illustrate the great biodiversity of this landscape ]. 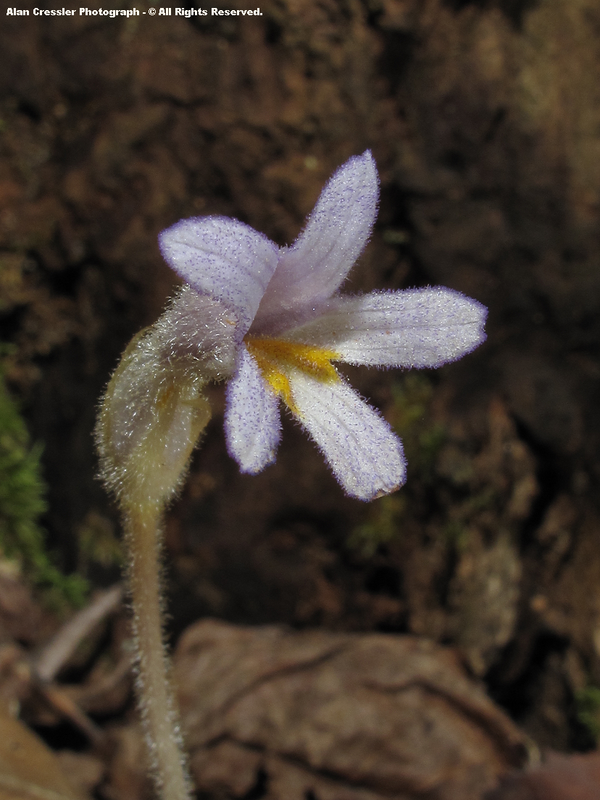 Long-spurred Violet is a lovely native species currently in bloom, and unlike so many within the complex Viola genus is very easily identified by its upward curved, horn-shaped spurs. Canada Violet is a lovely mid-upper elevation species to watch for in coming days and weeks across the High Knob Massif. It is common within woods of the cool, mesic northern slopes and high basins ( blooming late April into June ). 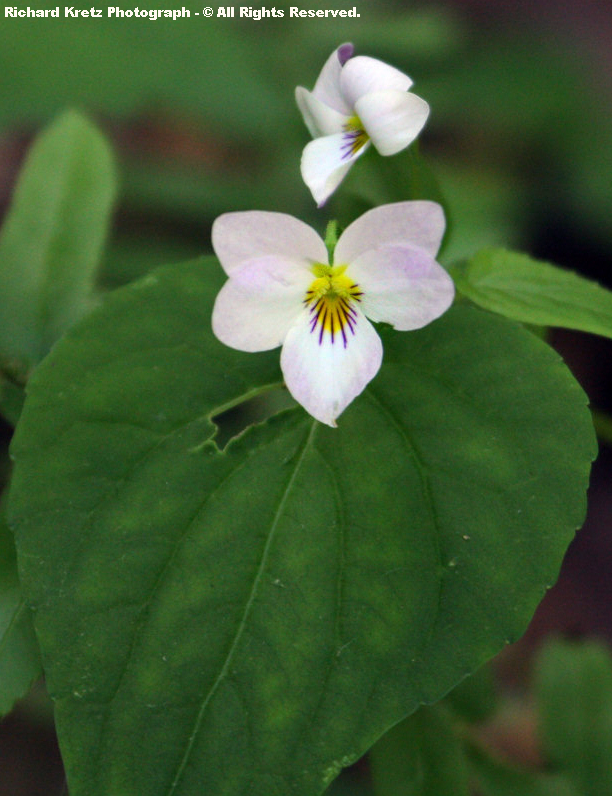 Sweet White Violet is a species that tends to be associated with the endemic Southern Appalachian Northern Hardwoods of the massif. Prostrate Blue Violet ( Viola walteri ) is a very rare violet species that is mostly restricted to the Clinch River & New River basins within Virginia. 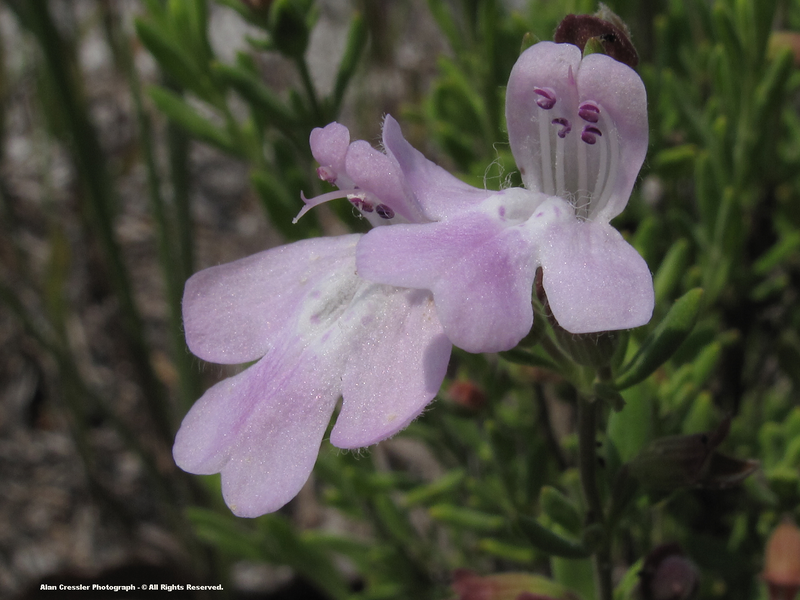 Alpine Violet is mostly a species of the far north and mountains, however, its been documented on the USDA database from Greenland all the way south to include one county in north Florida. 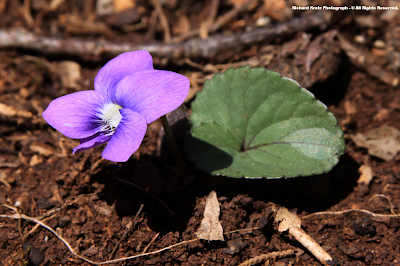 Violets are indeed a confusing group, with many more species likely living in the mountain area than have been documented. [ My friend and naturalist Richard Kretz believes there could be as many as 70 different species within the area, with only time and detailed analysis telling from the dozens already found ]. ( Viola tripartita ) . 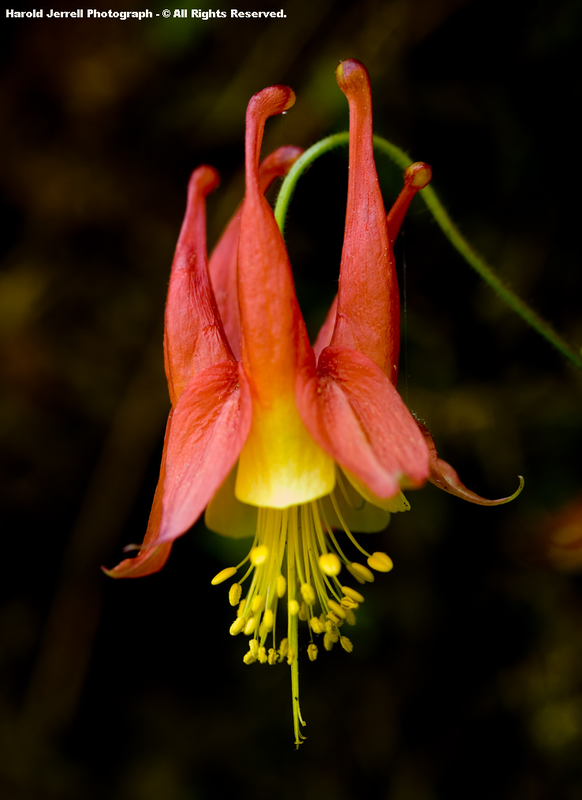 The magnificent Wild Columbine is a species of the High Knob Landform that will bloom by late April into early May at lower elevations. 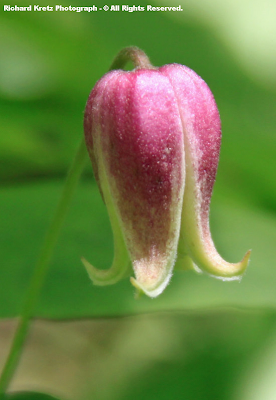 [ Wild Columbine has been locally verified as blooming within the High Knob Landform of Wise County, Virginia, but has not yet been officially listed for this county ]. By the time Wild Columbine blooms, our favorite little flying machines will be on territory and more than ready to become their ace, number one pollinators, as they are best adapted to reach nectar stored high within their red spurs! In so many extraordinary ways, spring rebirth is a season of such grand colorations! Not since the glorious autumn show, and perhaps not even then, have I done a HKL website update with so much COLOR. 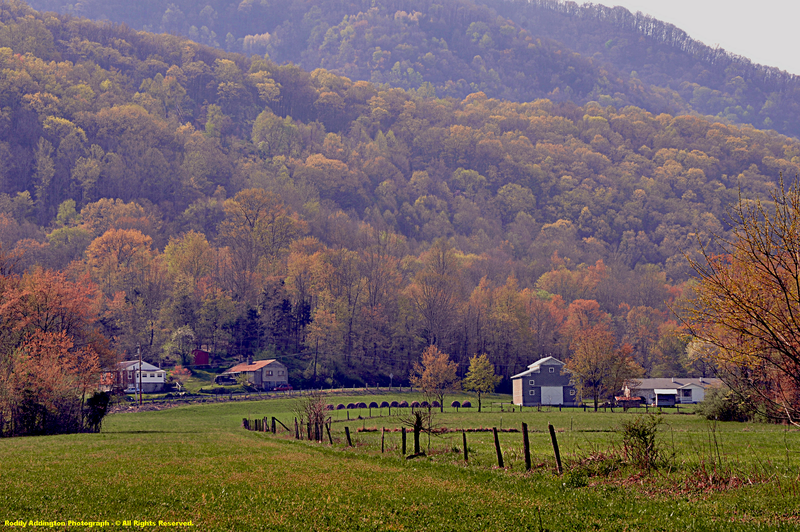 A testimony to the true magnificence of SPRING amid the Southern Appalachians! Even what some might consider our "crawling nasties" have attractive color amid this new season of life! The Eastern Garter Snake is one of at least 17 different snake species documented across the High Knob Landform & Upper Tennessee Basin. Much like Red Trillium ( Trillium erectum ), the Southern Green Stink Bug is "easy on the eyes," but not the nose if agitated. Whew! 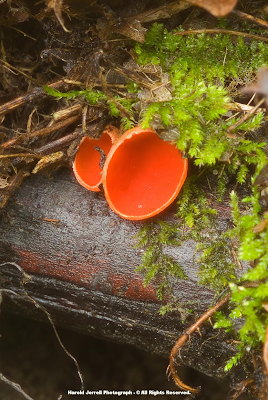 The brilliant Scarlet Cup is the fungi of color early in spring, as highlighted during the last update by Richard and now by Harold. Although not nearly so beautiful, the next mushroom group is the one most hunted at this time of year. 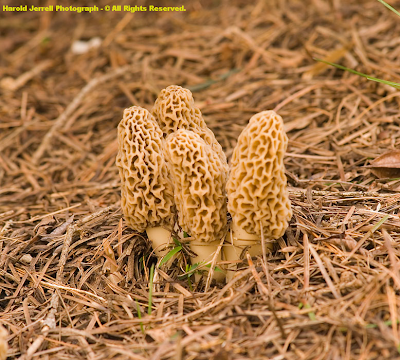 Yellow Morel Mushrooms, known locally as Dry Land Fish for the way they taste when rolled in batter and fried, are a very much looked for treat during spring in the Appalachians. 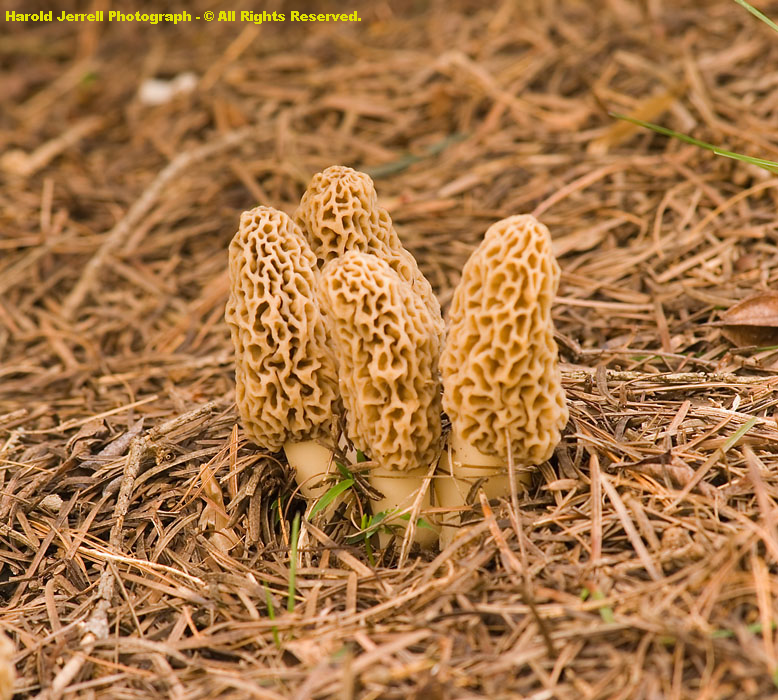 Black Morel ( Morchella elata ) and Half-free Morel ( Morchella semilibera ) mushrooms also grow in the High Knob Landform, but be wary of the False Morels of varies different species since they are poisonous! 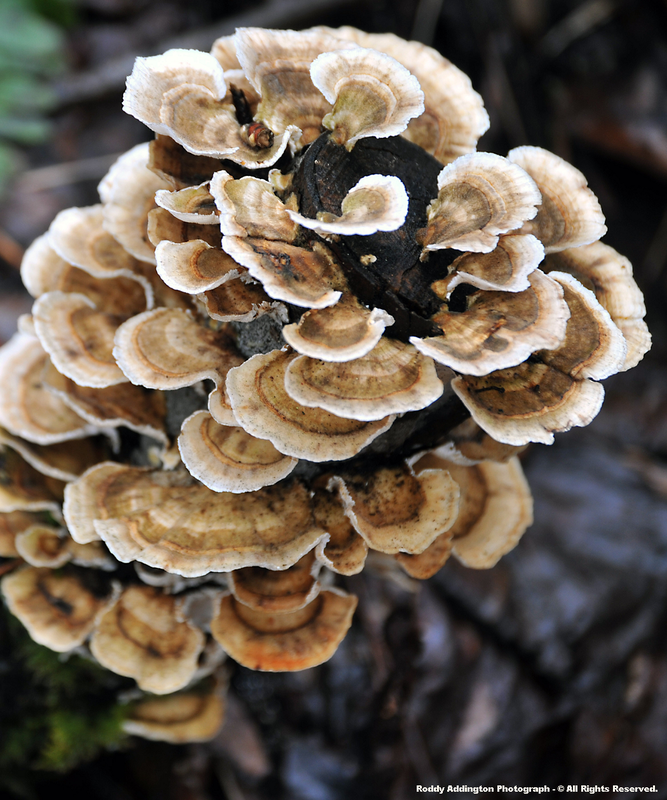 As should not need be stated, NEVER eat any mushroom unless you are 200+ percent certain its edible! 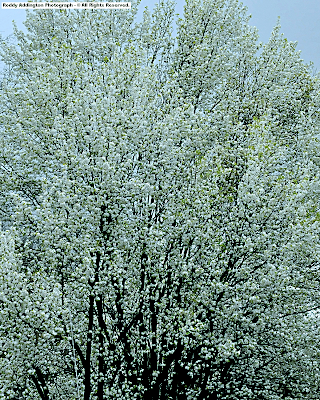 Bradford Pear is a favorite cultivated tree species that is planted for its outstanding spring & autumn displays. Most may only dream about what it might be like to greet a glorious dawn within the gazebo above, situated within a lush, green valley beneath rippling wave clouds illuminated by morning light of sunrise over the great spreading mass of the High Knob highcountry ( with birds singing & the fresh smells of spring )! Once bright sunshine illuminated this great mountain landscape, the views were not bad either! The gorgeous scene above looks from the Valley floor, in the Cracker Neck section of Wise County, into the opening of South Fork Gorge of the High Knob Massif. 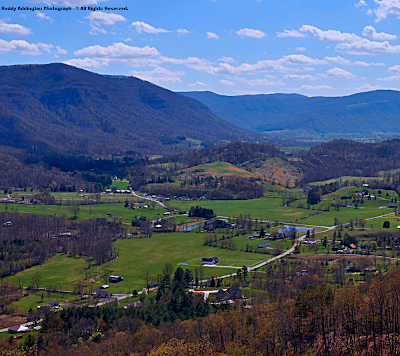 The beautiful view below looks at the other end of this great V-shaped Valley, from scenic Powell Valley Overlook. 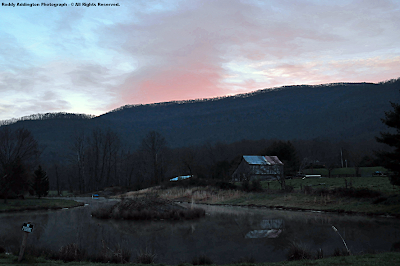 Clearing skies behind the passage of a cold front, which brought 1.00" of rain to Big Cherry Basin of the High Knob Massif, set the stage for a couple of frosty cold nights ( with hard freezes ). Temperatures dipped into low-mid 20s within cold air pockets of the High Knob Massif, with a hard freeze also occurring amid the Norton to Coeburn valley corridor as cold air drained down out of the sprawling highcountry. With dry air aloft, temps were plunging again in mountain valleys into early hours of April 12, with 35 to 40 degrees in colder locales by 1-2 AM. 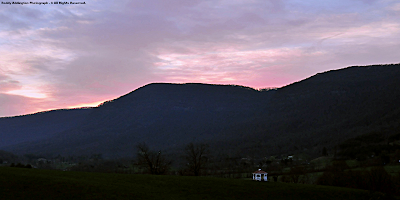 Morning mins into dawn on April 12 reached 30 to 35 degrees within colder mountain valleys, with frost formation again from the Norton-Coeburn Valley ( generally light ) into higher basins of the High Knob Massif ( where spring rebirth has been relatively limited by cold March-April nights ). 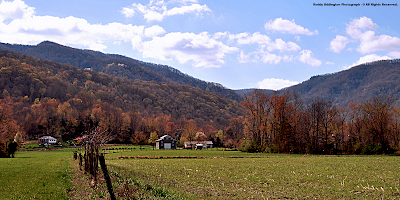 Amid continued dry air, AM mins into April 13 dipped into lower-middle 30s in colder mountain valleys within & adjacent to the High Knob Massif ( illustrating the true nature of spring time in high mountain basins ). The lower elevations of Powell Valley, just above 1600 feet, have taken on colorations reminiscent of autumn as a diverse mixture of many tree species emerge from winter dormancy. This is in contrast to limited emergence in trees above 3000 feet, as cold nights have dominated mid-upper elevation valleys & basins for seven consecutive days. 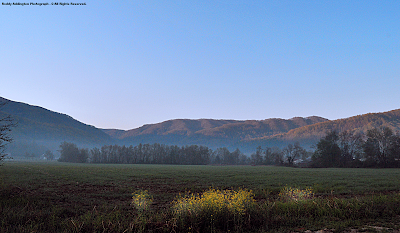 Morning minimums of 35 to 40 degrees were common within colder mountain valleys of the High Knob highcountry during April 14-15, to generate an interesting 7 day period with much above average temps by day and nights as cold as 30 to 35 degrees ( in the mean, several degrees lower than in Norton within colder locations of the High Knob highcountry ). The blueness of mountain walls against the greening Valley, with lingering patches of golden sage grass, never fails to be stunningly beautiful beneath azure skies & fair-weather cumulus! Minimums as cold as lower-middle 20s occurred within the lofty mountain basins of the High Knob highcountry, with a prolonged period of below freezing conditions ( 6-10+ hours ). Mean temperatures during the first 20 days of April have varied wildly between morning & night, with 35 to 40+ degree spreads being common in mountain valleys. Mean daily temps within the High Knob Massif have varied from 60s to around 70 degrees by day to chilly 30s at night ( low-mid 30s in colder valleys above 2300 feet ). It is interesting to note that in the region mean daily maxs at the following locations were all within the lower to middle 70s, much like the differences observed between Norton-Wise and Clintwood, during the April 1-20 period. Although mid-upper elevations, above the level of Norton, were generally 5 to 15 degrees cooler by day than the above sites, the greatest differences occurred at night amid lofty mountain basins ( within the 2400 to 3600 foot elevation zone ). [ Out of all of the above sites, only Lexington, Ky., reached 32 degrees during the recent cold spell ]. Lofty highcountry basins & cold air drainage corridors within and adjacent to the High Knob Massif, from the Norton-Coeburn Valley up into the high terrain, had average MINS which were some 10 to 20 degrees colder than these regional sites listed above during the April 1-20 period. 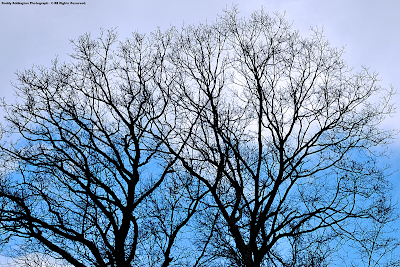 A simply HUGE difference in nocturnal coldness! [ The least difference was between the Norton Valley, and locations like Clintwood, verses the Tri-Cities recording site where nocturnal cold air drainage and pooling is also a factor ]. Such differences as noted above illustrate the major forces ( climatic ) at work behind variations in spring renewal which are so visually dramatic between the foothills, Great Valley, and higher mountain locations during this time each year! Jimmy Fawbush captured a magnificent sunset, after a few hours of trout fishing at Norton's Upper Reservoir, when he stopped at majestic Flag Rock Recreation Area. Photograph by Jimmy Fawbush - © All Rights Reserved. Wow, that's a nice way to close out this update!